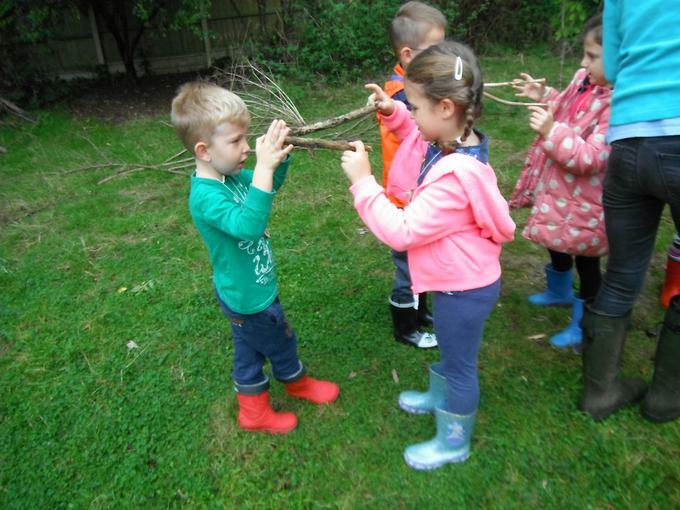 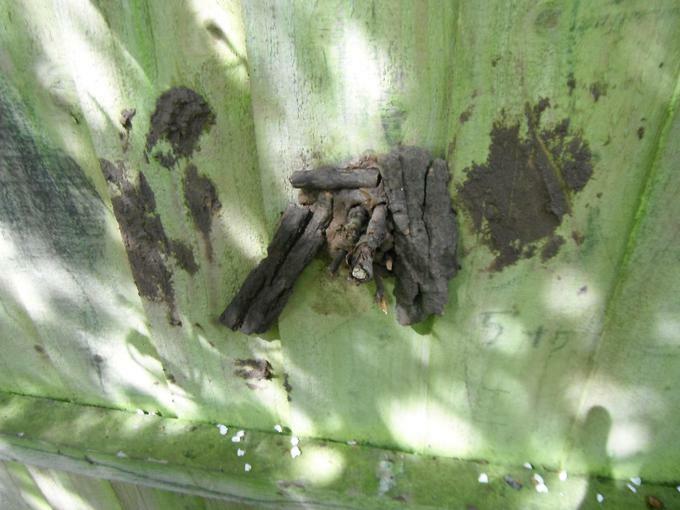 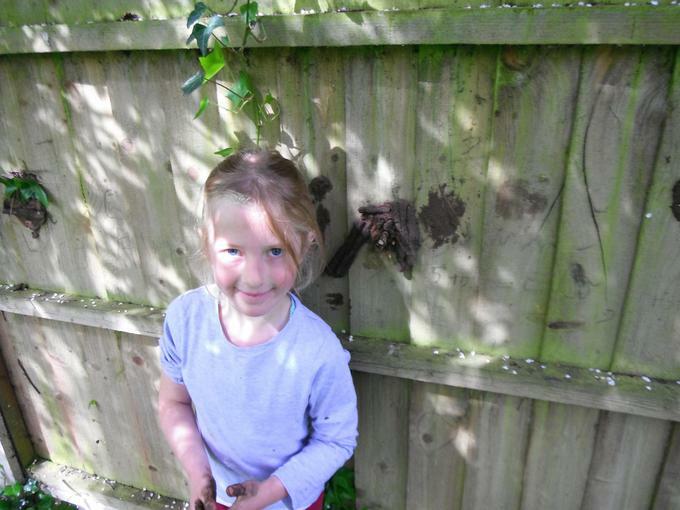 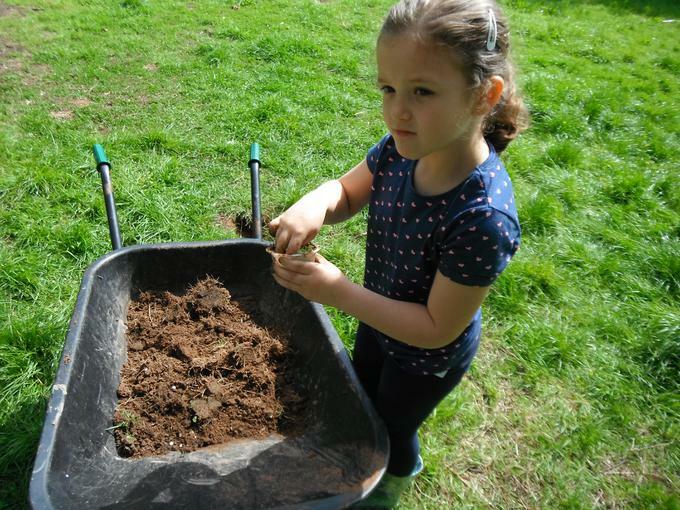 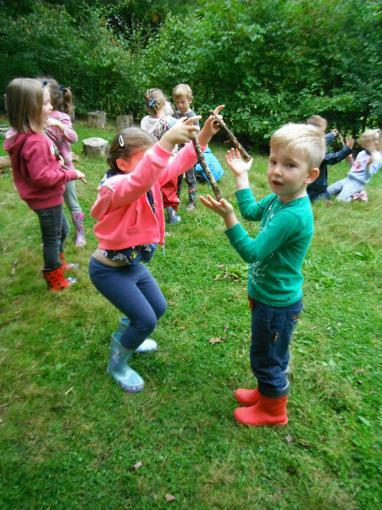 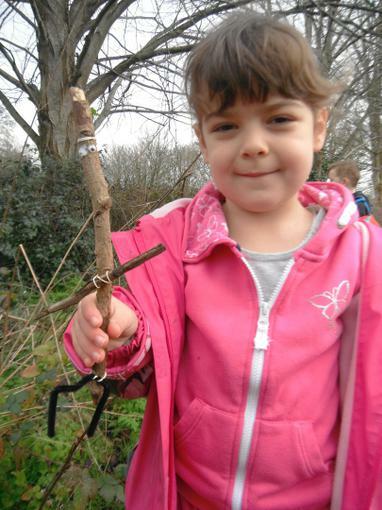 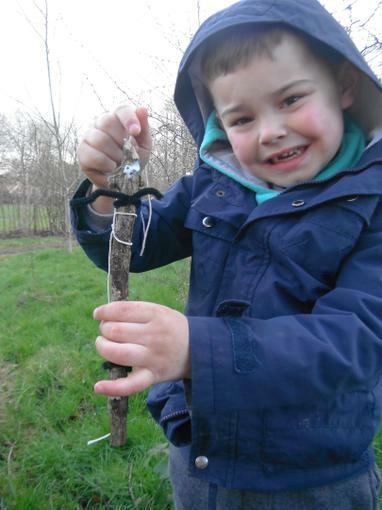 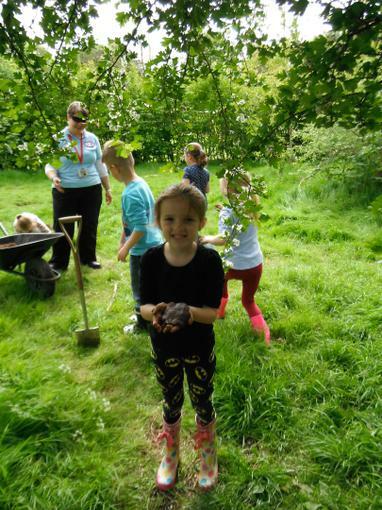 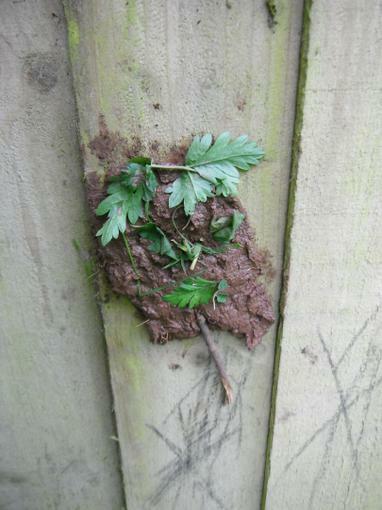 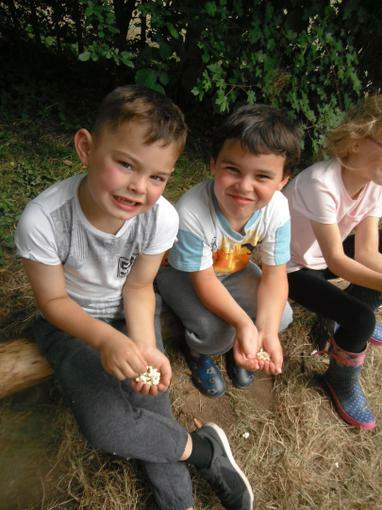 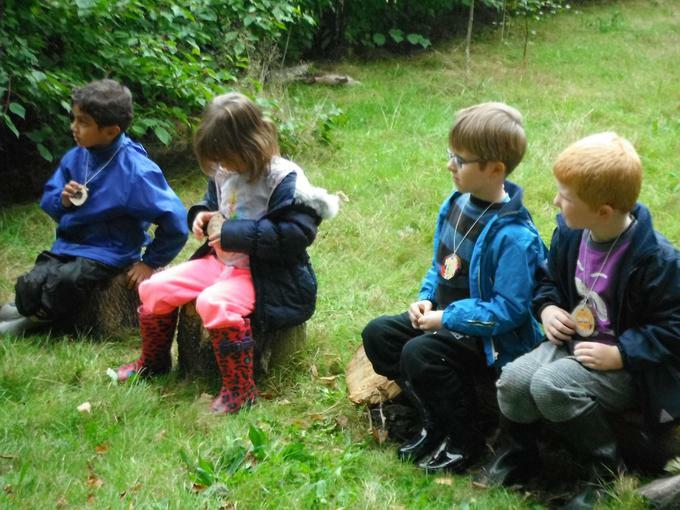 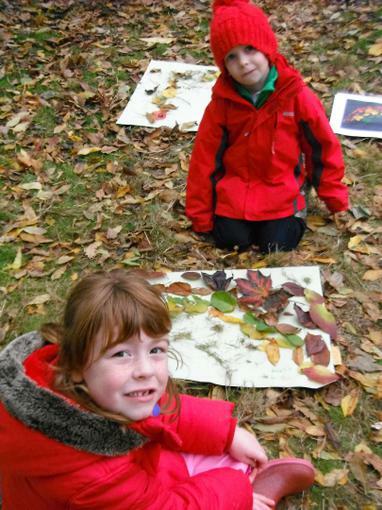 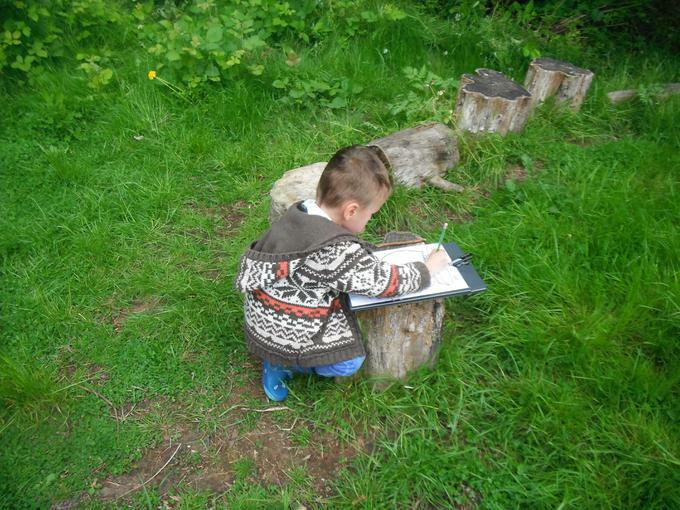 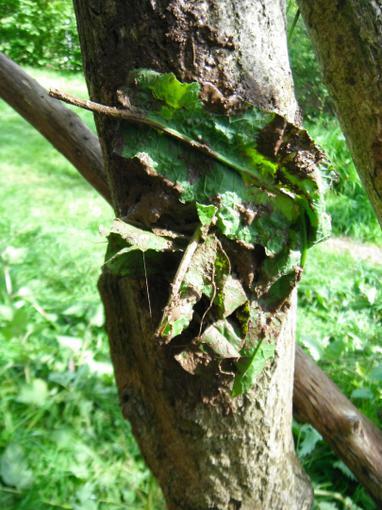 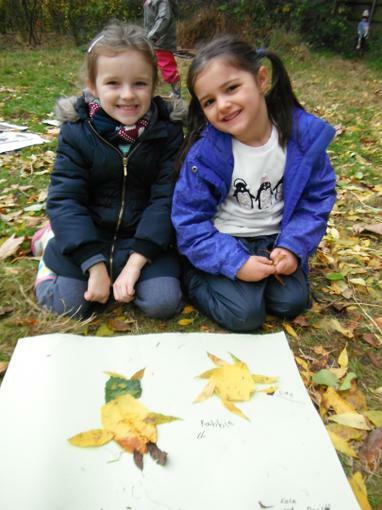 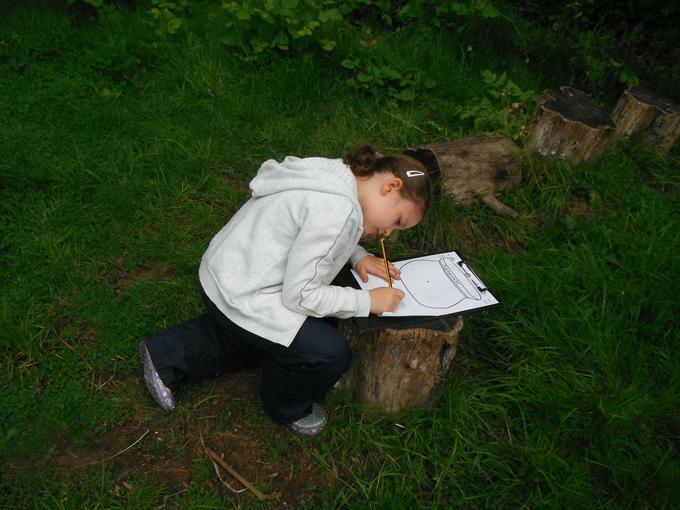 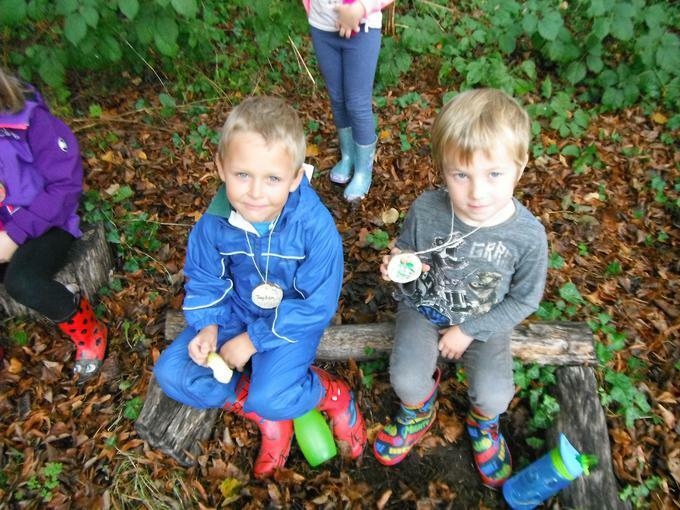 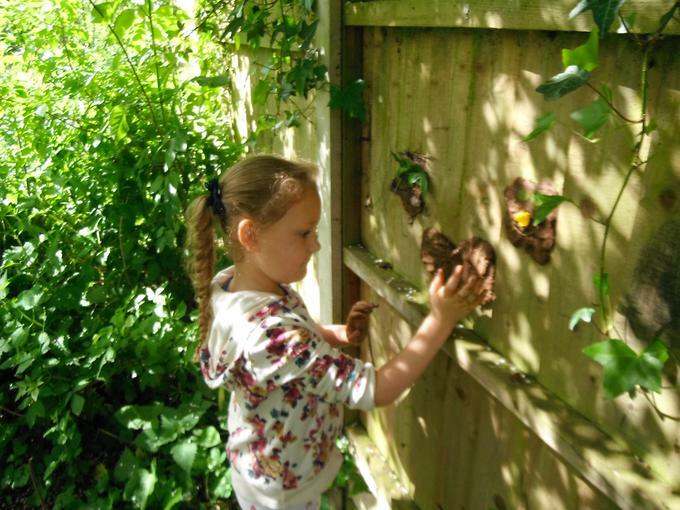 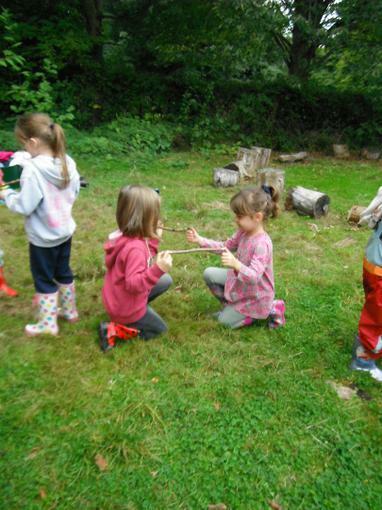 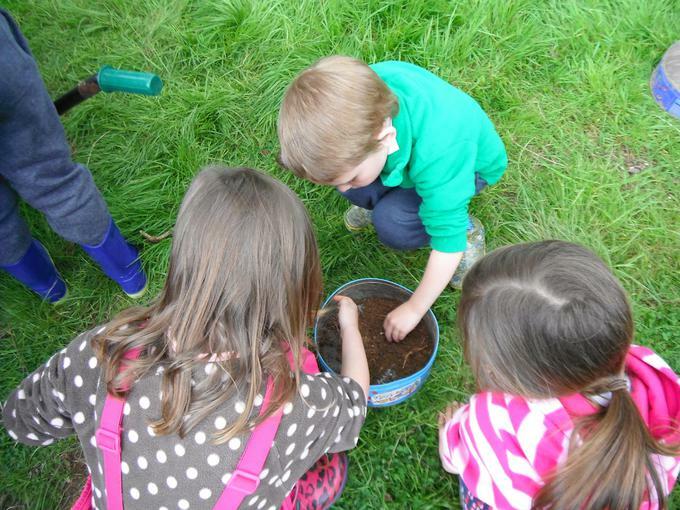 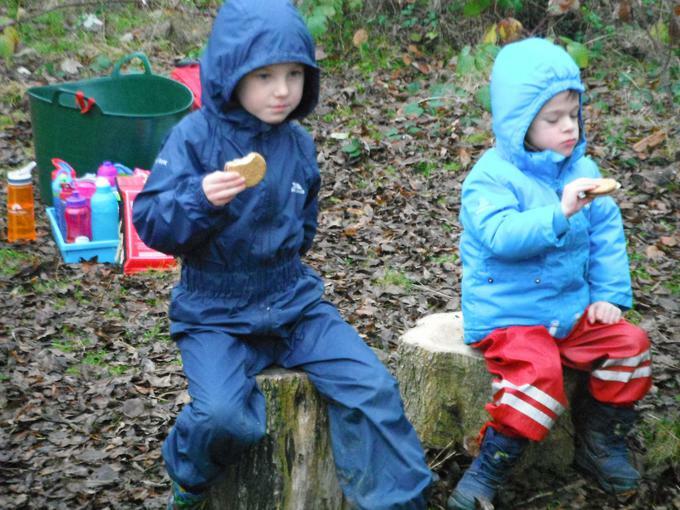 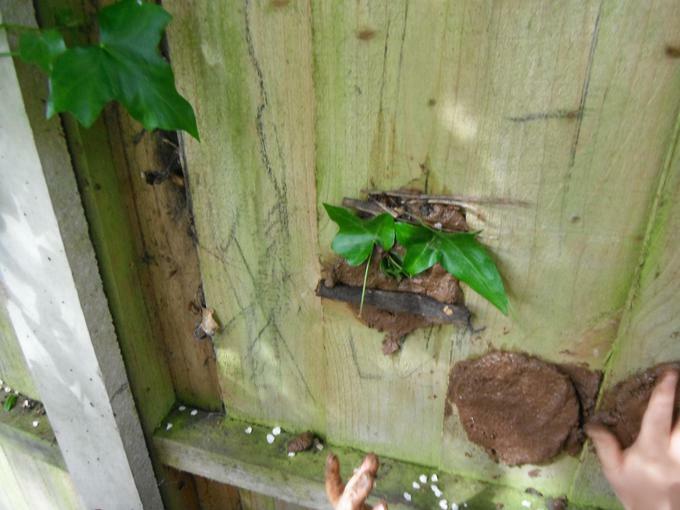 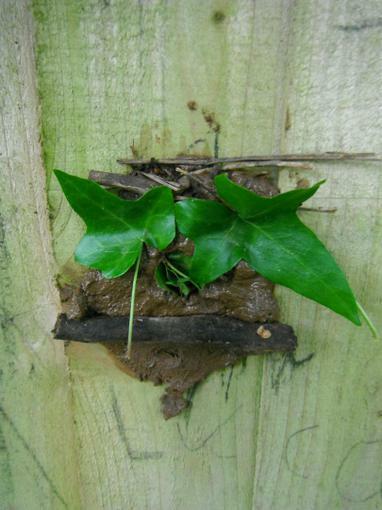 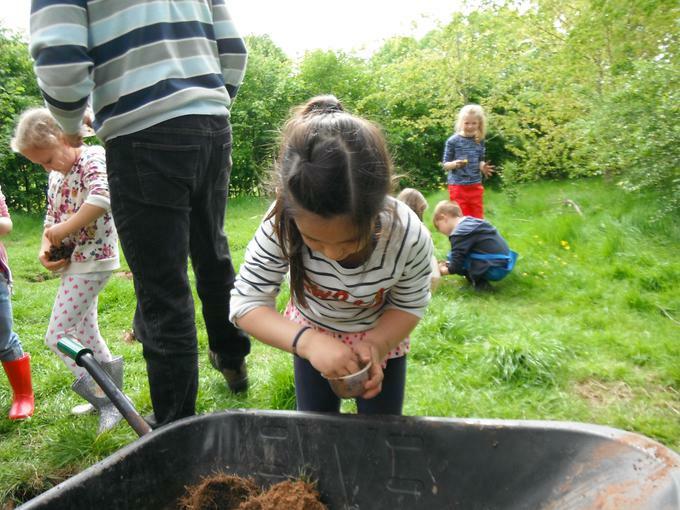 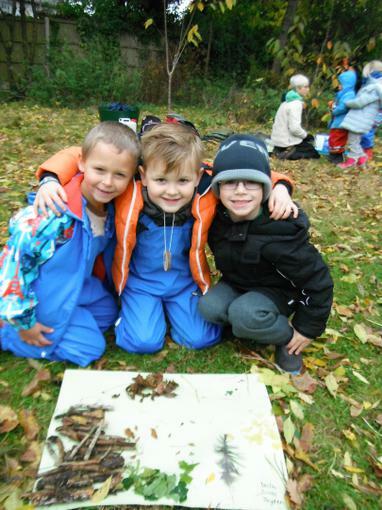 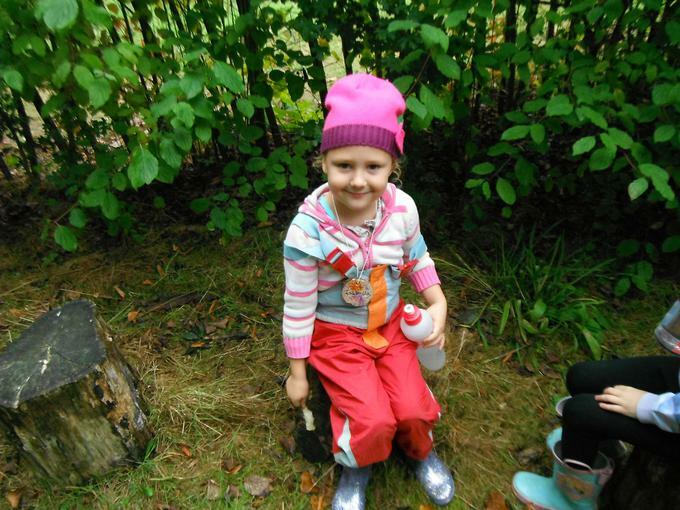 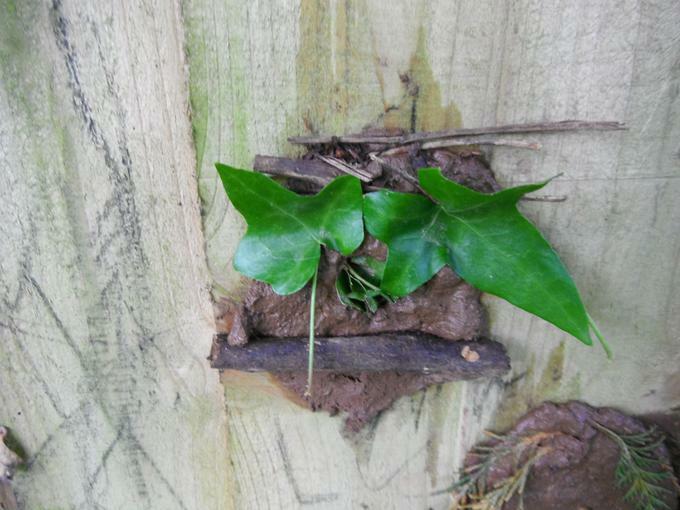 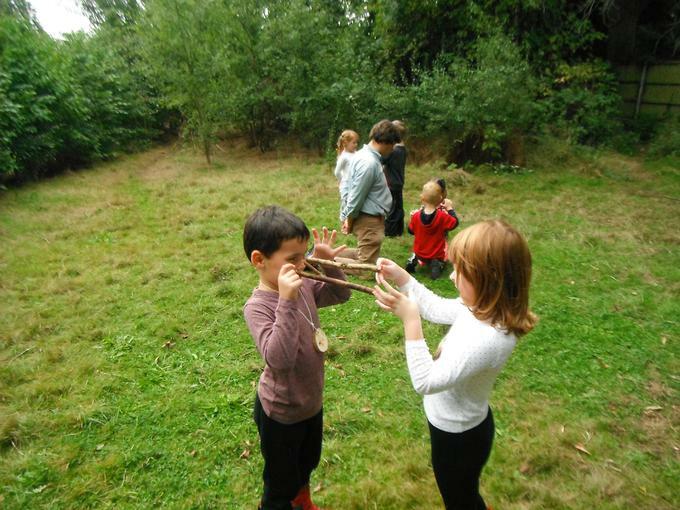 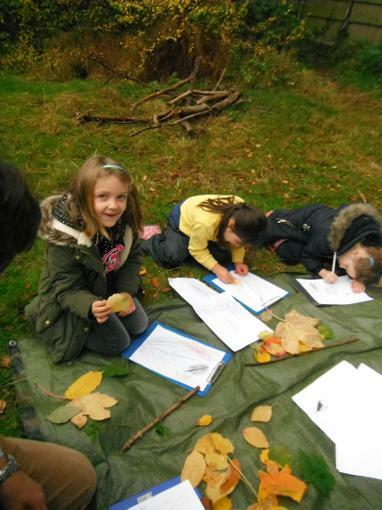 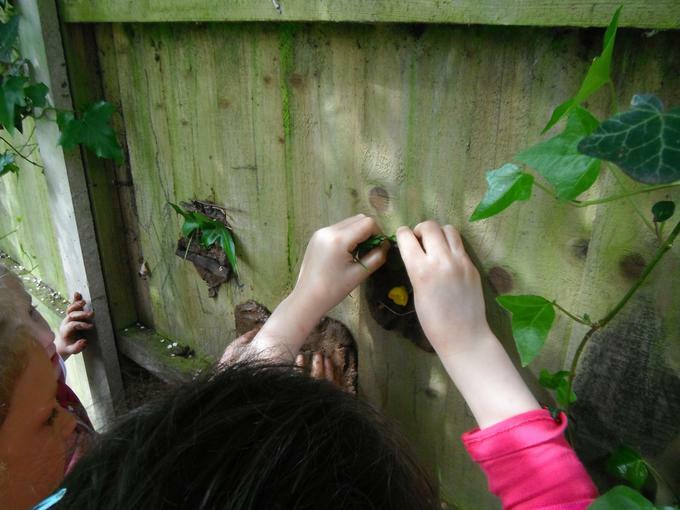 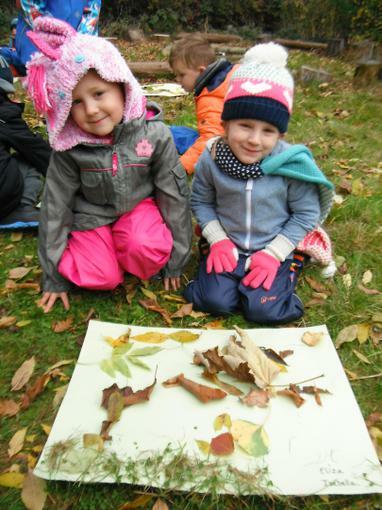 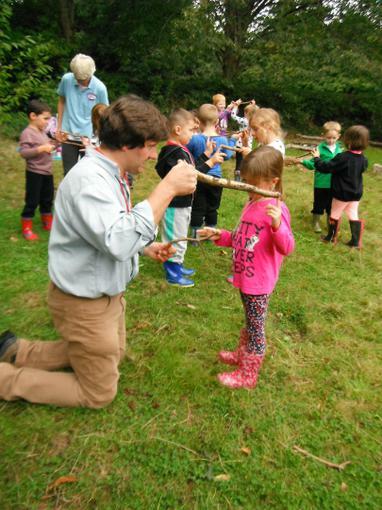 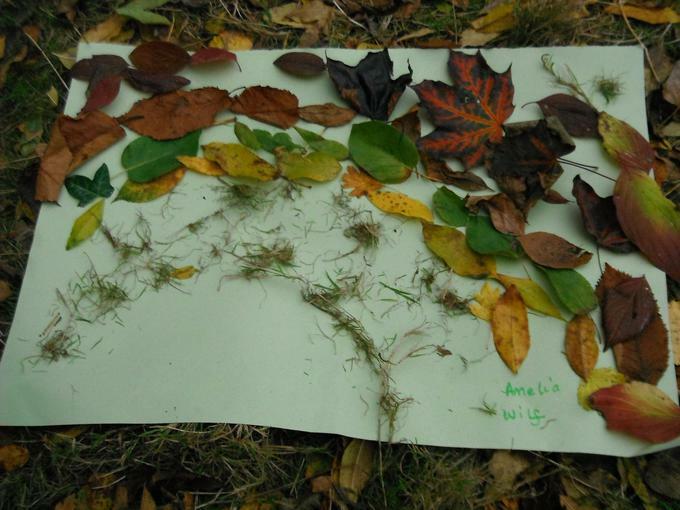 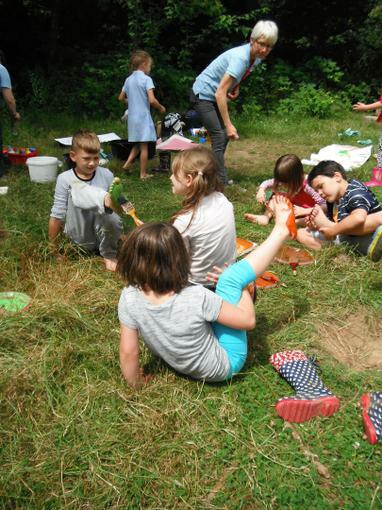 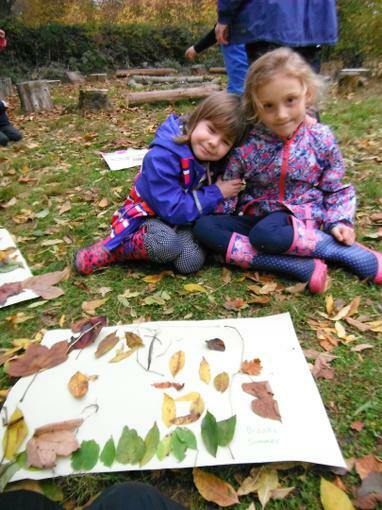 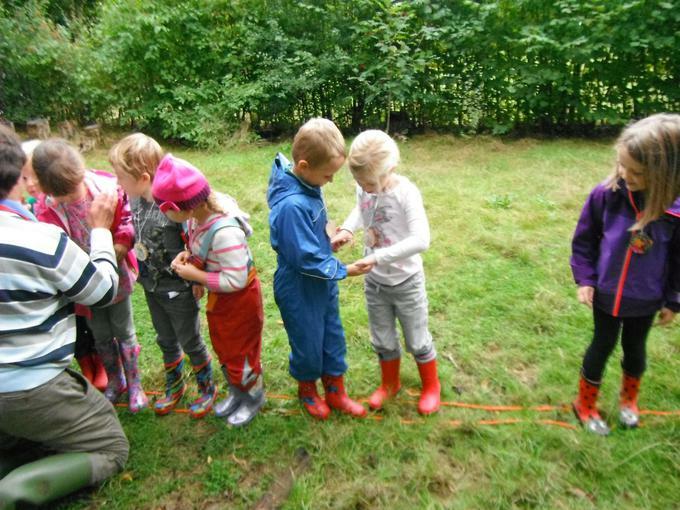 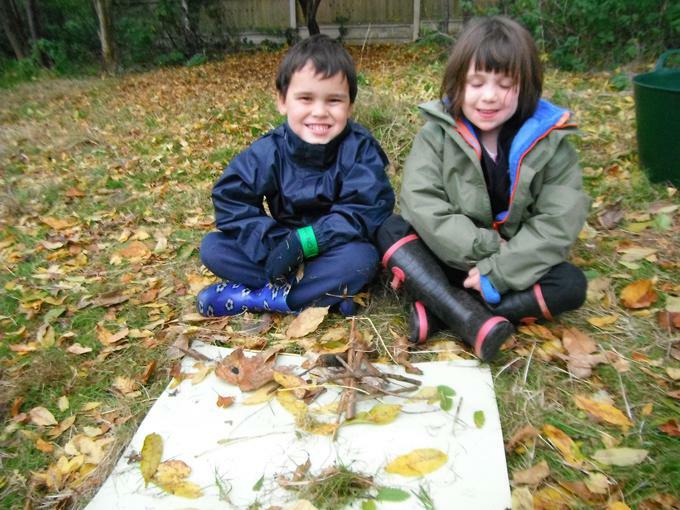 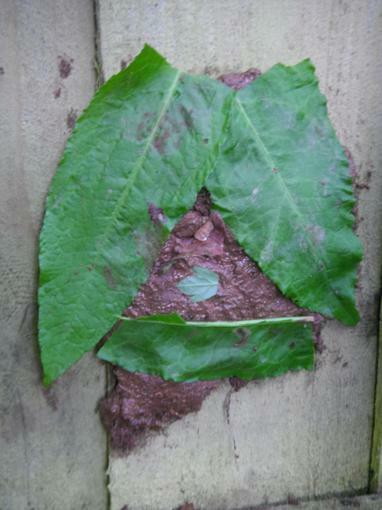 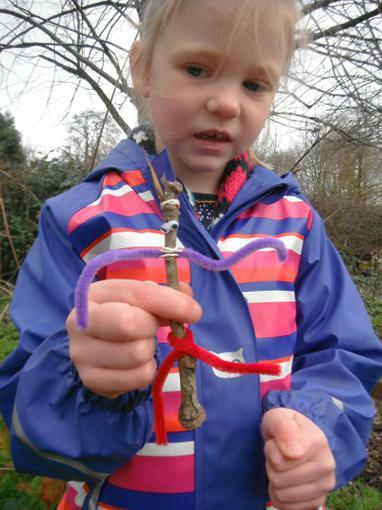 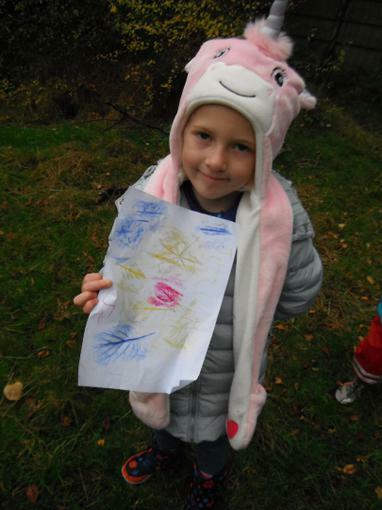 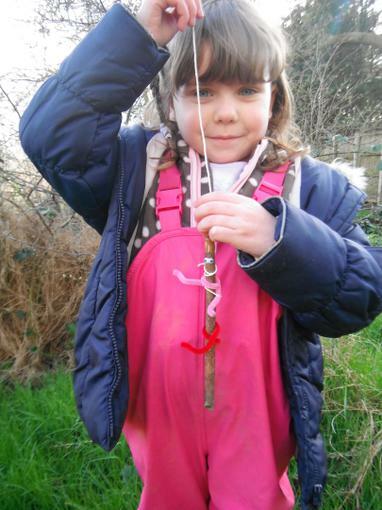 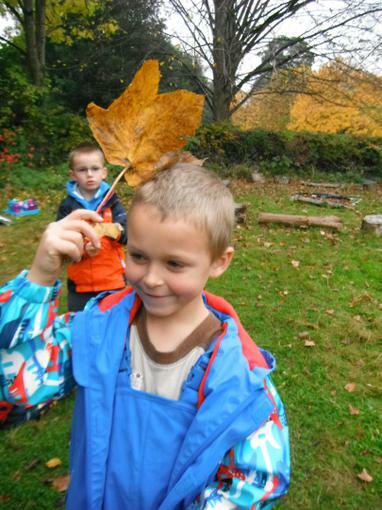 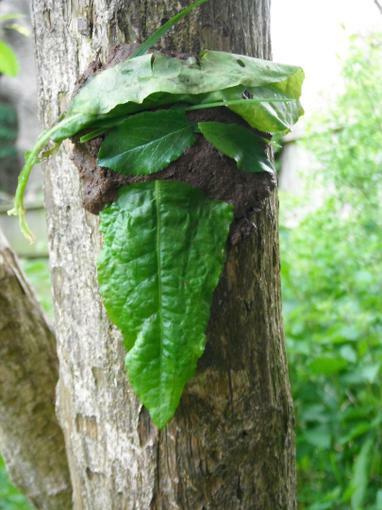 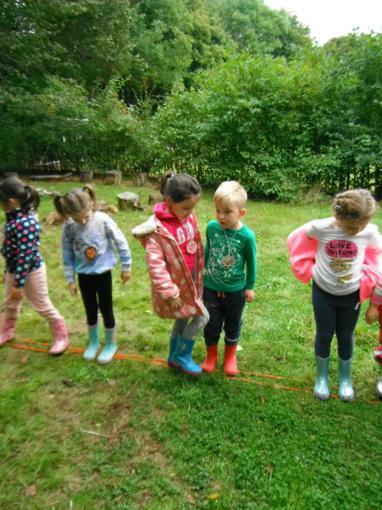 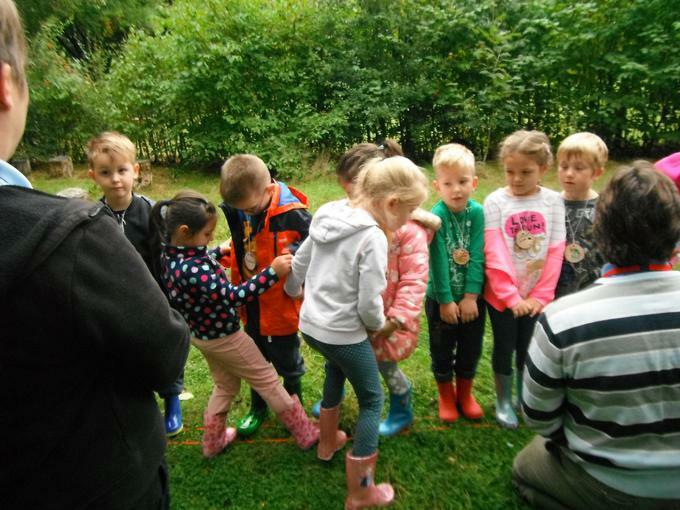 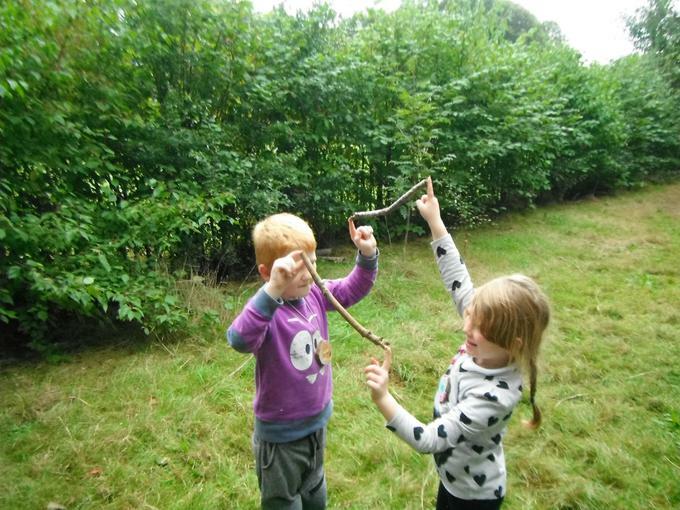 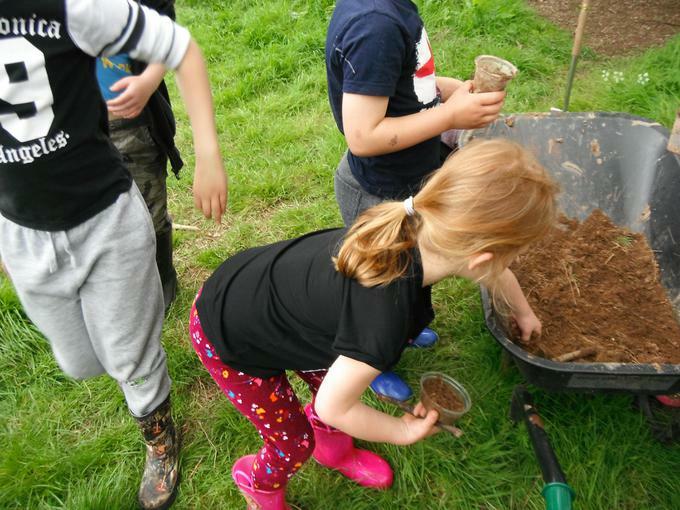 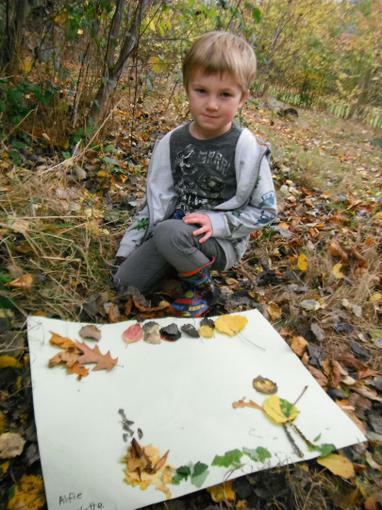 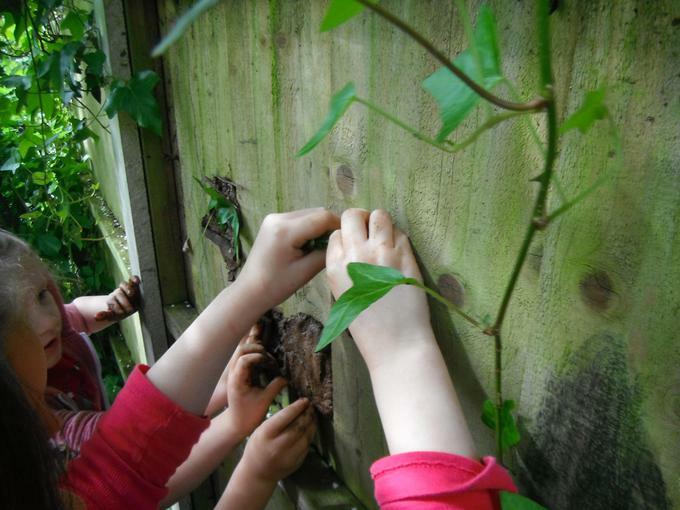 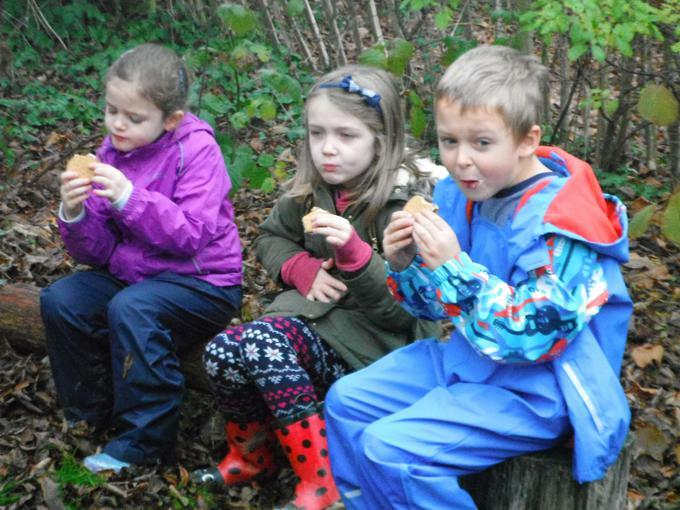 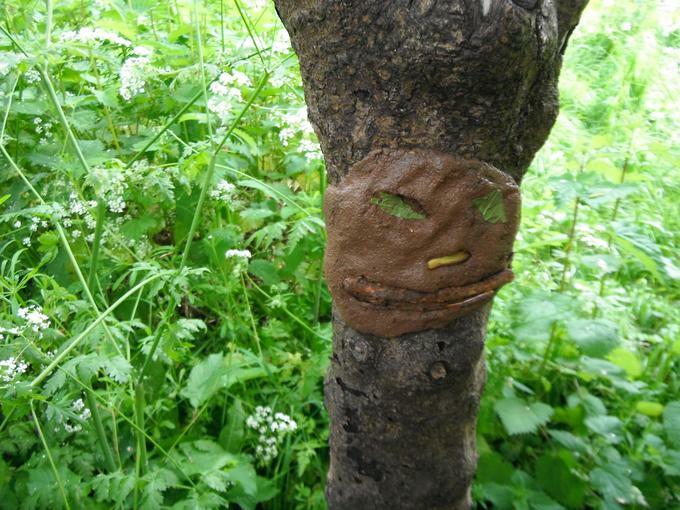 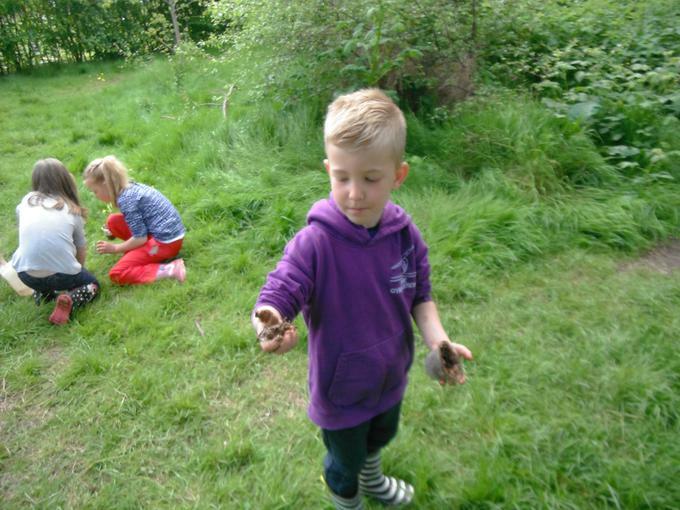 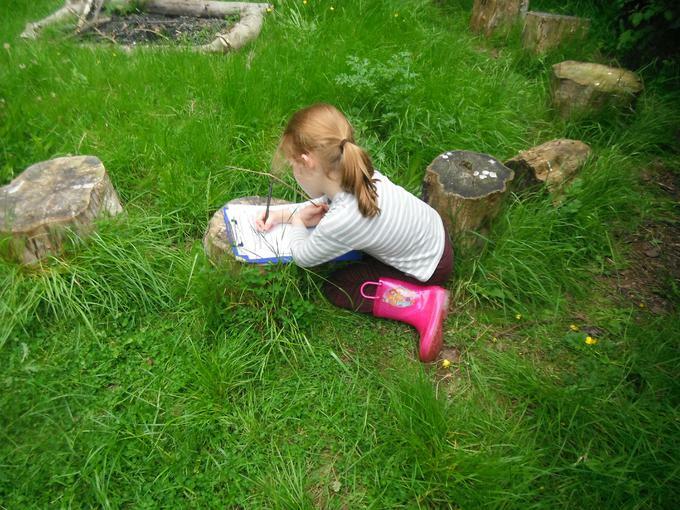 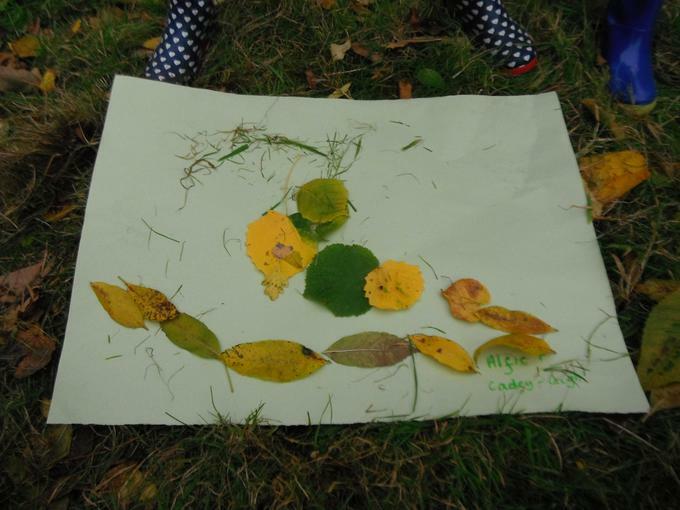 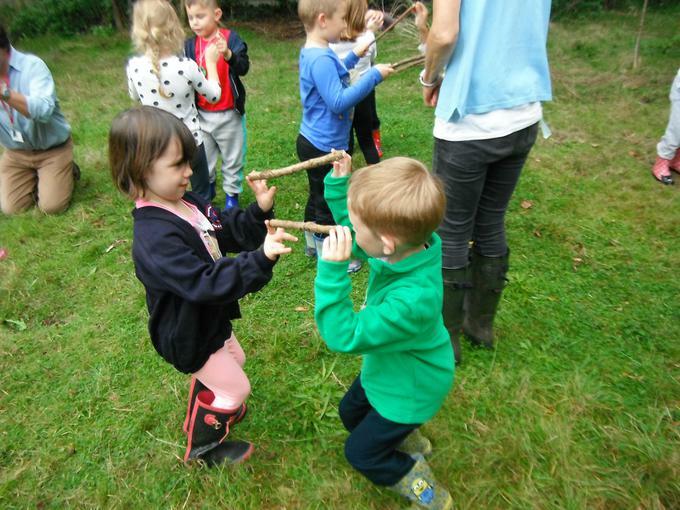 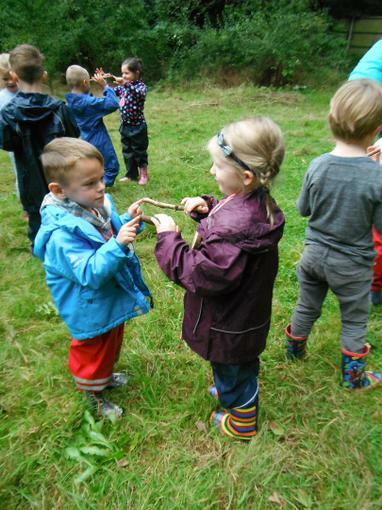 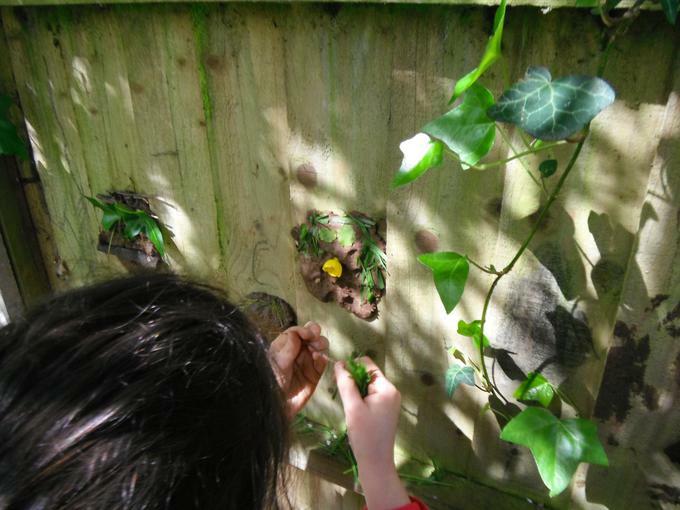 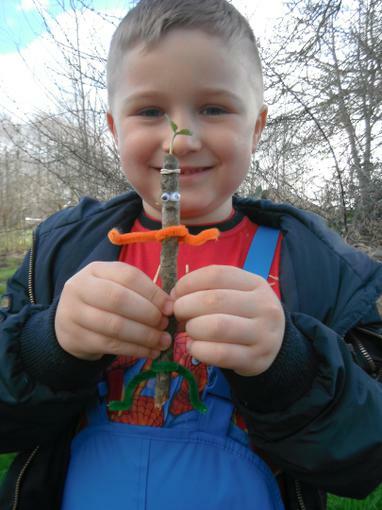 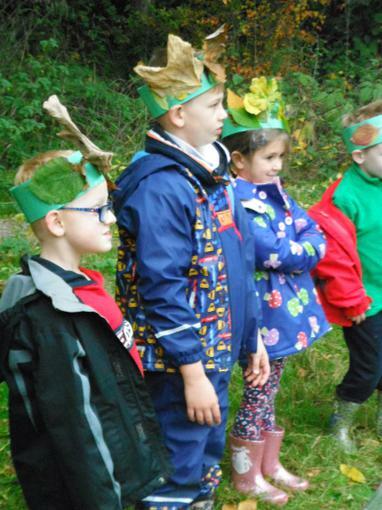 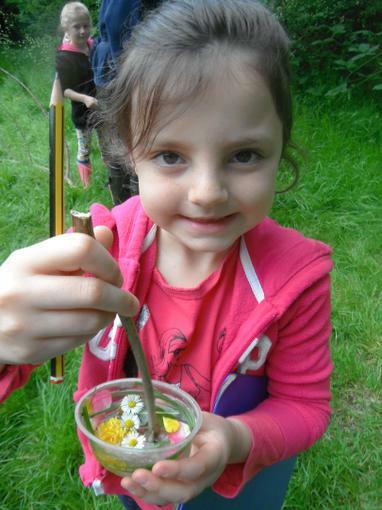 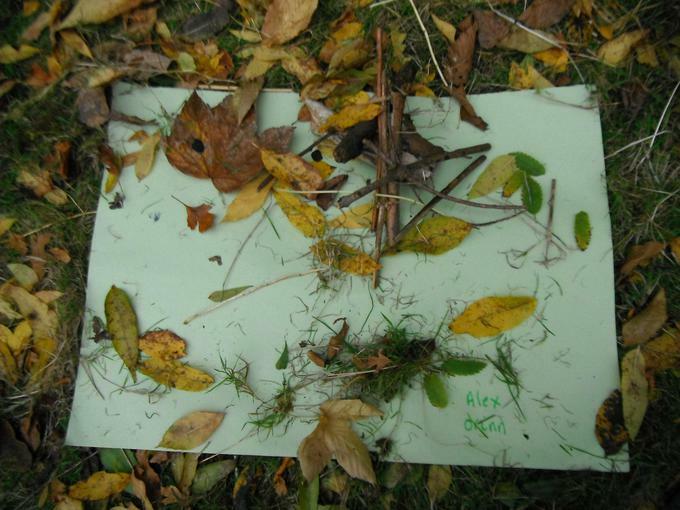 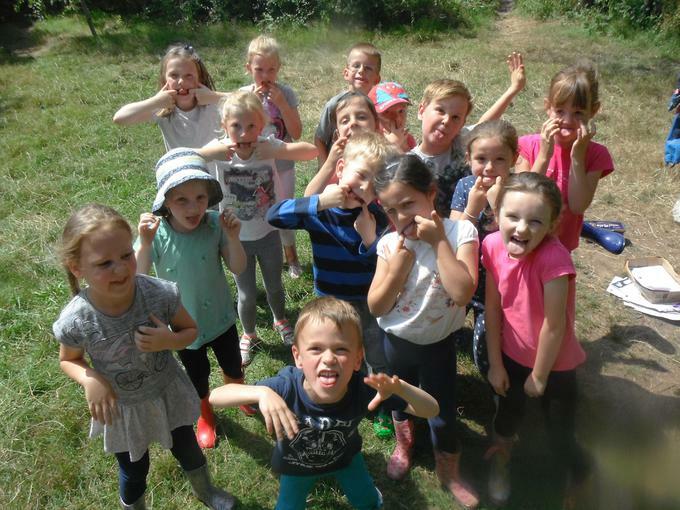 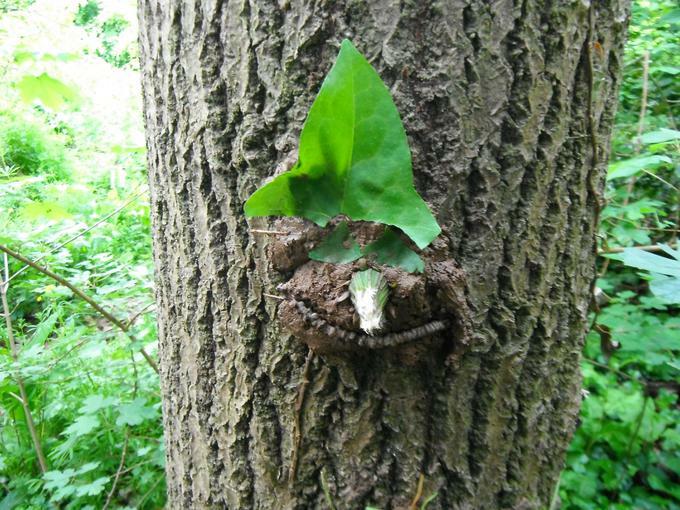 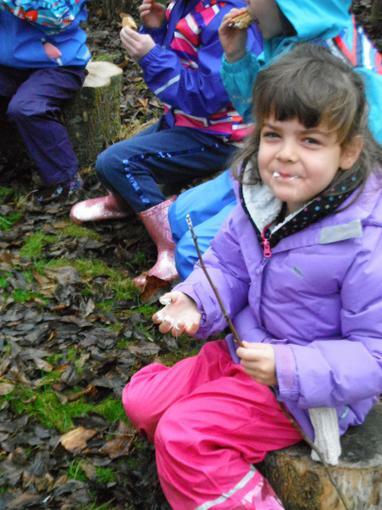 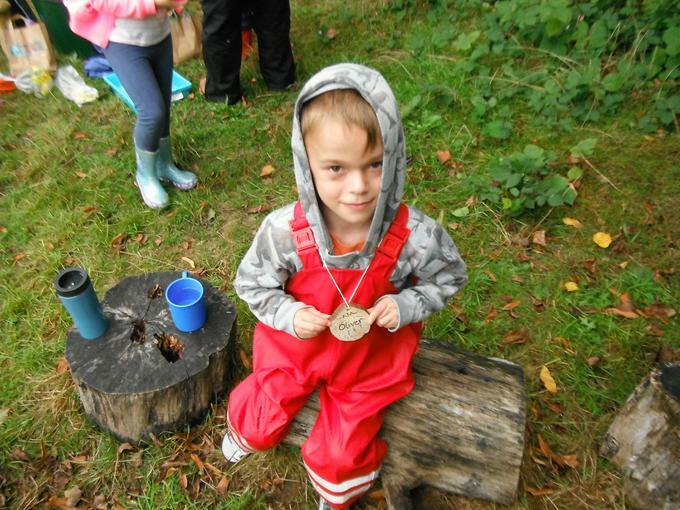 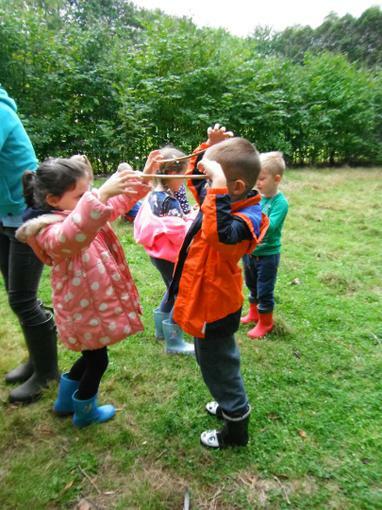 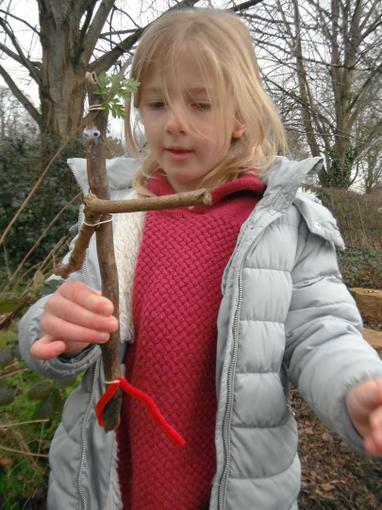 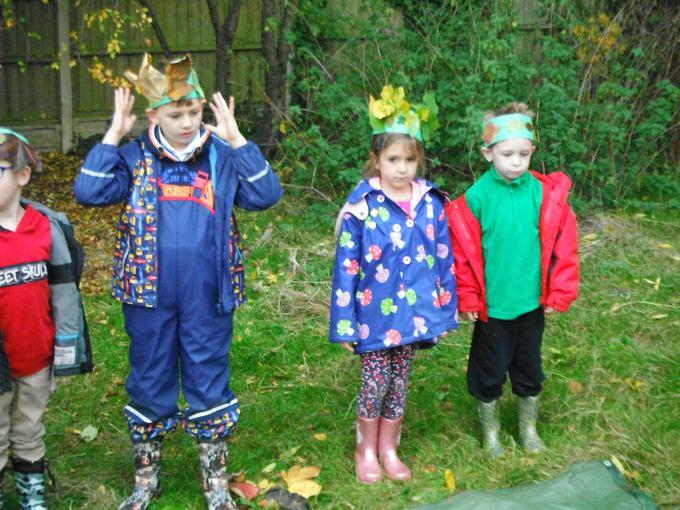 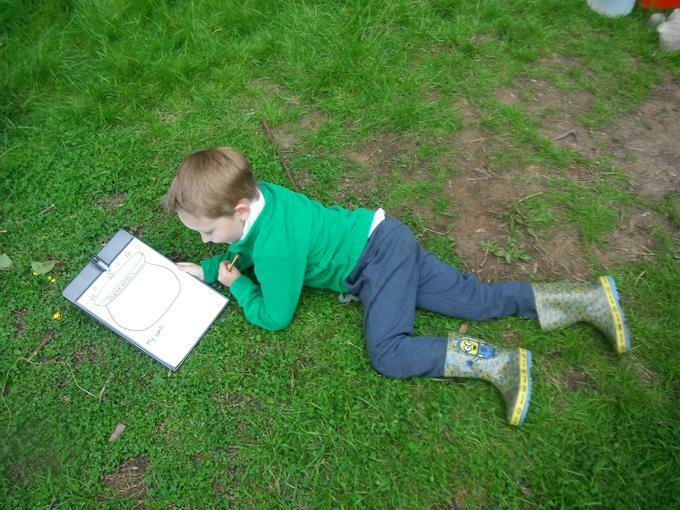 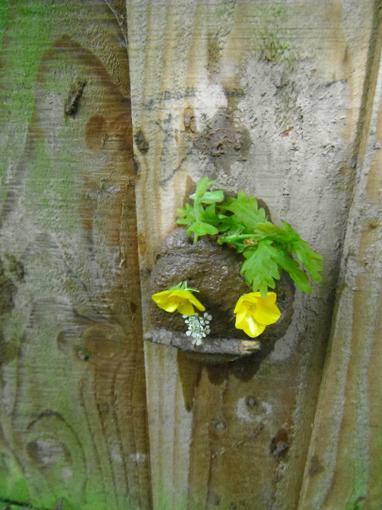 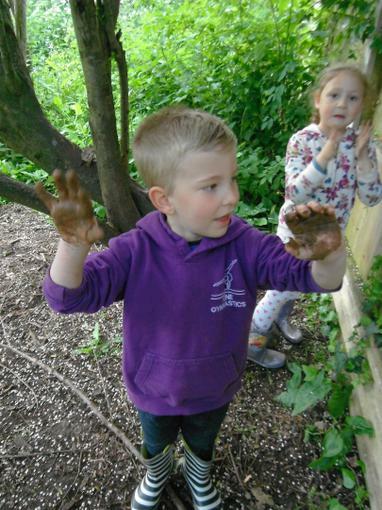 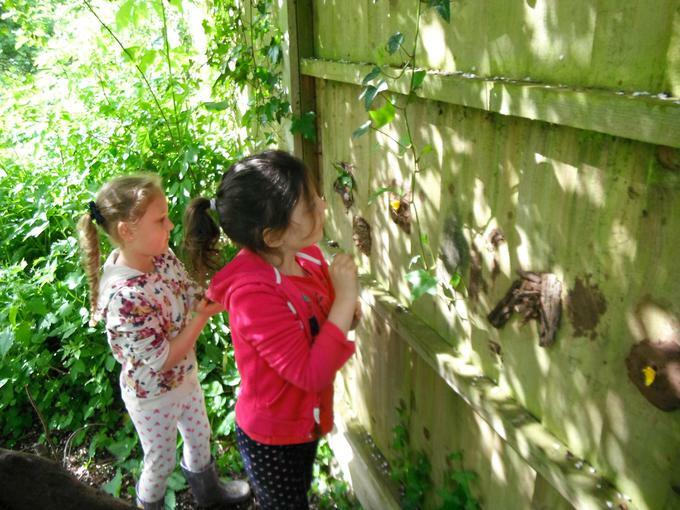 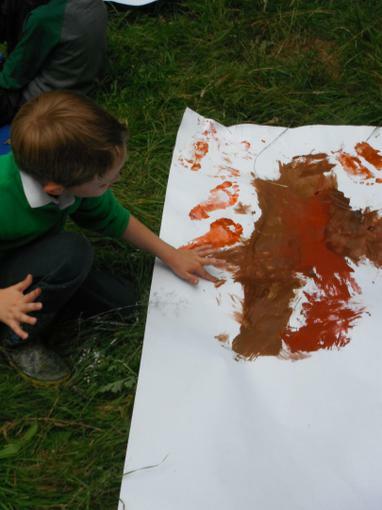 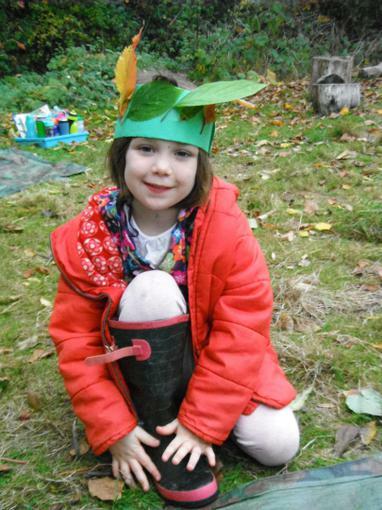 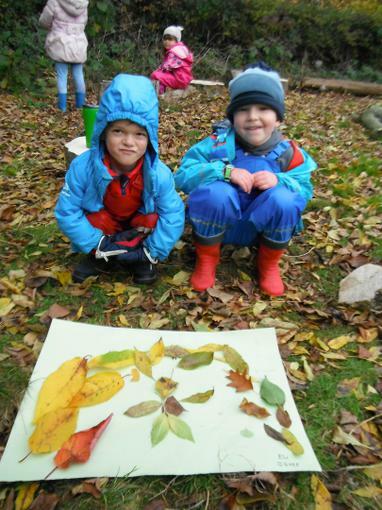 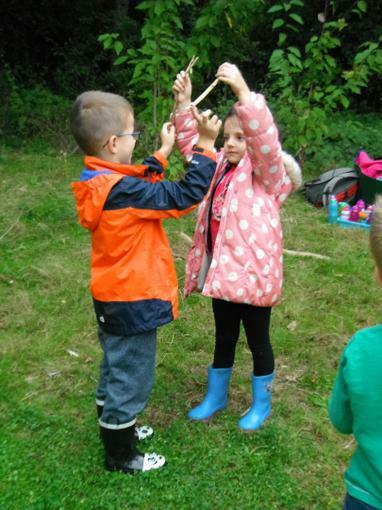 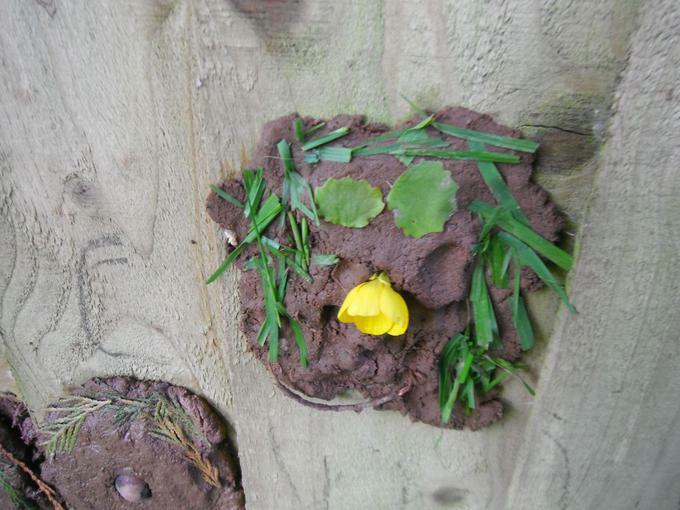 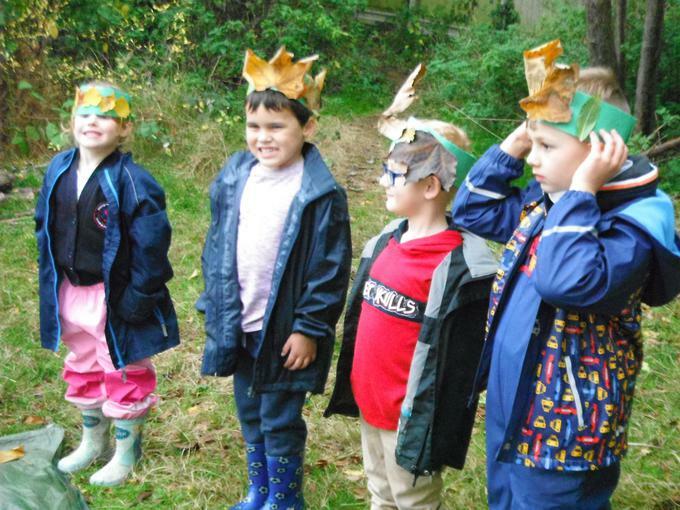 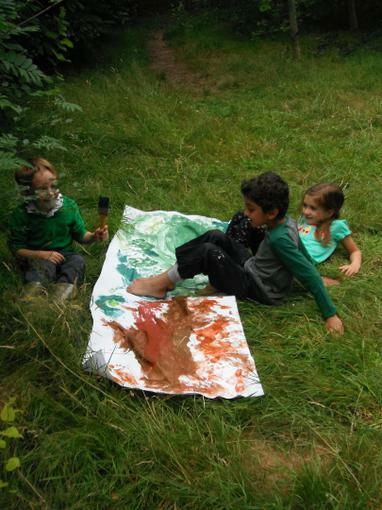 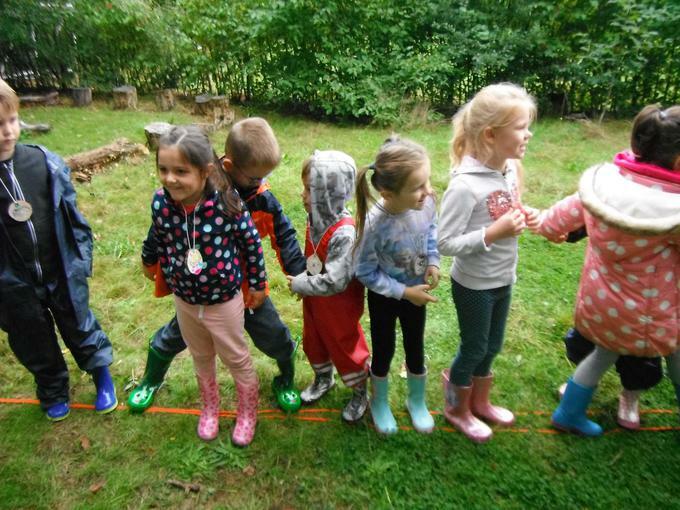 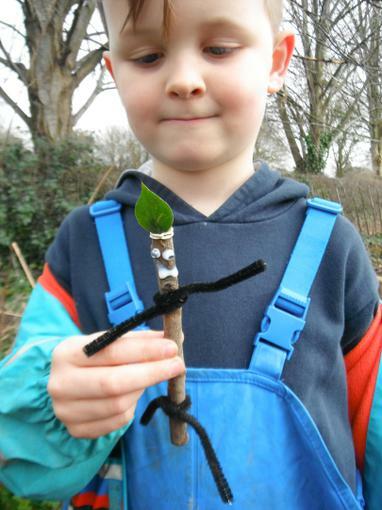 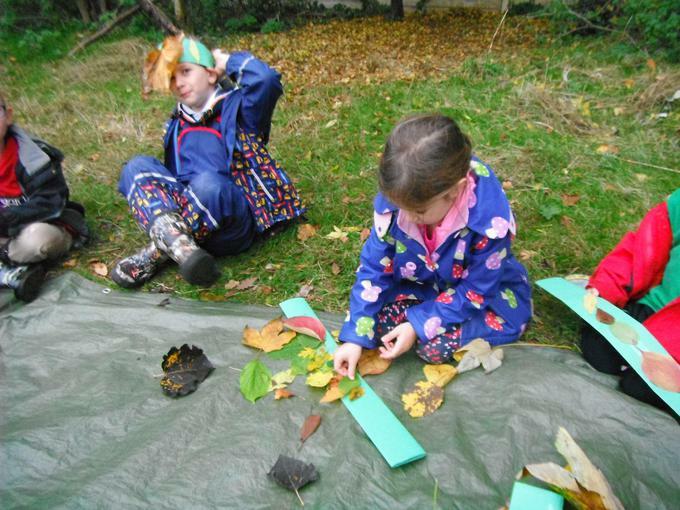 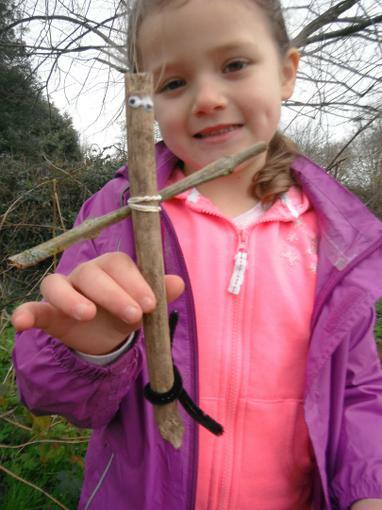 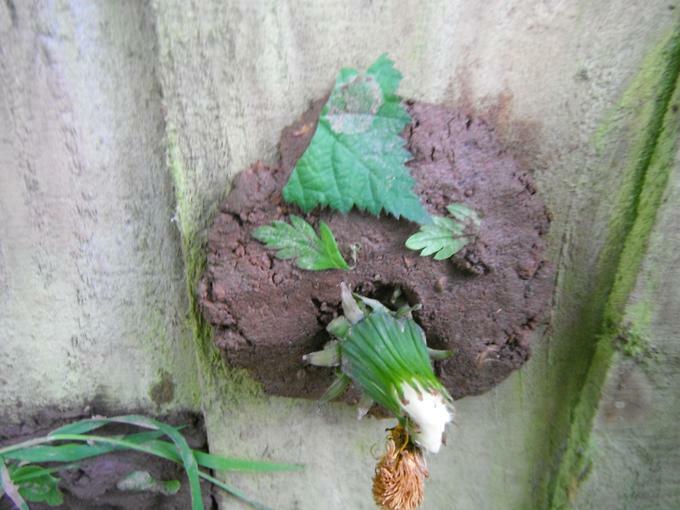 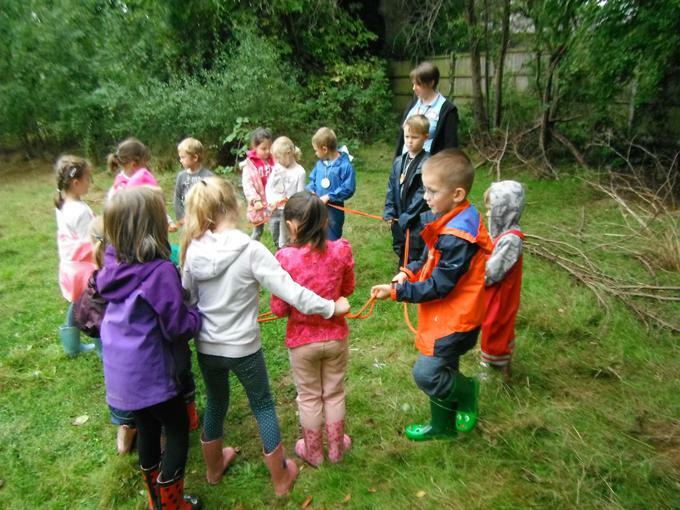 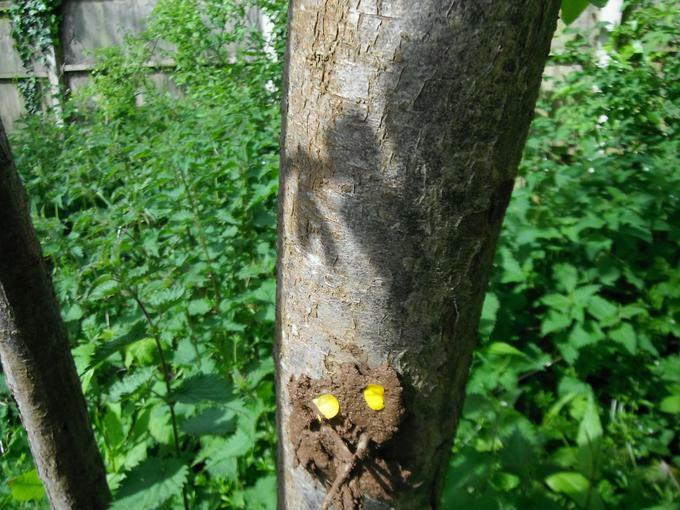 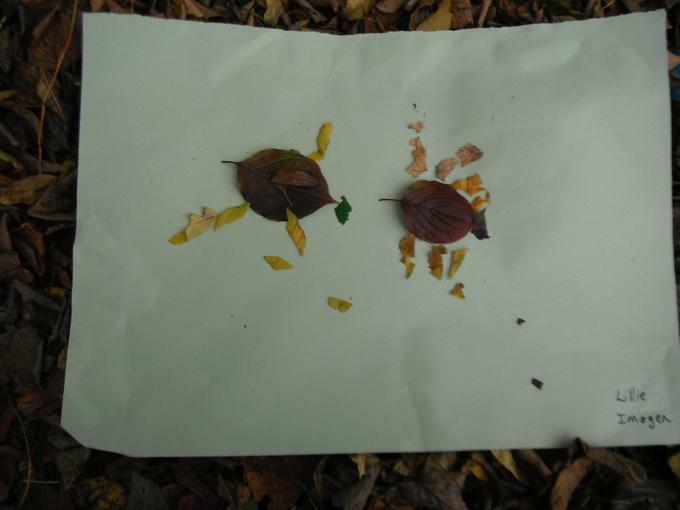 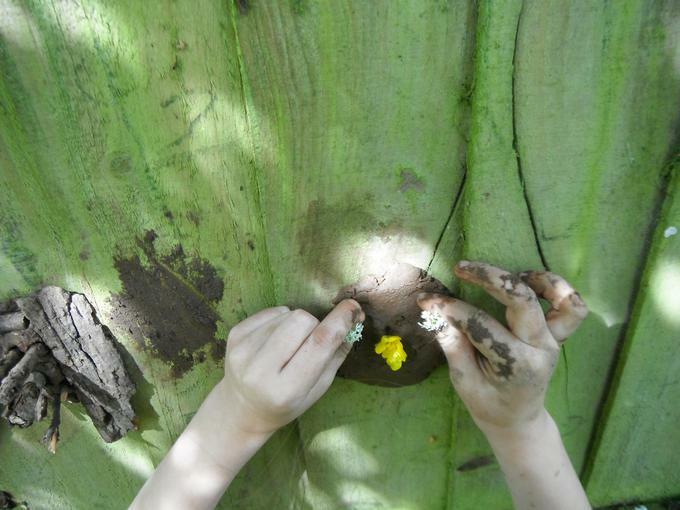 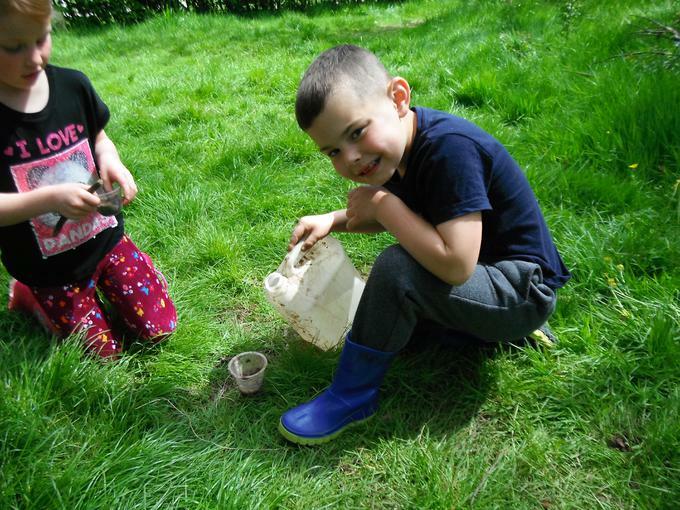 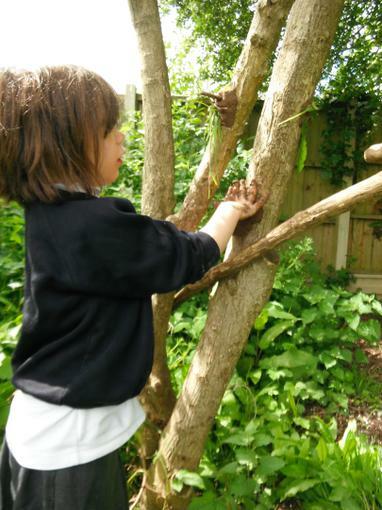 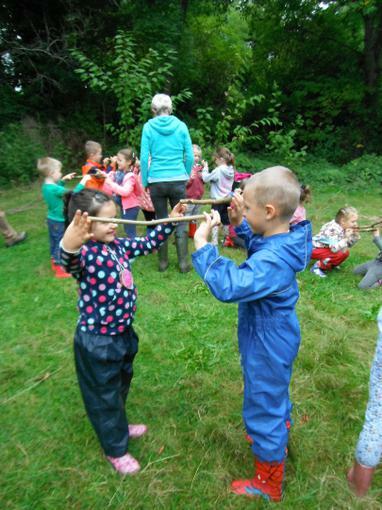 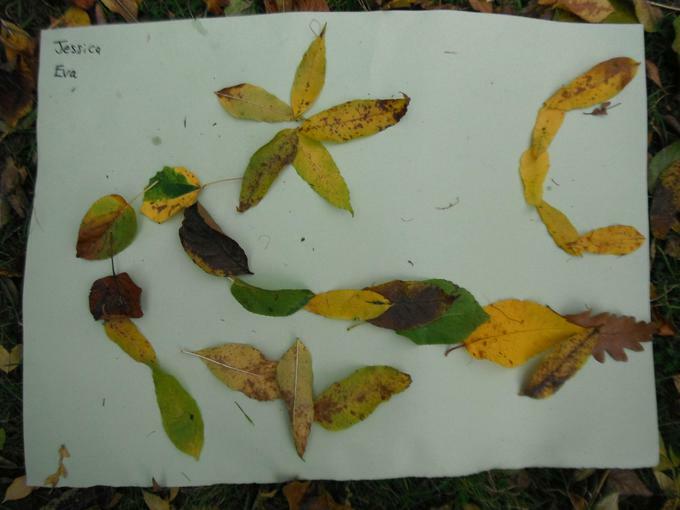 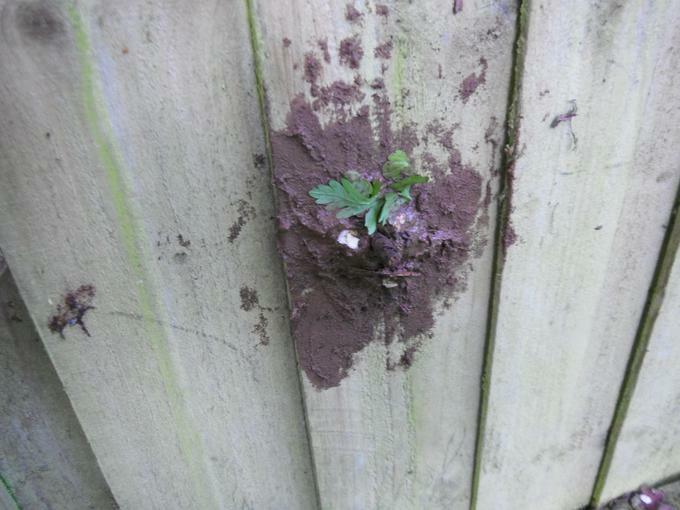 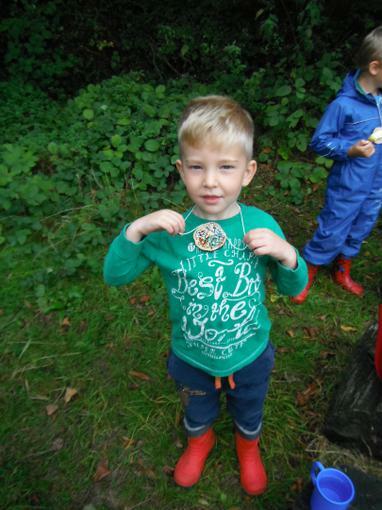 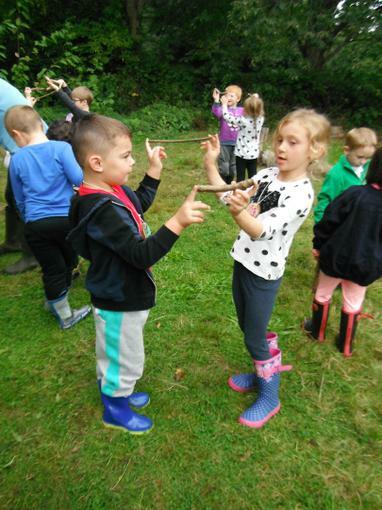 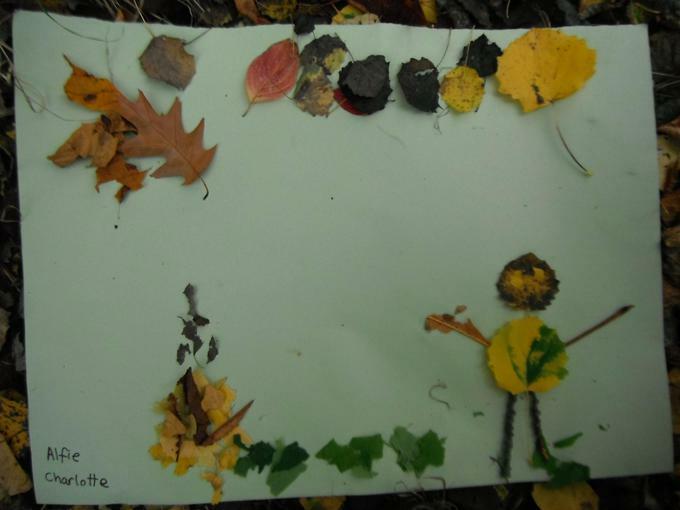 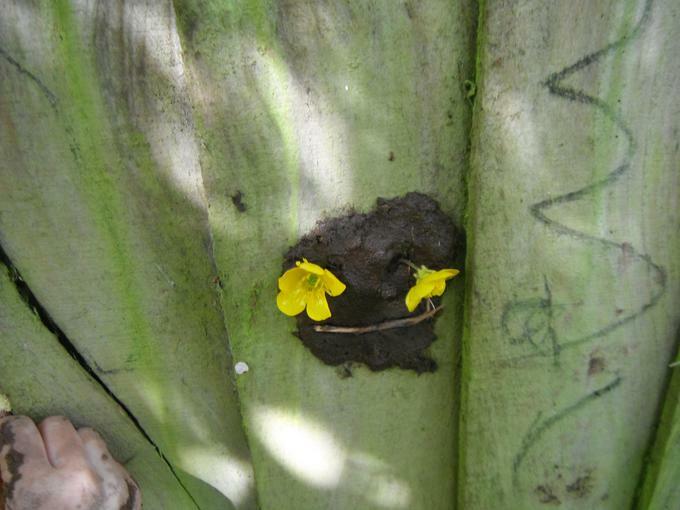 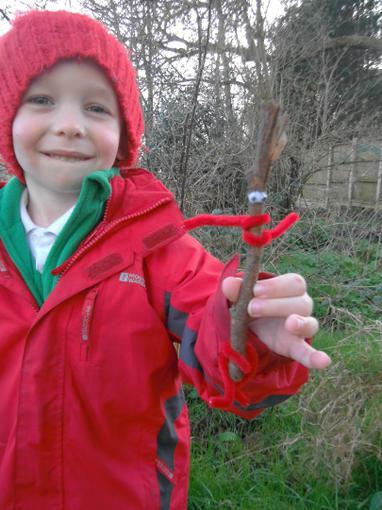 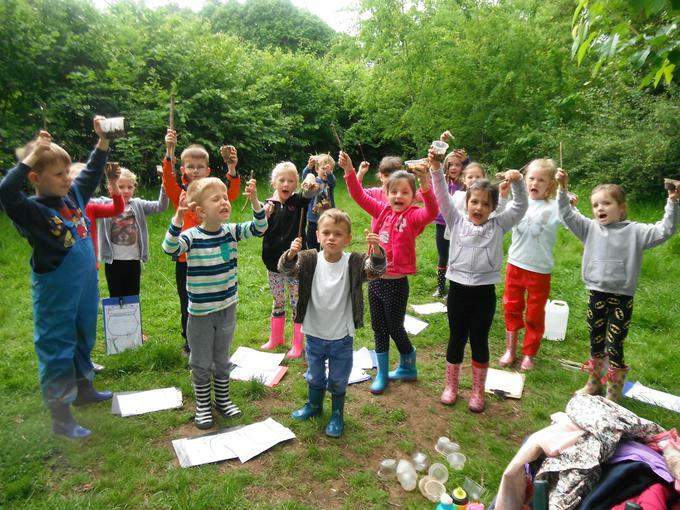 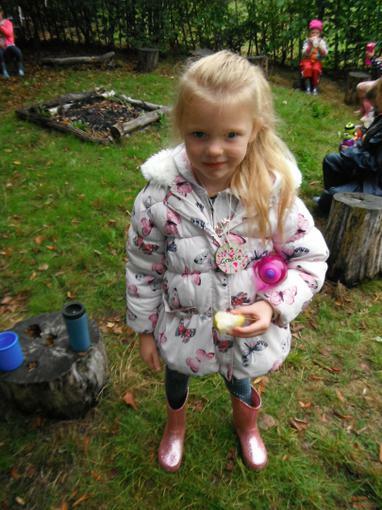 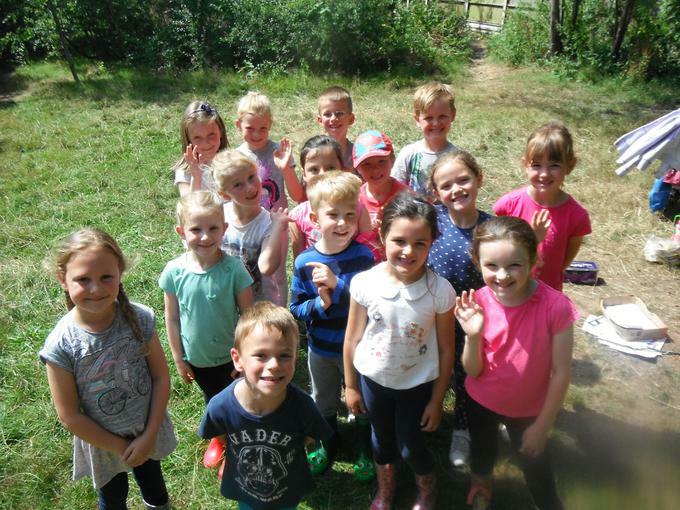 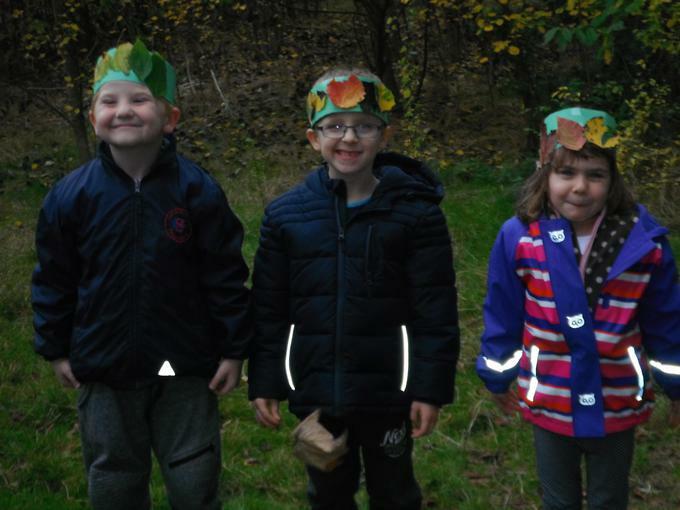 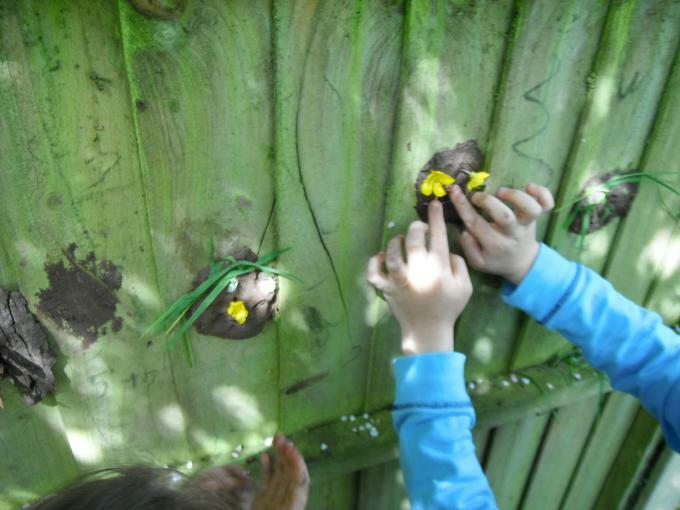 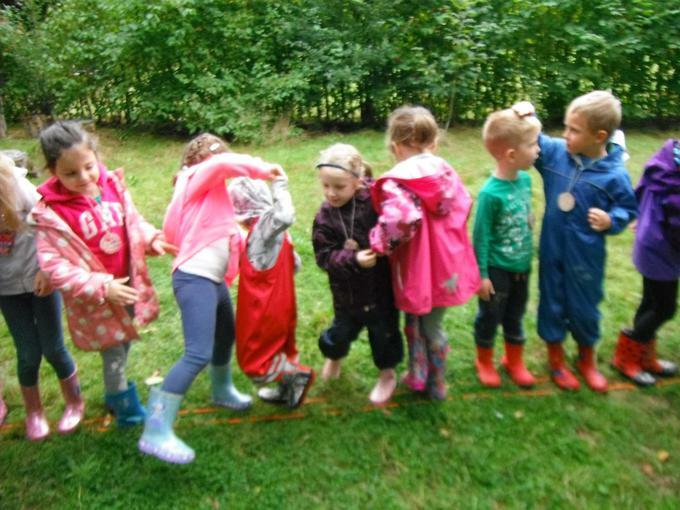 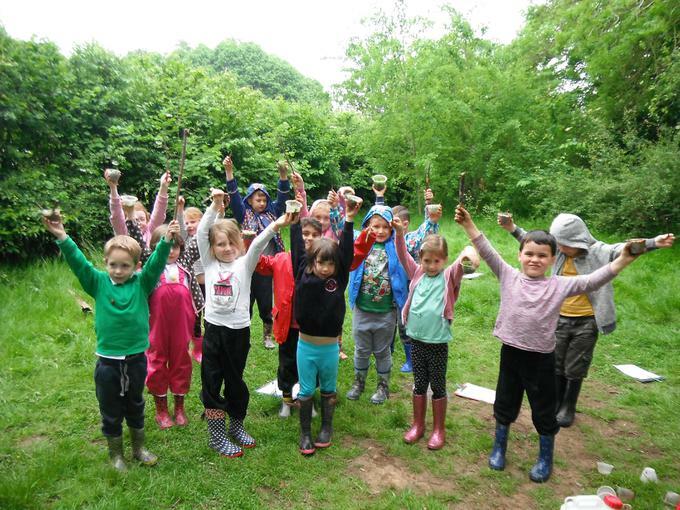 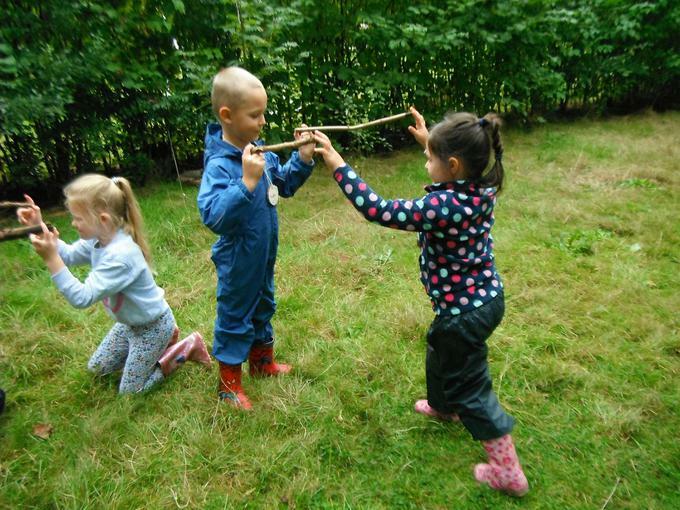 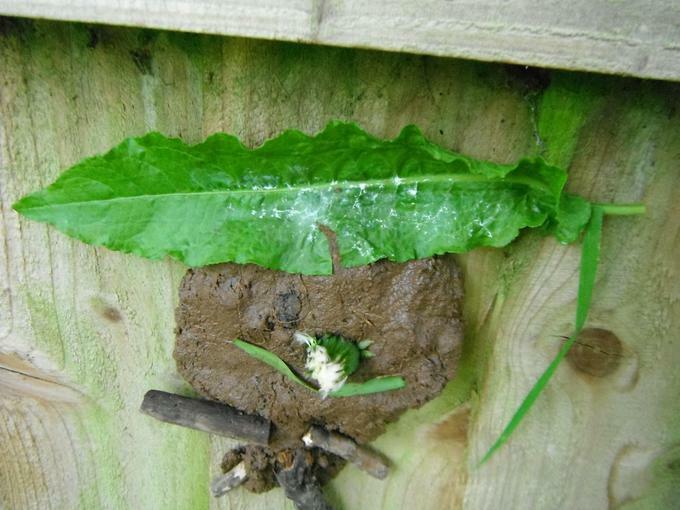 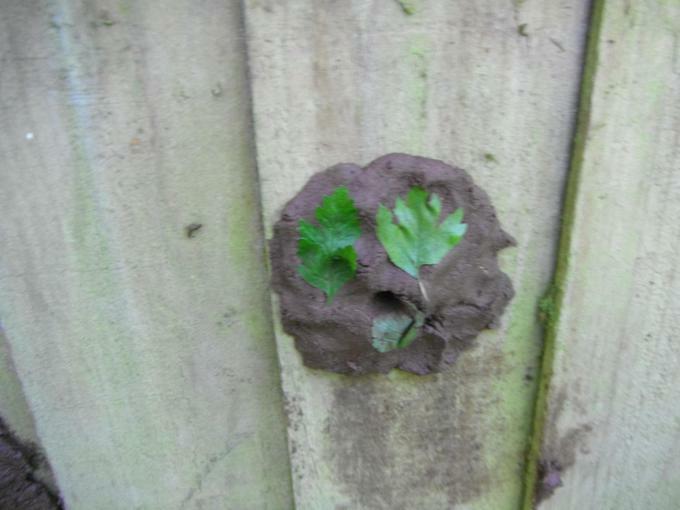 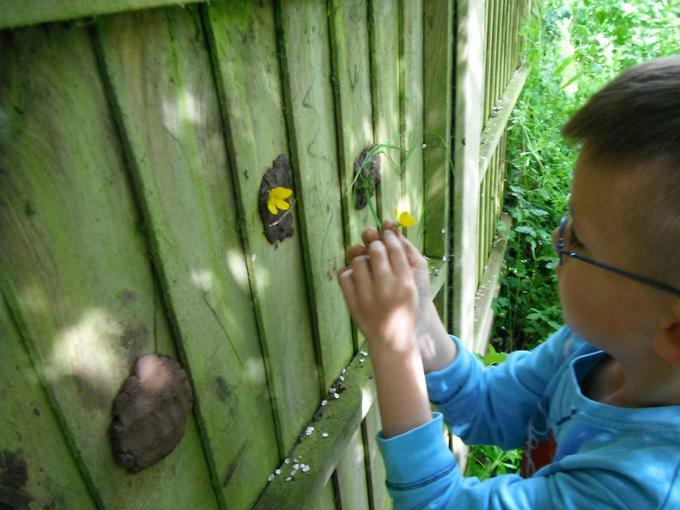 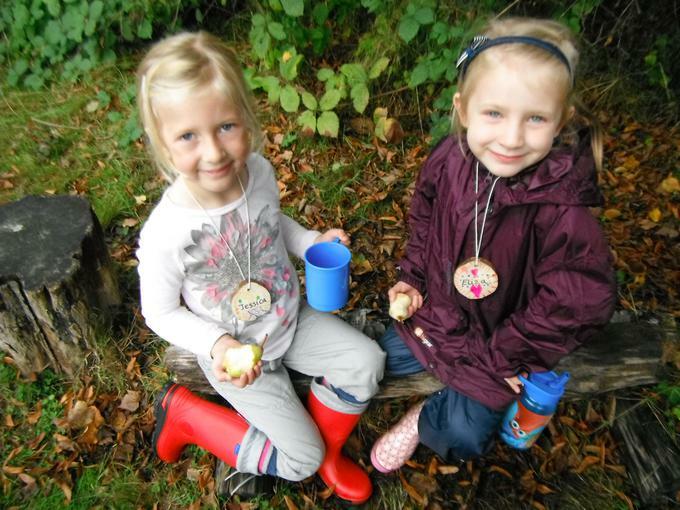 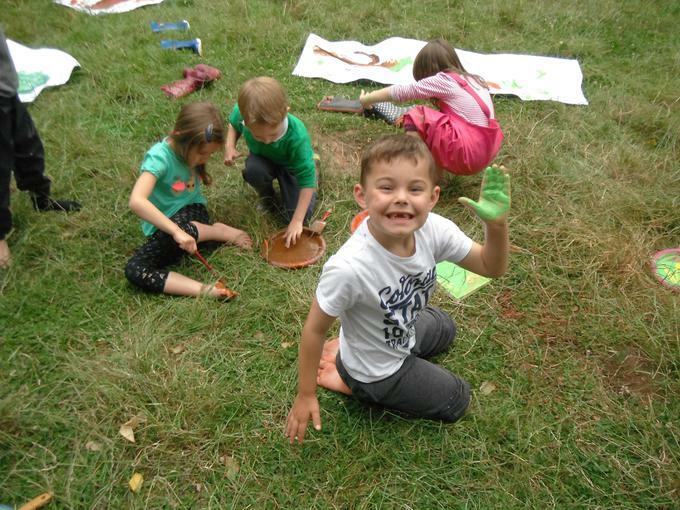 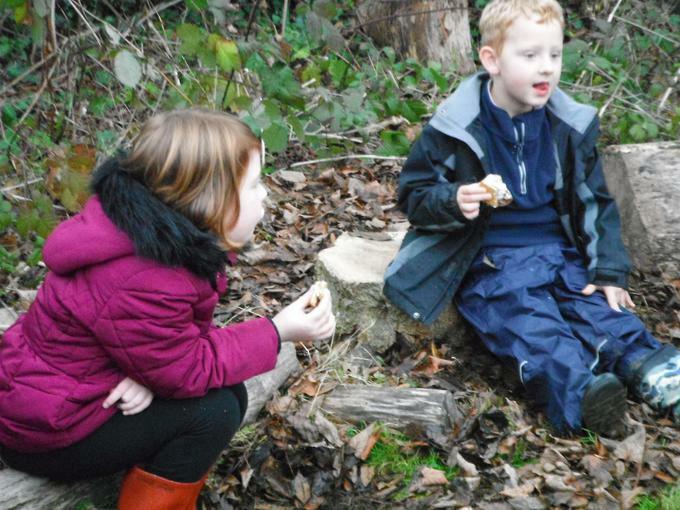 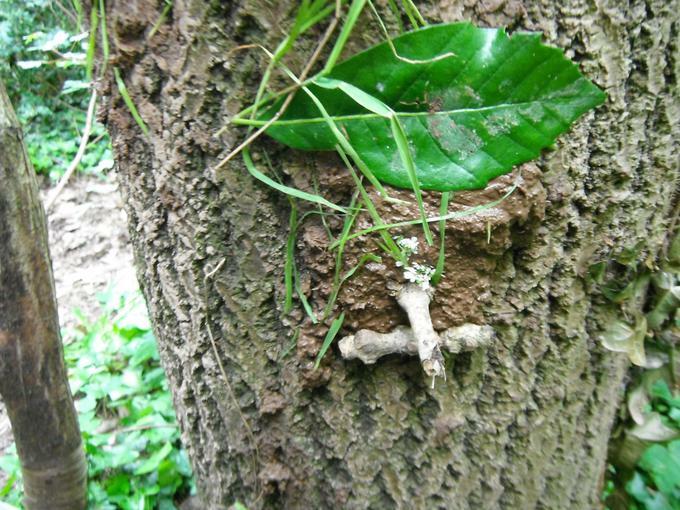 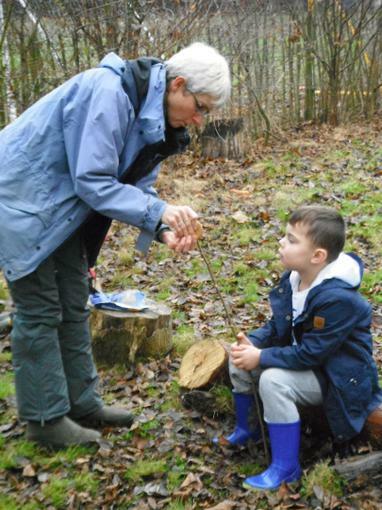 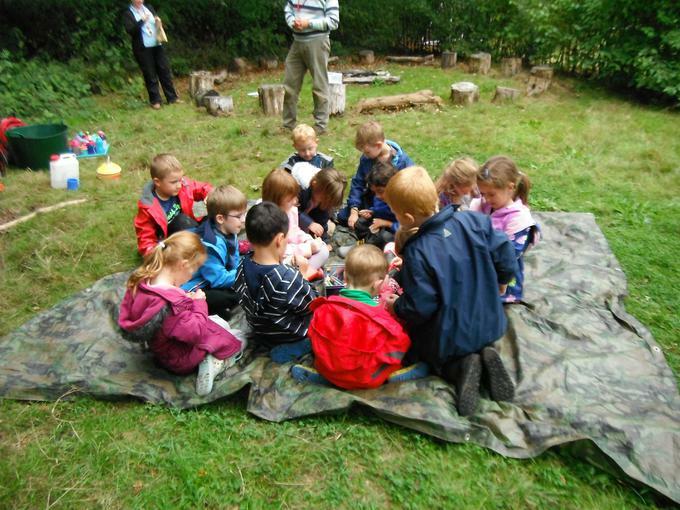 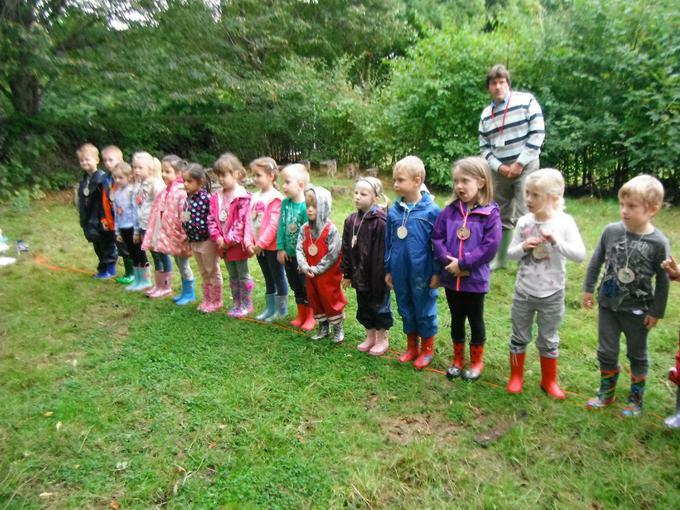 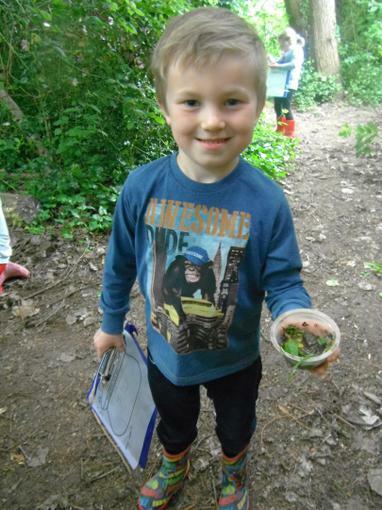 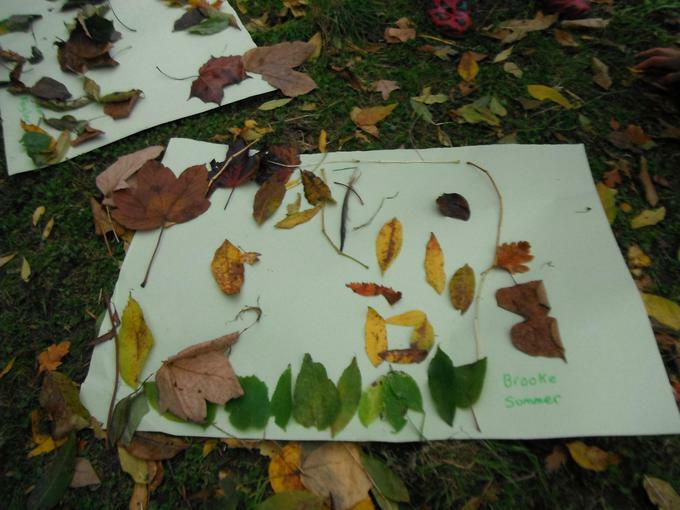 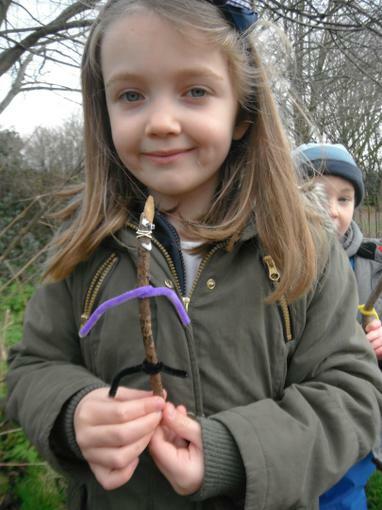 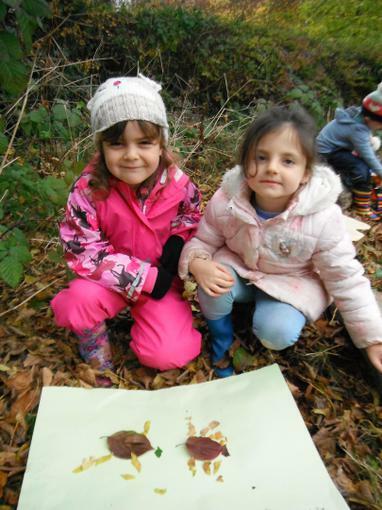 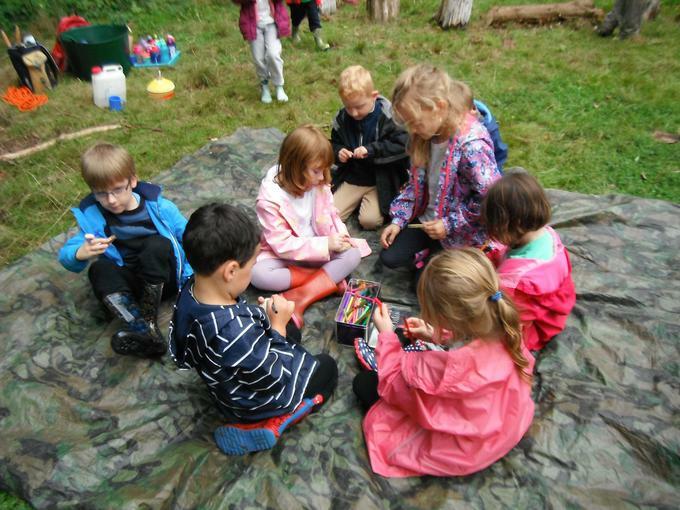 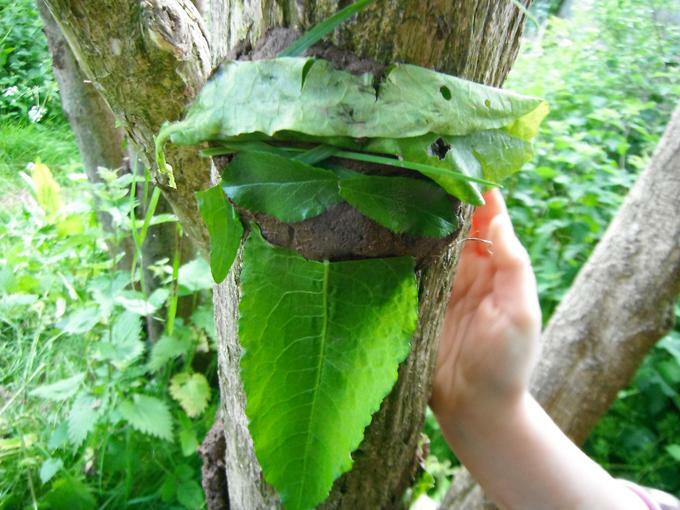 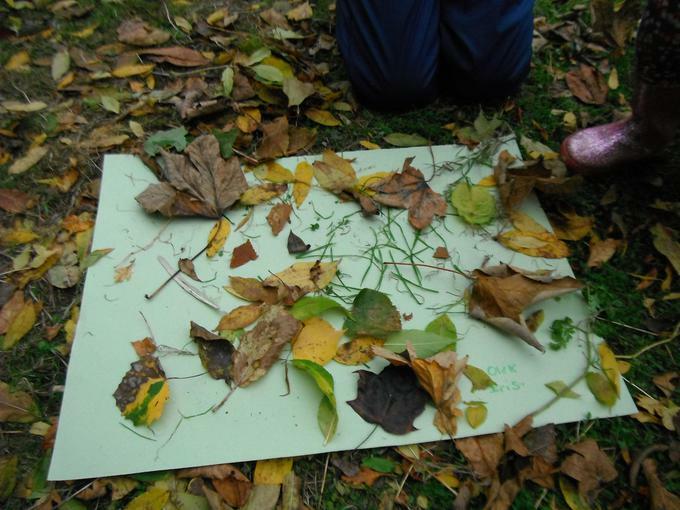 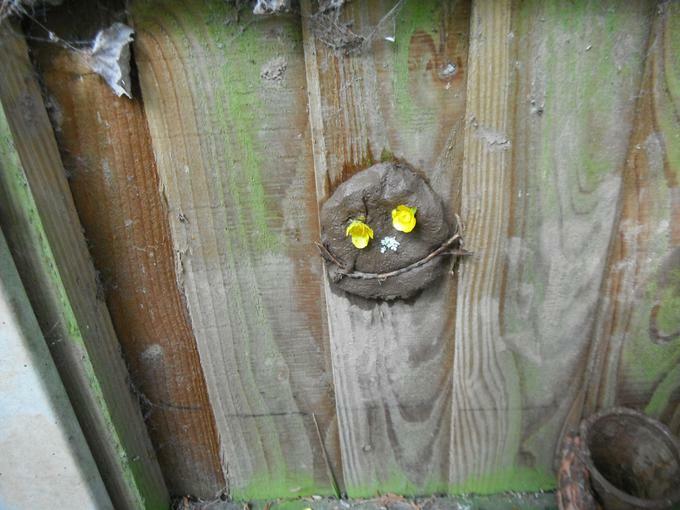 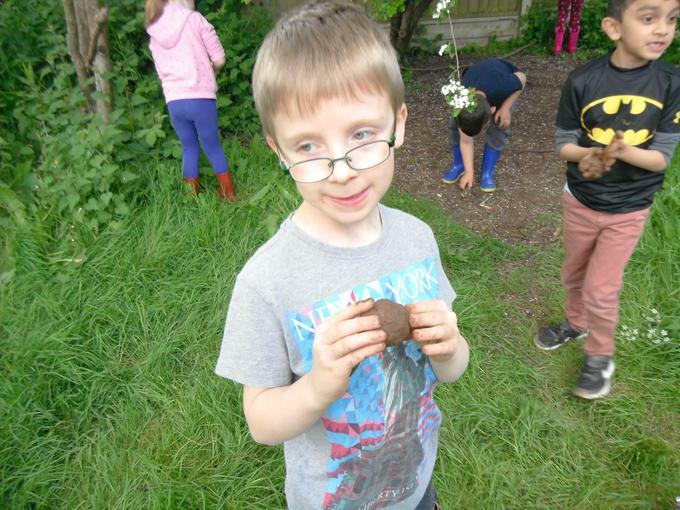 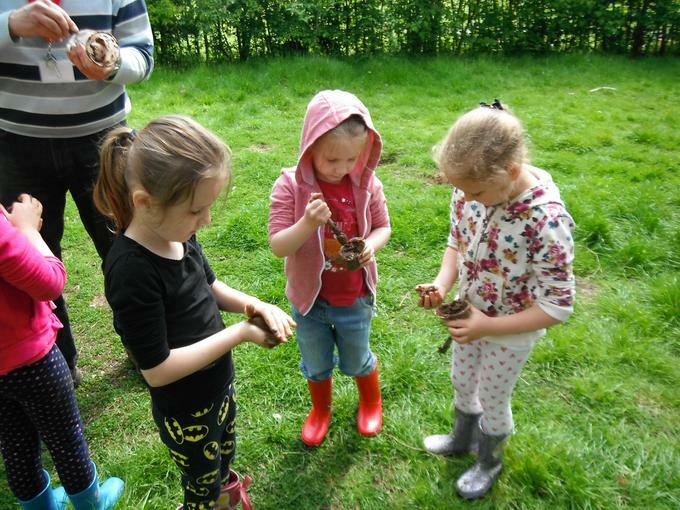 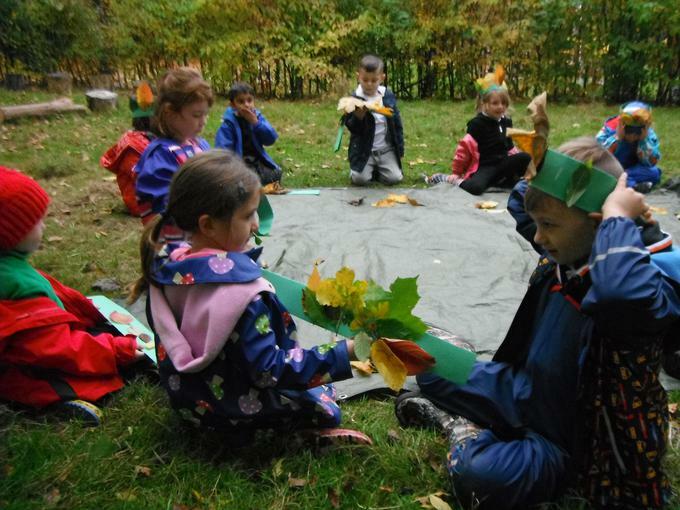 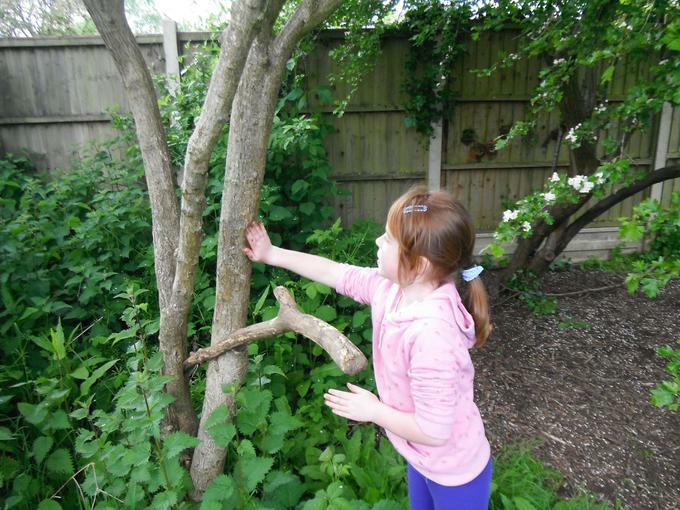 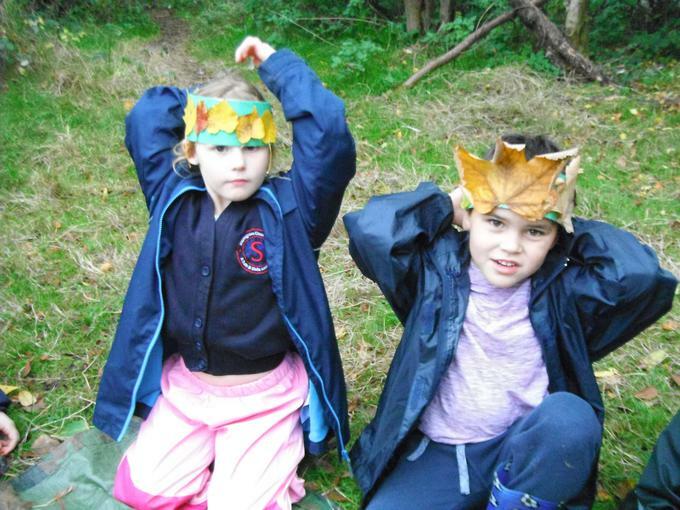 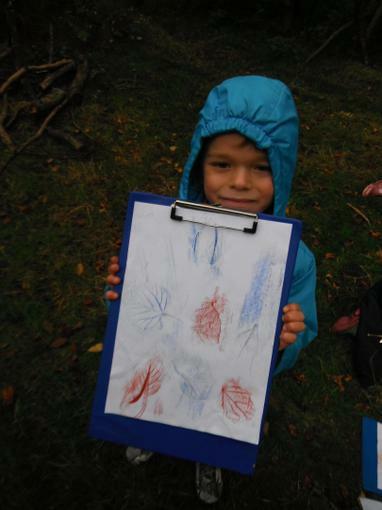 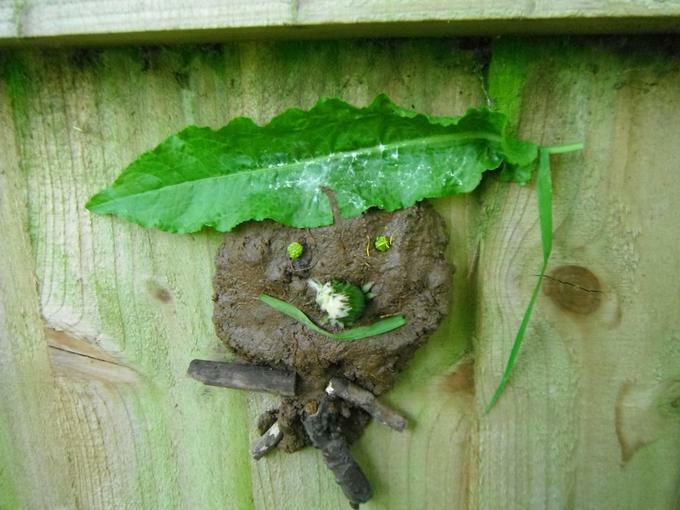 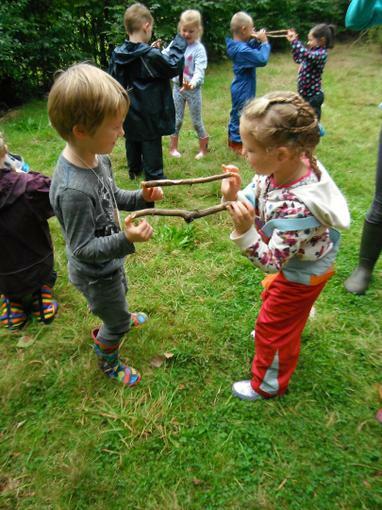 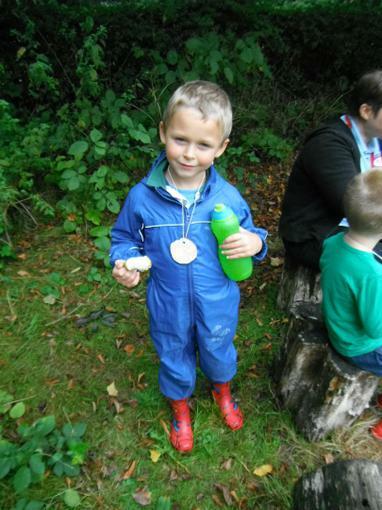 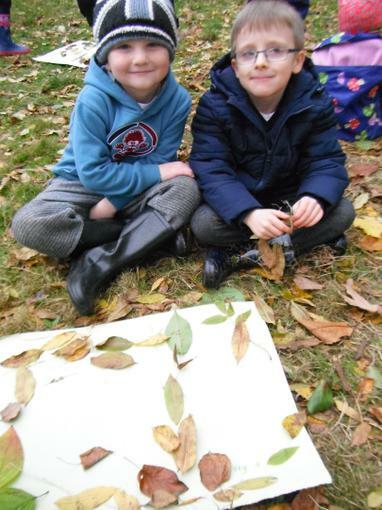 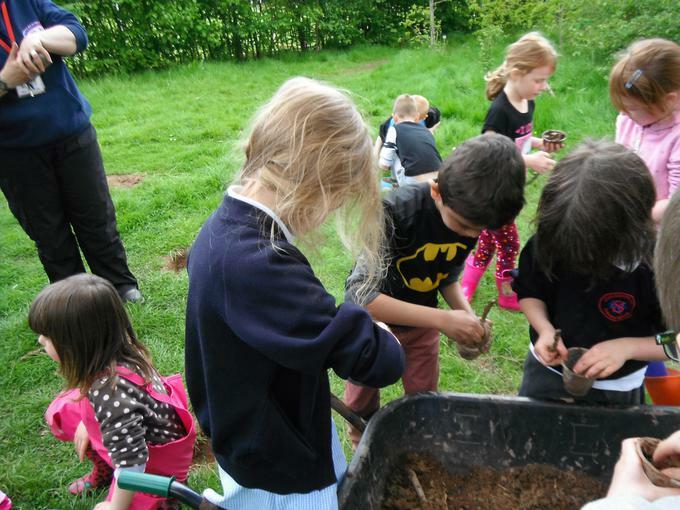 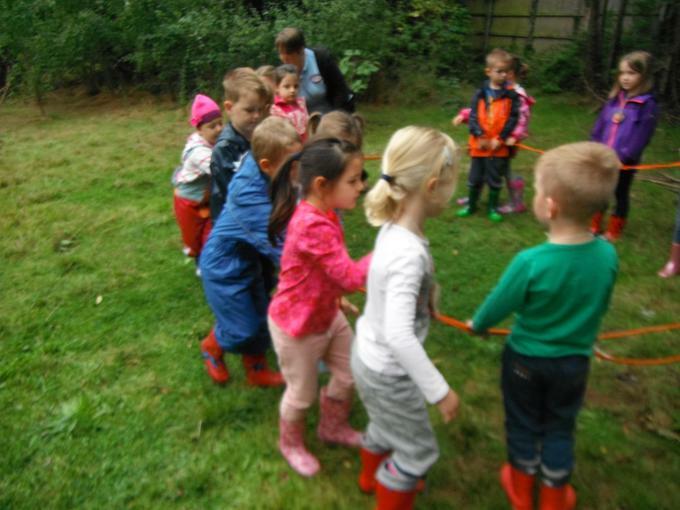 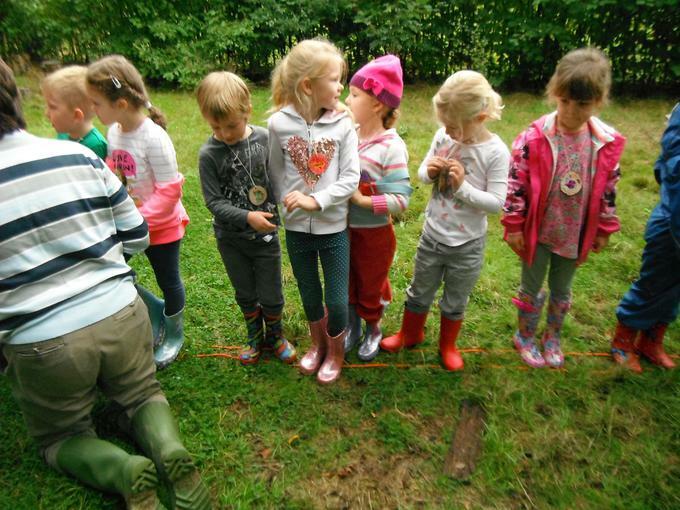 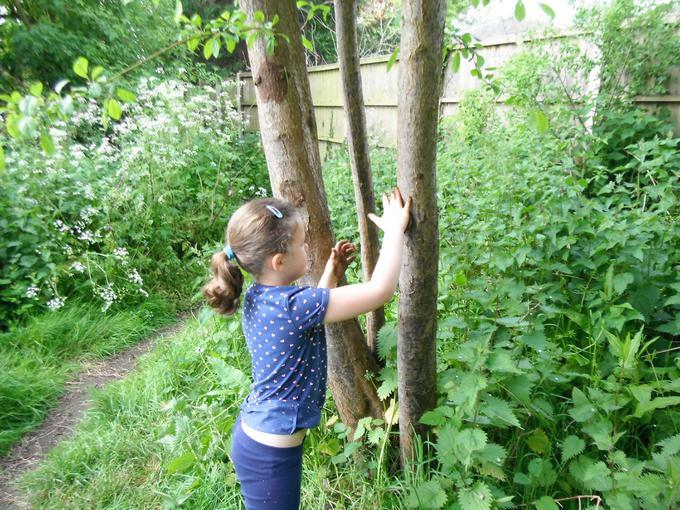 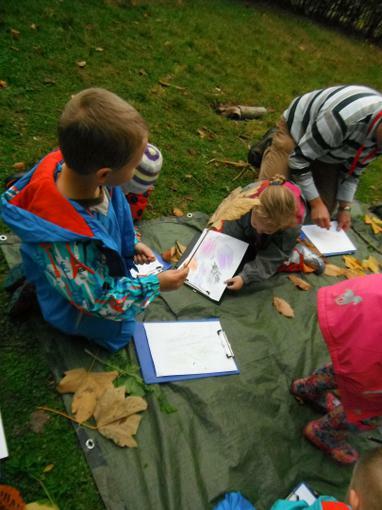 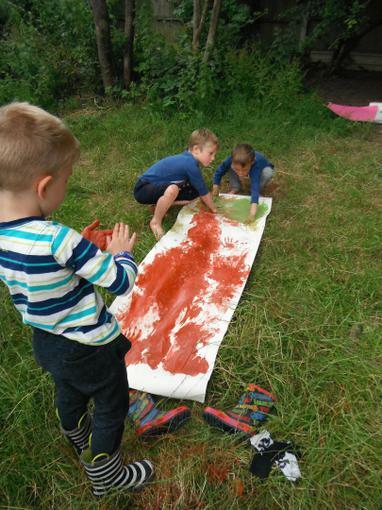 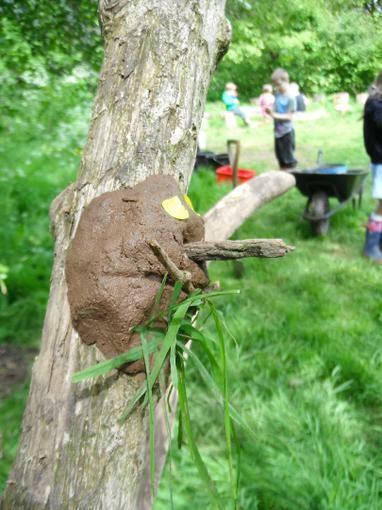 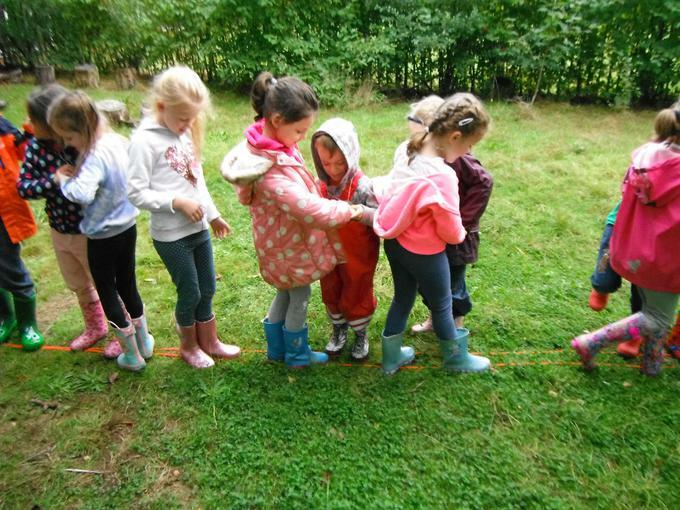 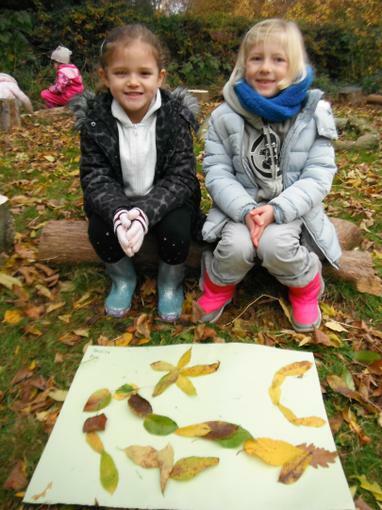 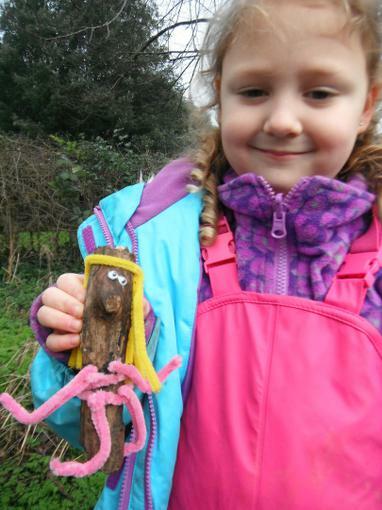 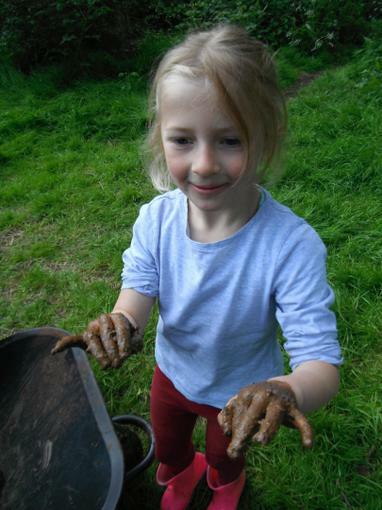 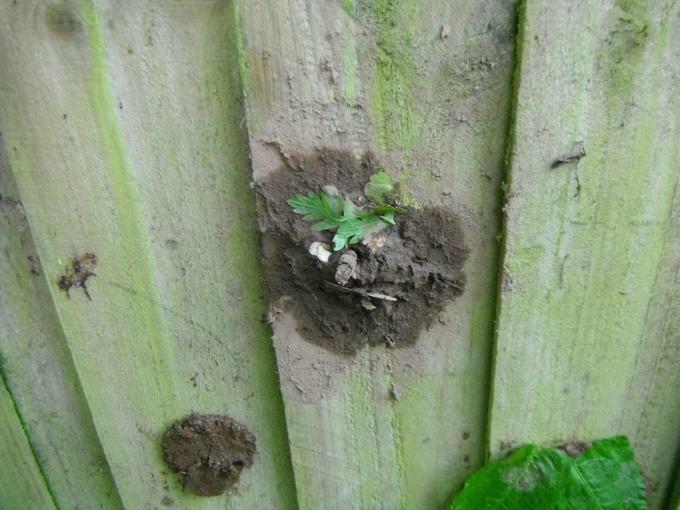 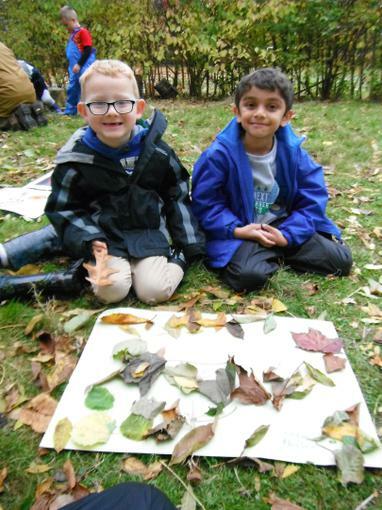 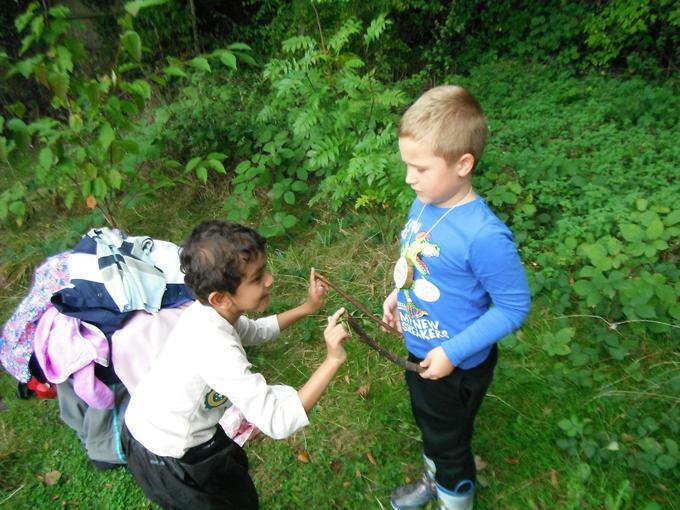 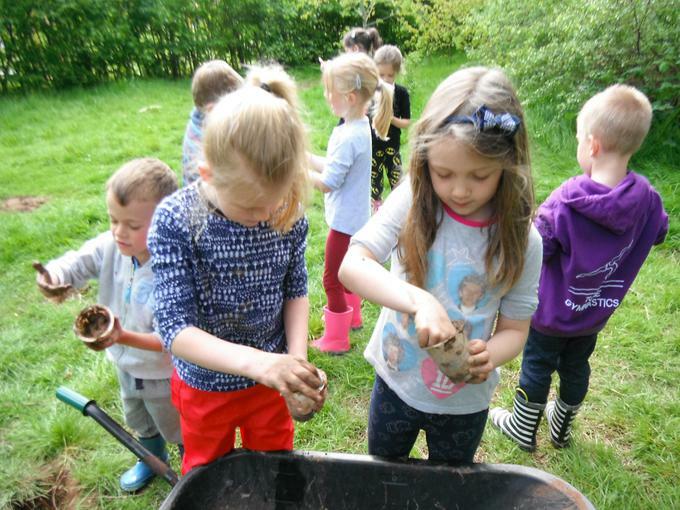 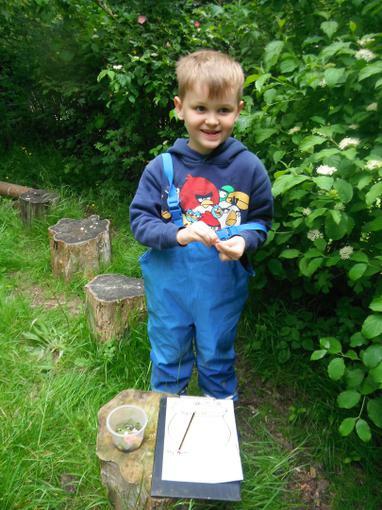 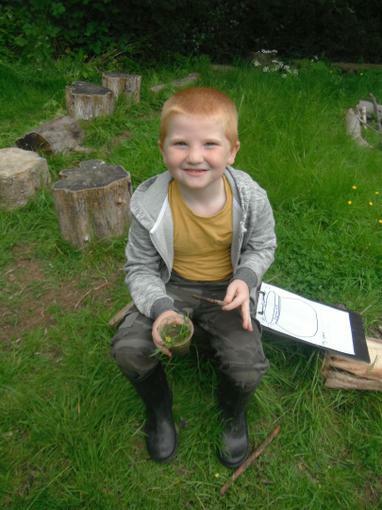 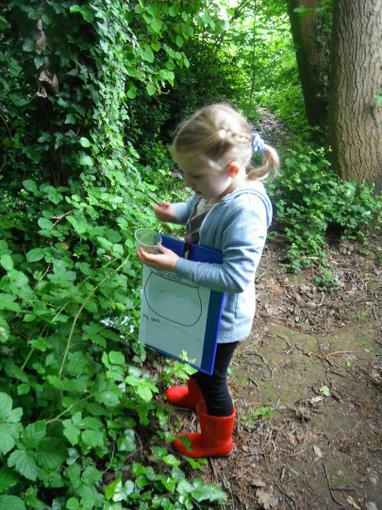 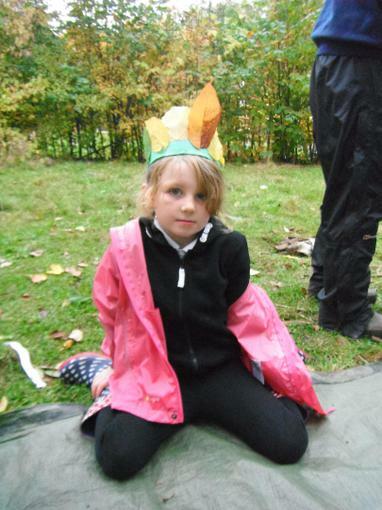 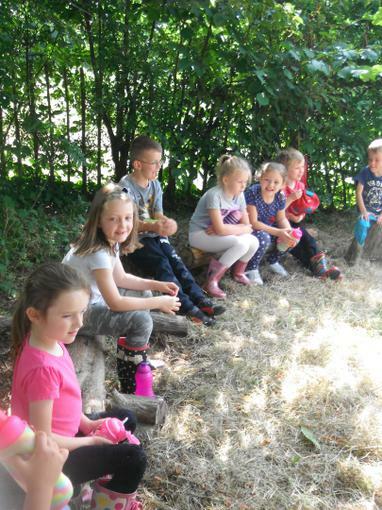 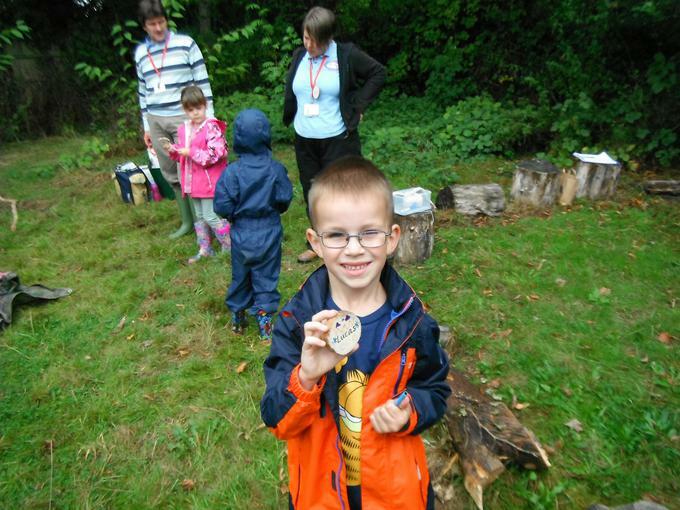 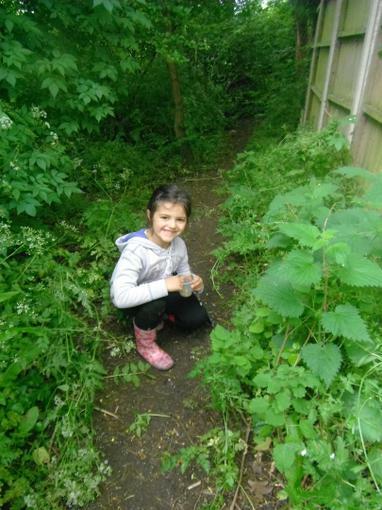 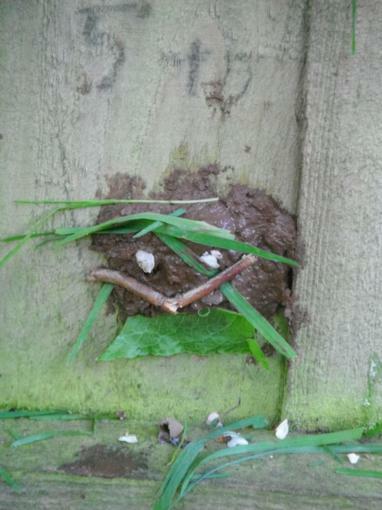 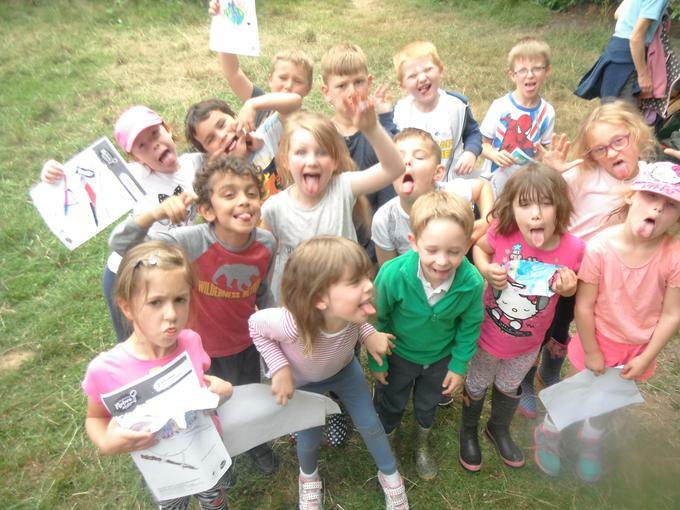 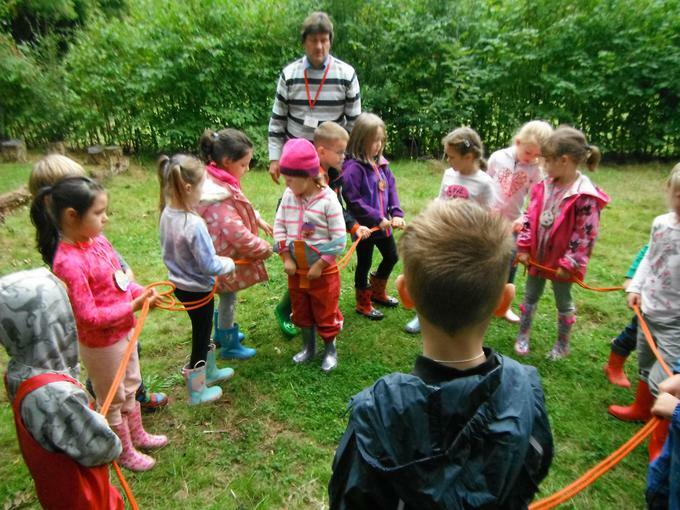 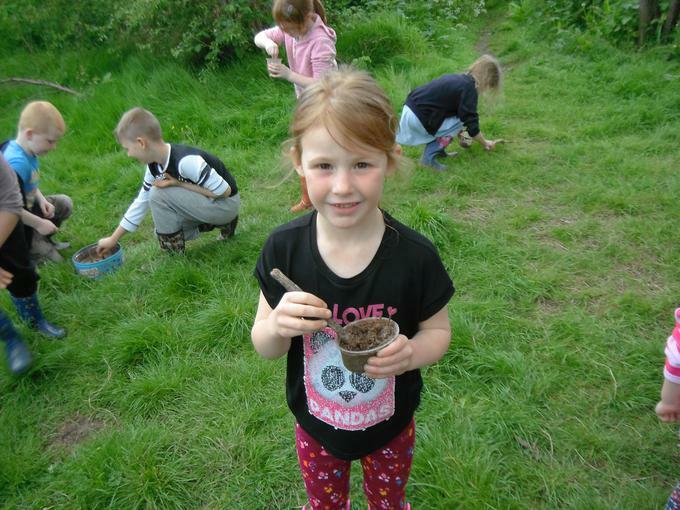 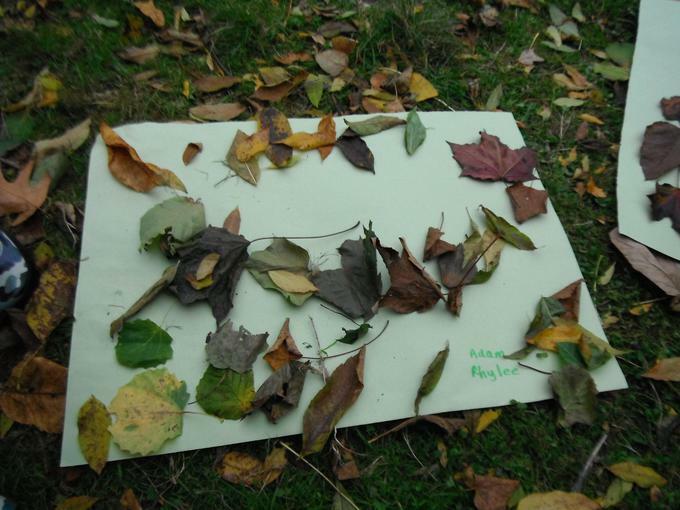 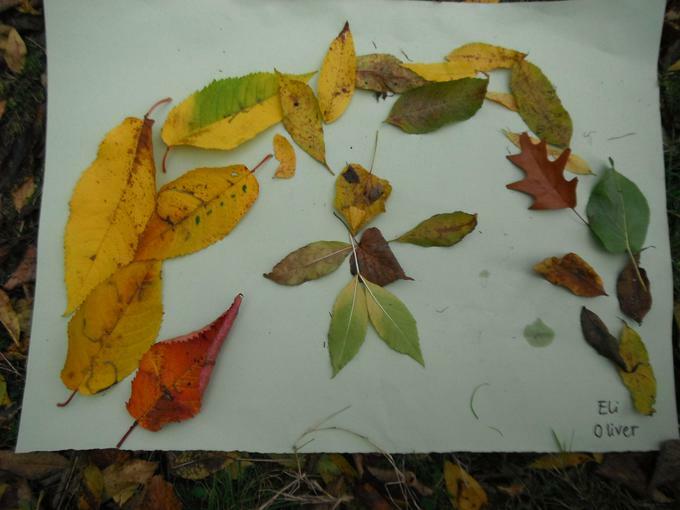 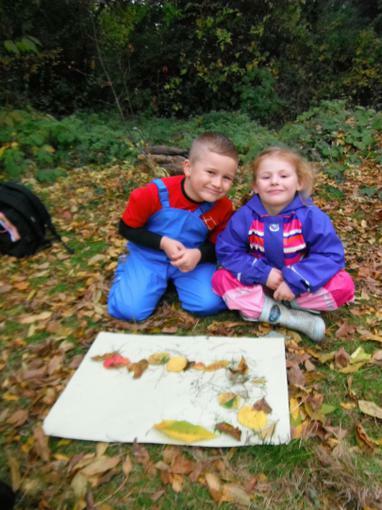 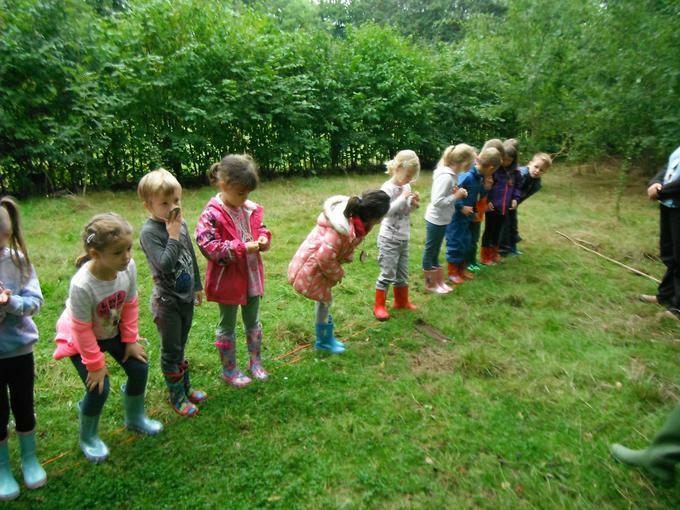 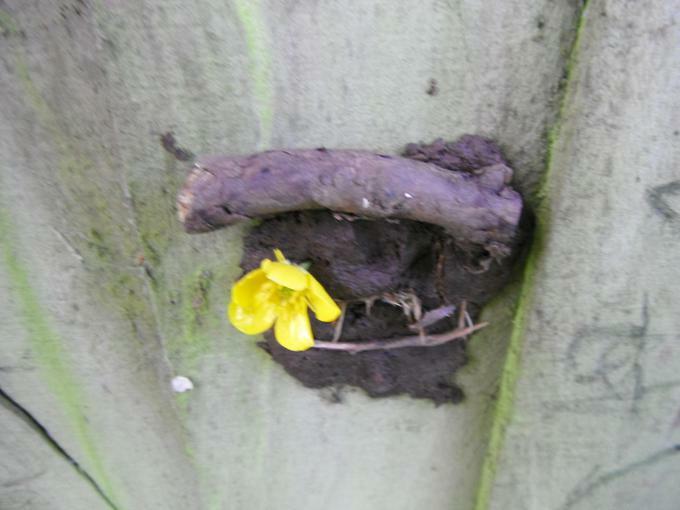 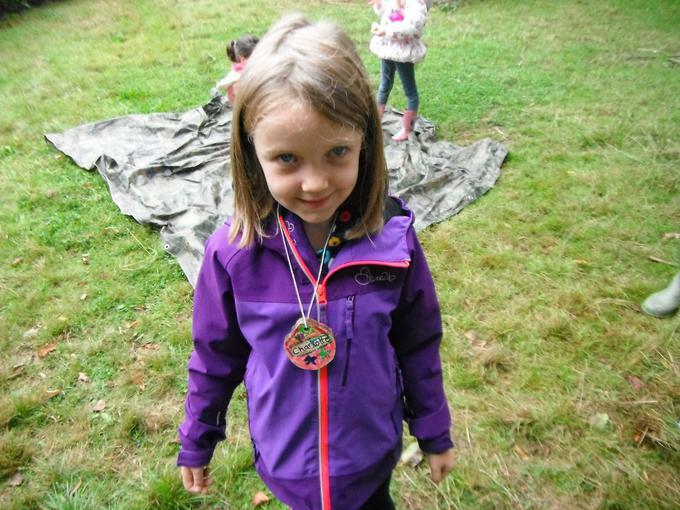 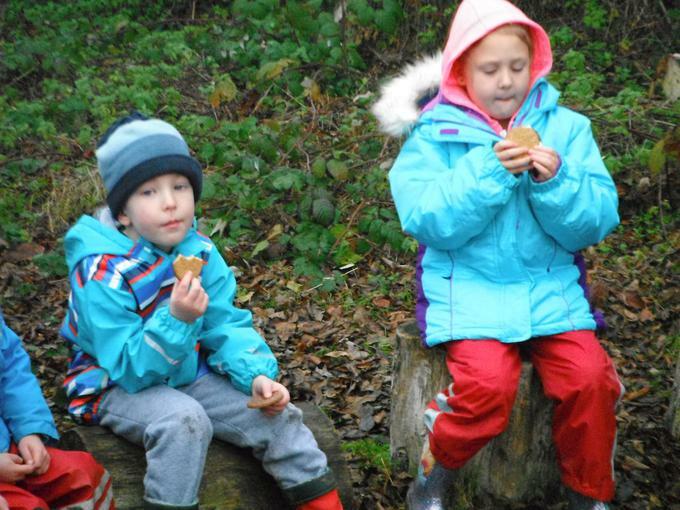 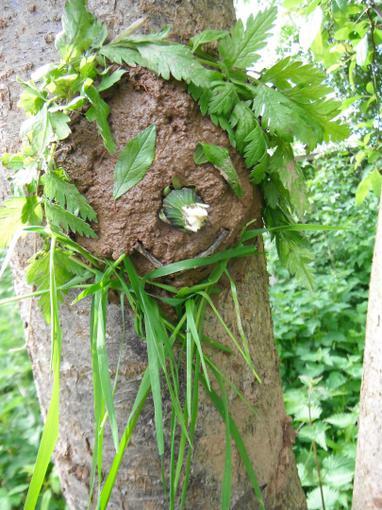 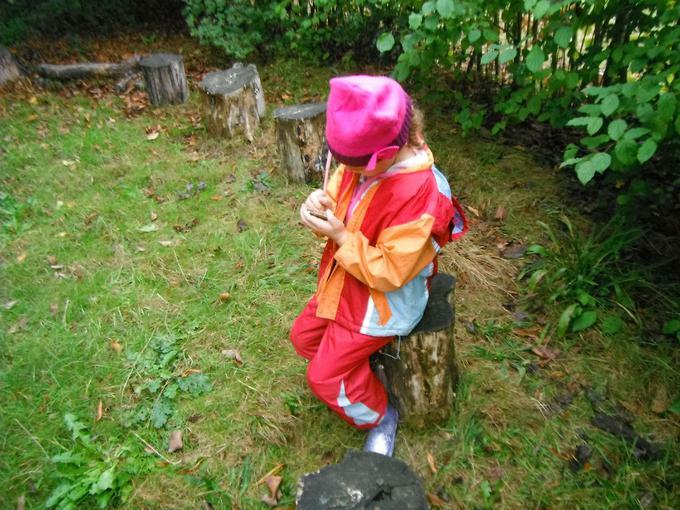 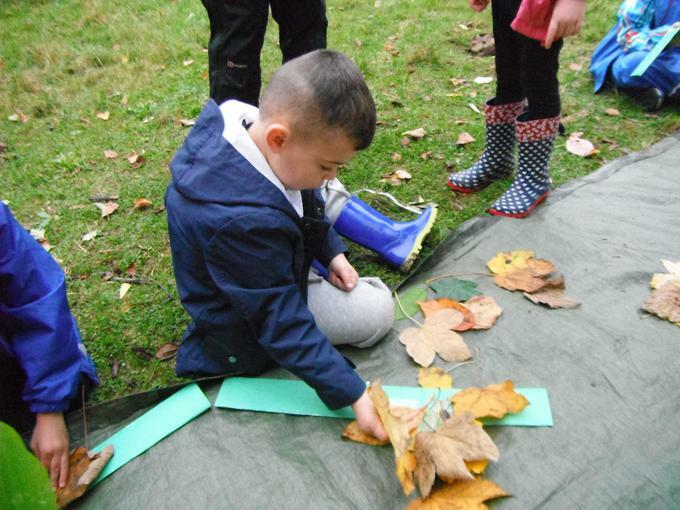 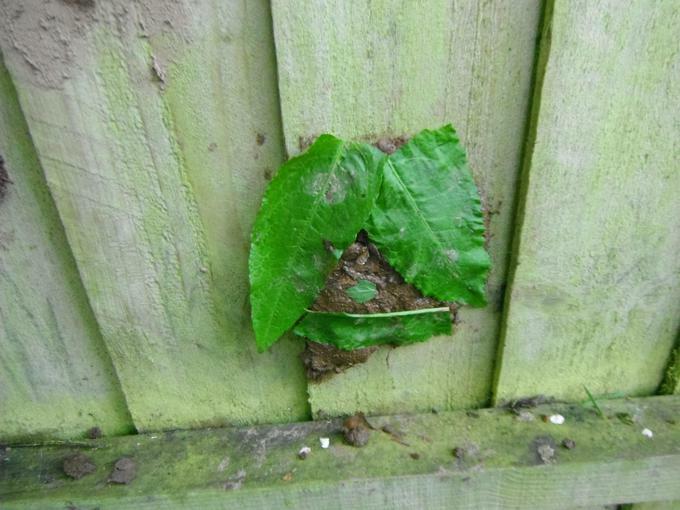 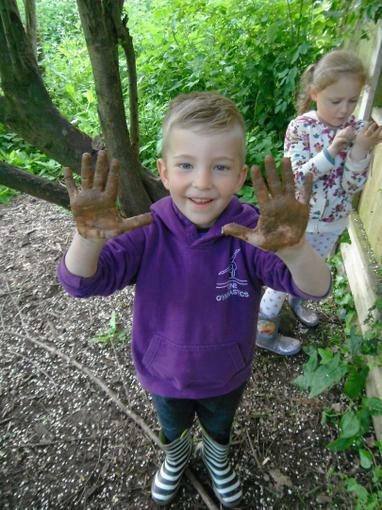 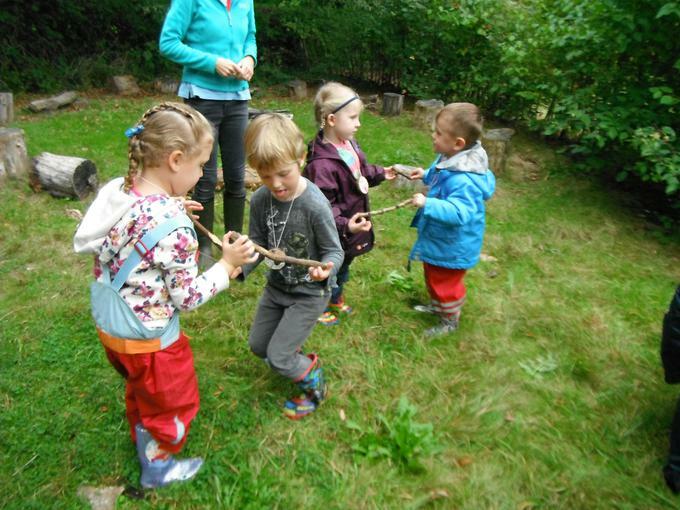 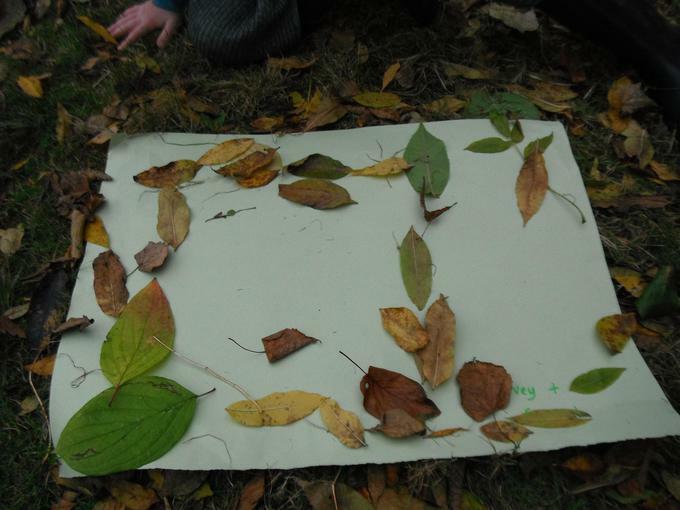 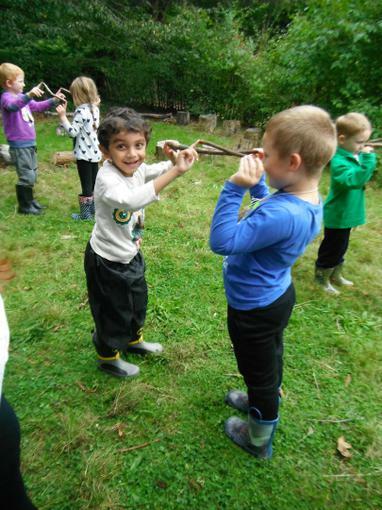 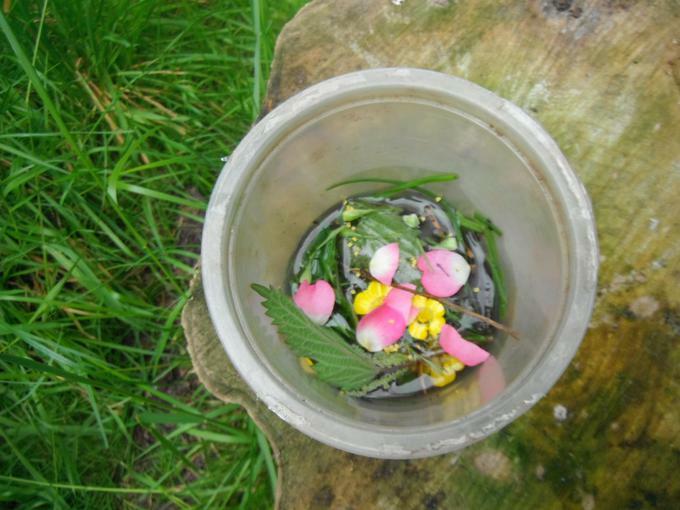 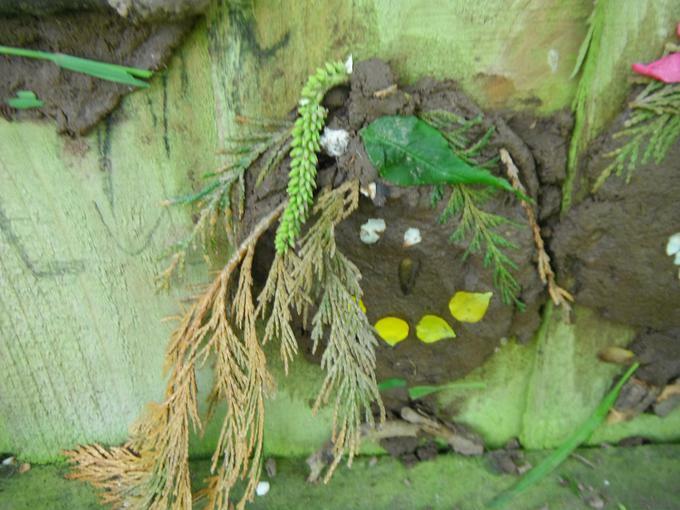 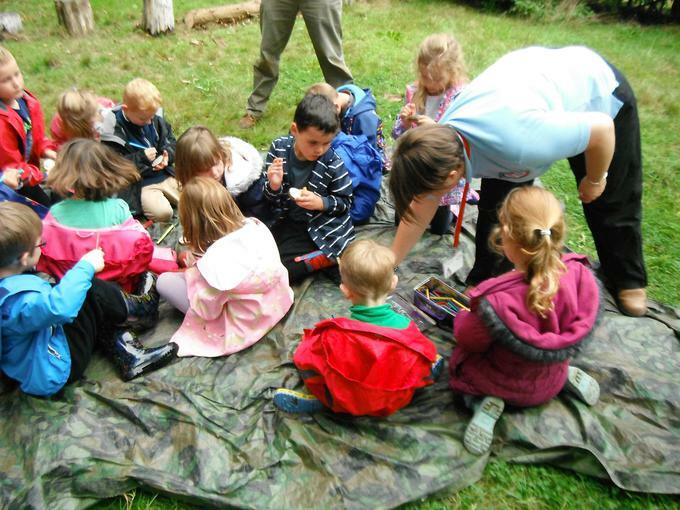 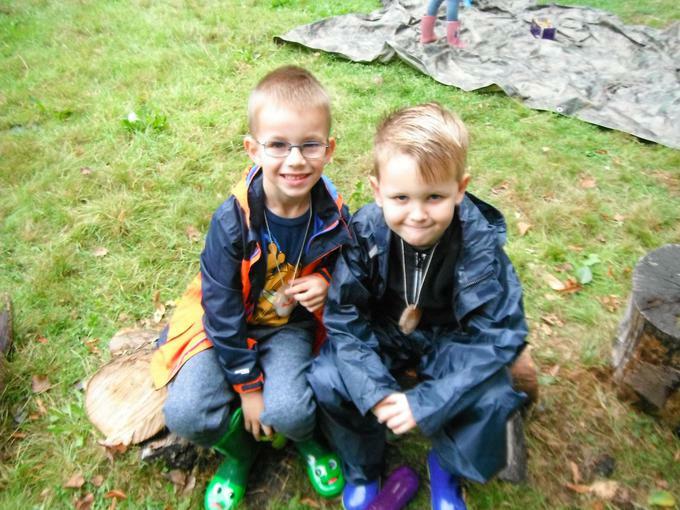 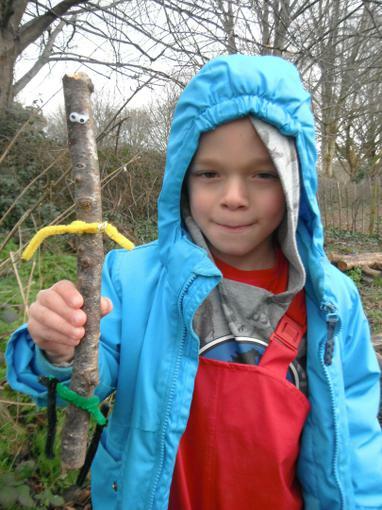 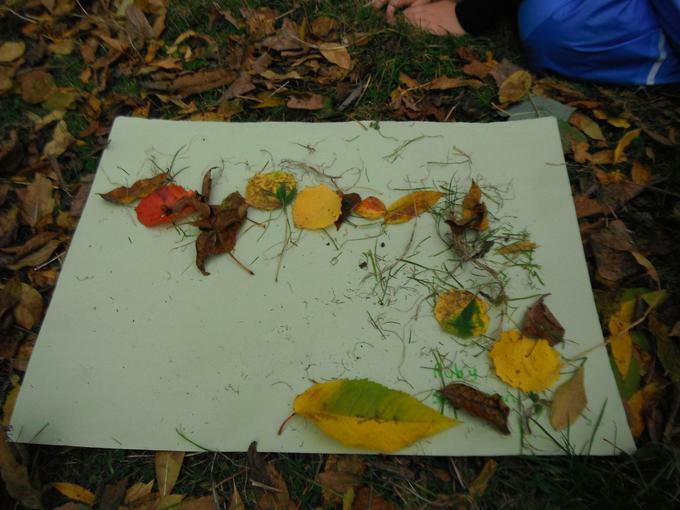 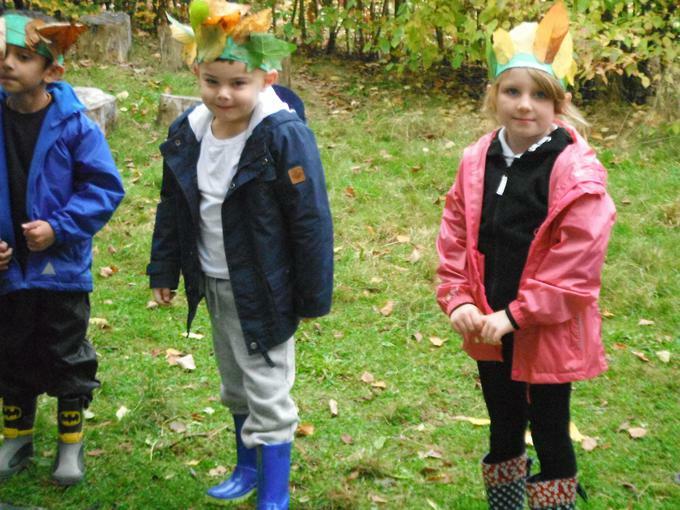 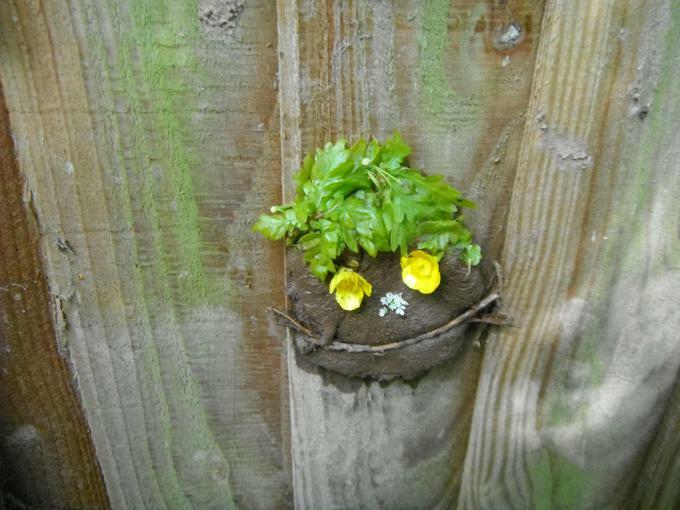 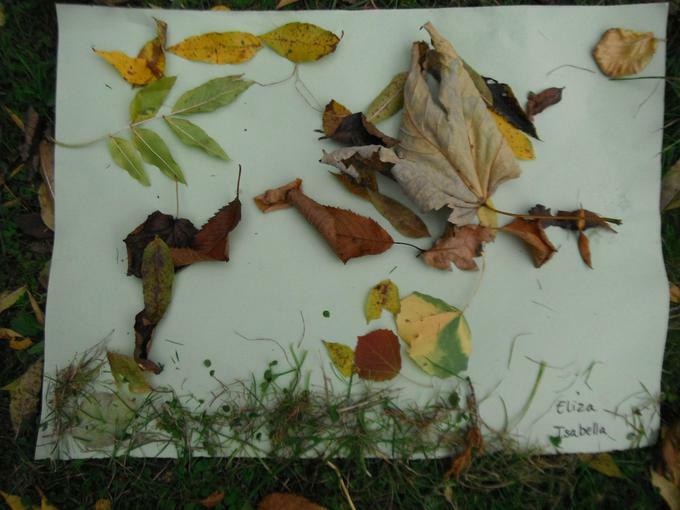 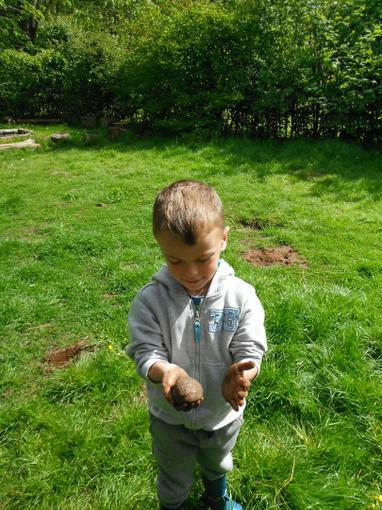 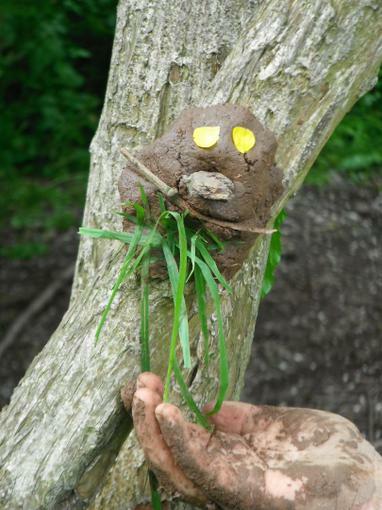 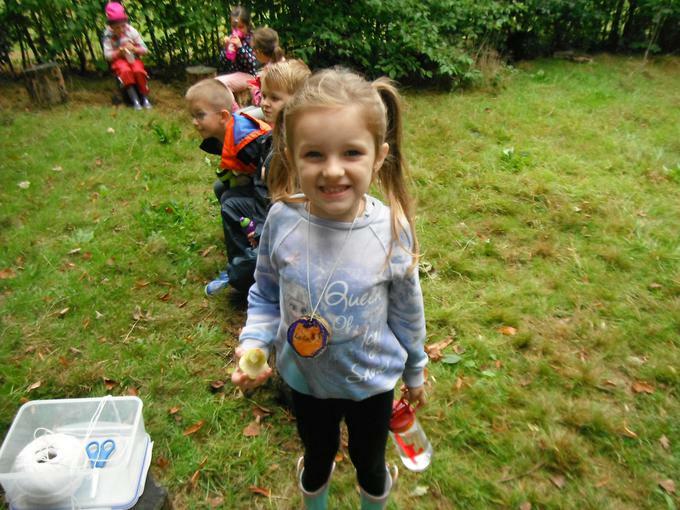 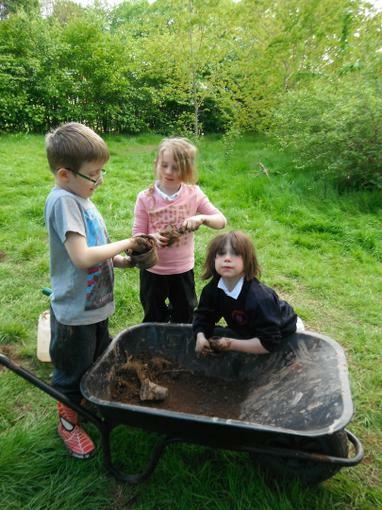 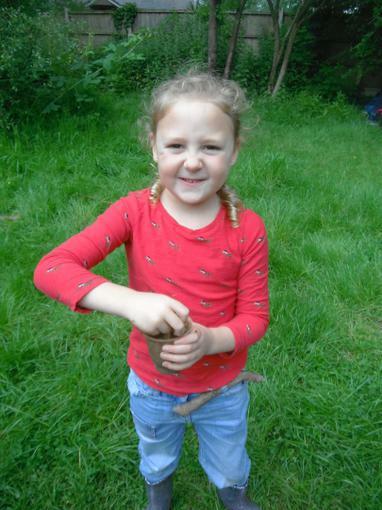 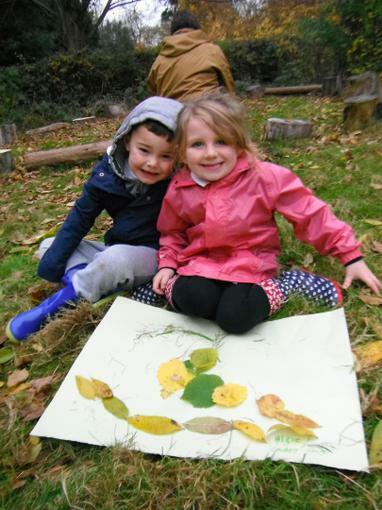 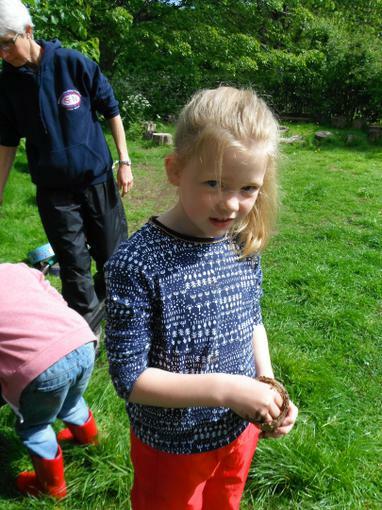 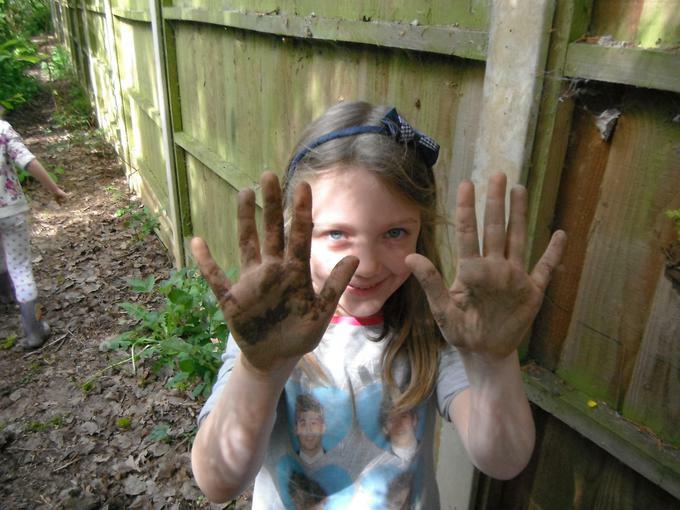 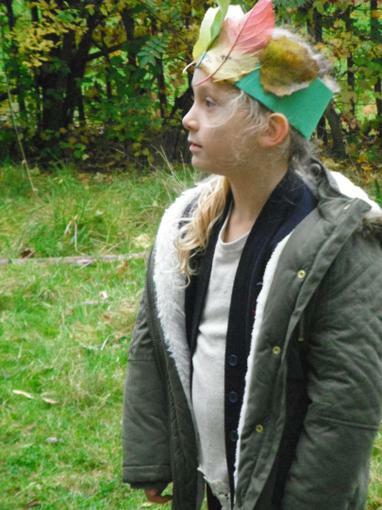 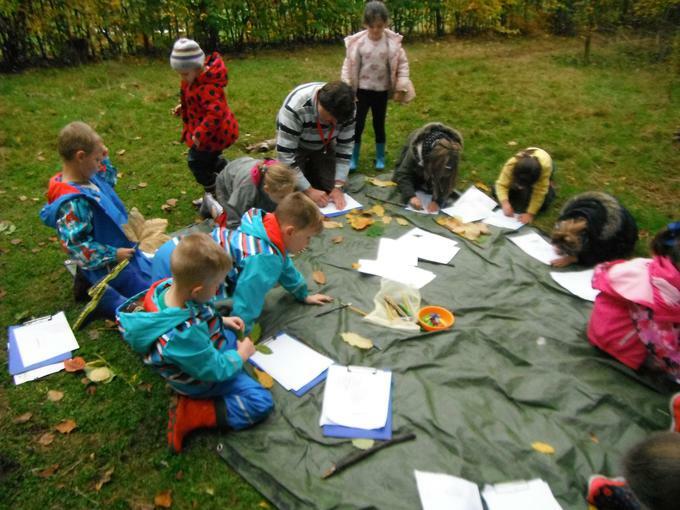 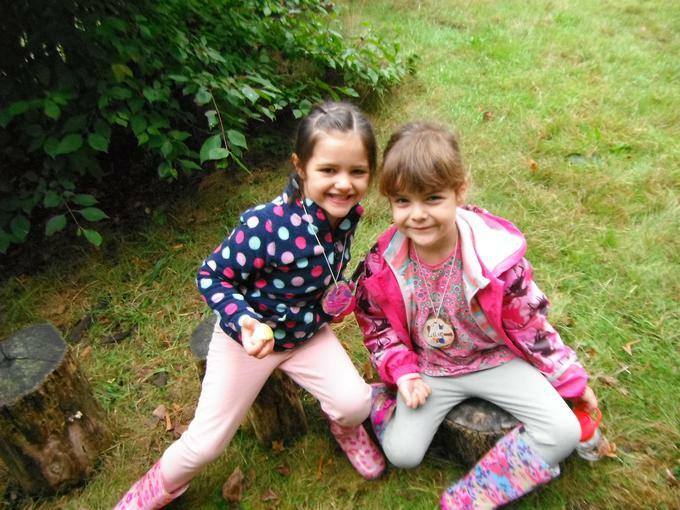 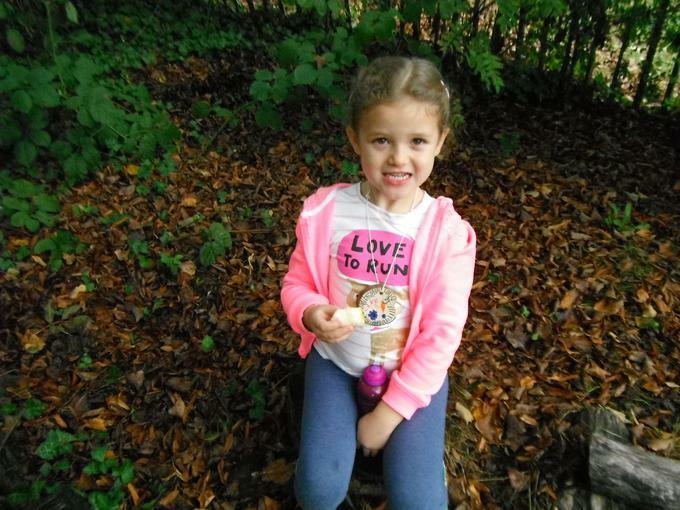 Welcome to Forest School! 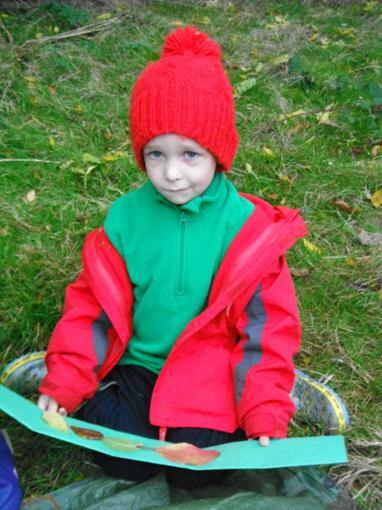 Please visit this page to see copies of letters that have been sent out, dates and photos of what we have been up to. 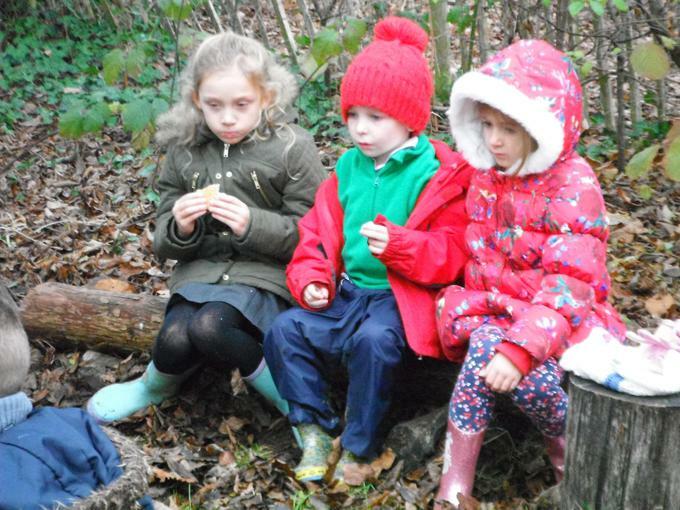 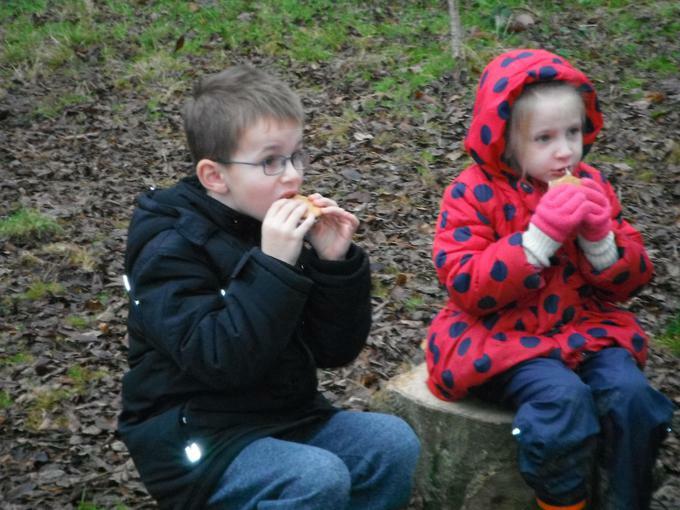 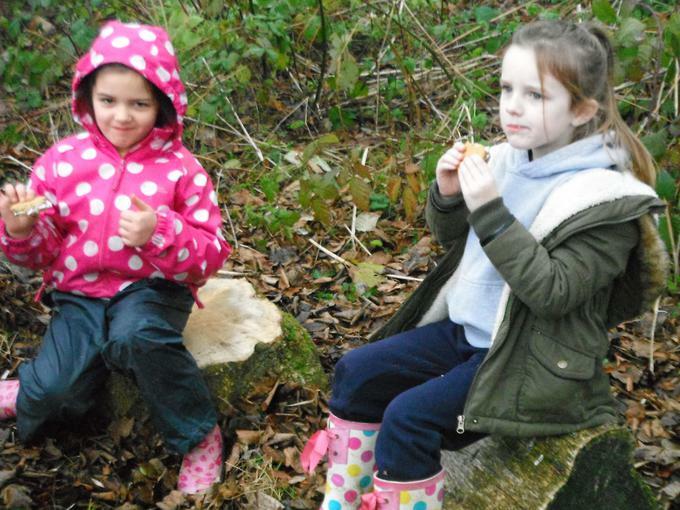 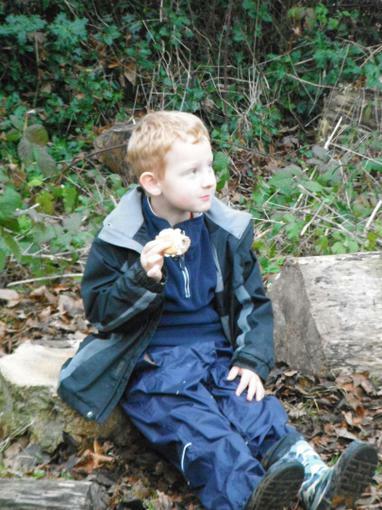 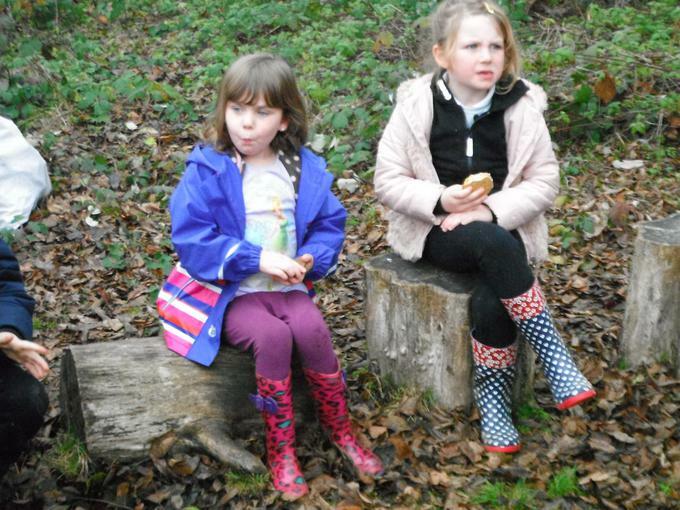 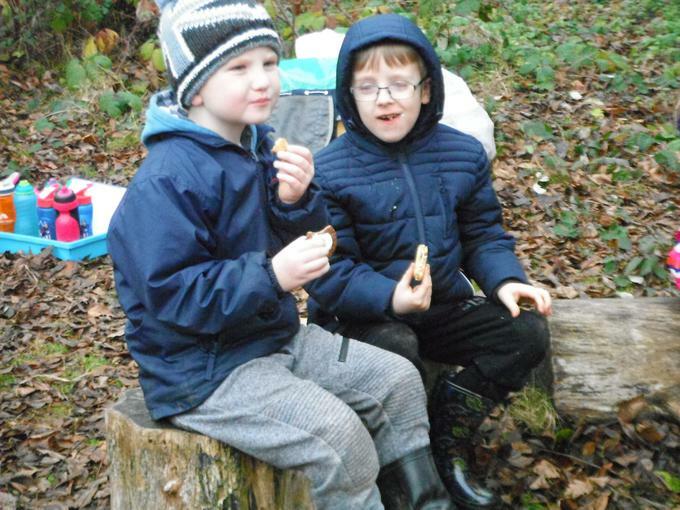 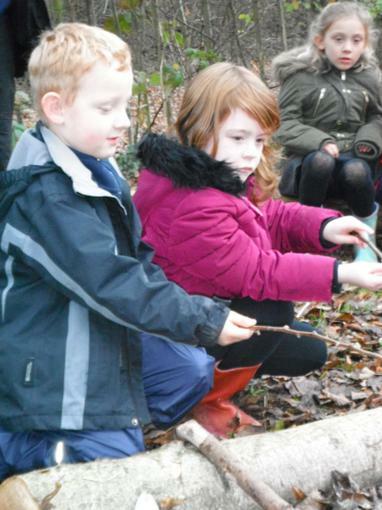 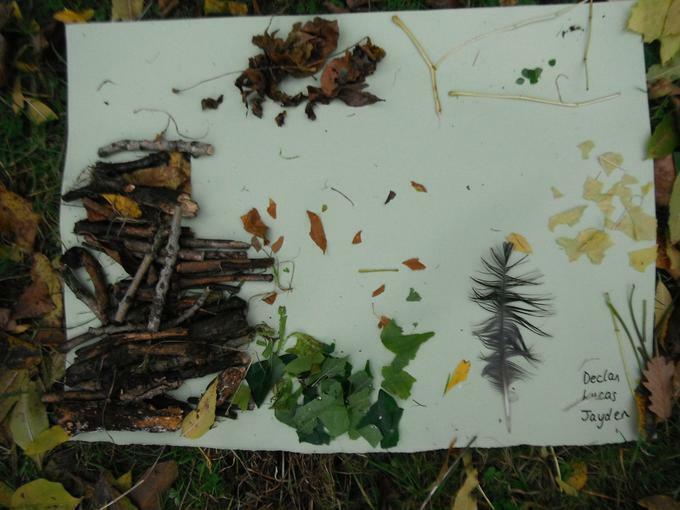 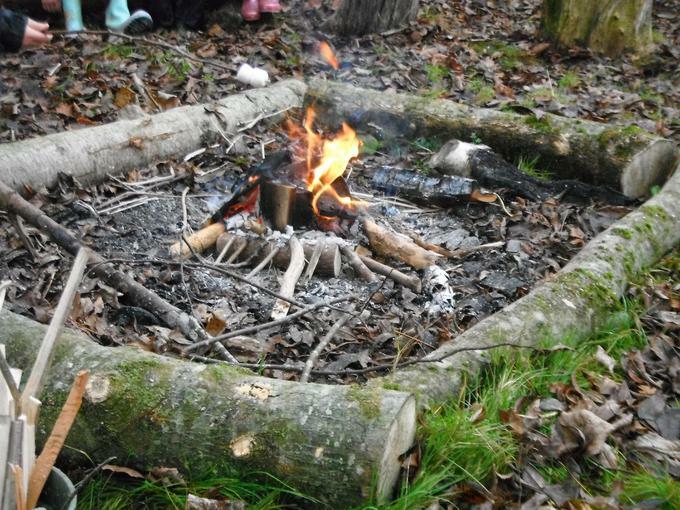 As it was our last week at Forest School we collected lots of wood for a fire. 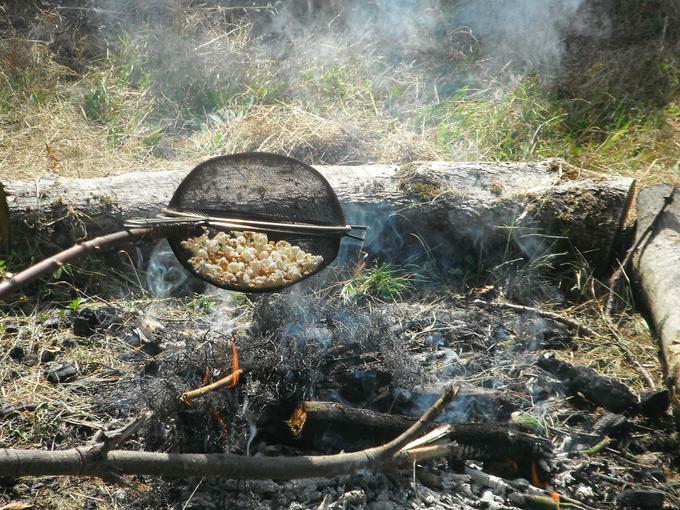 Then we cooked popcorn! 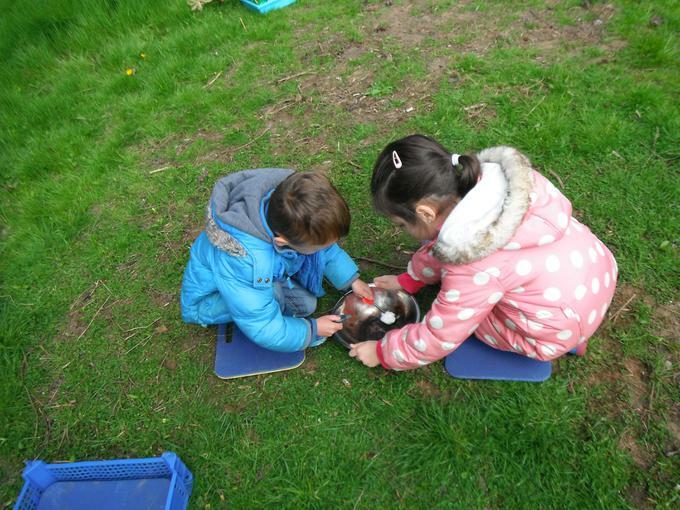 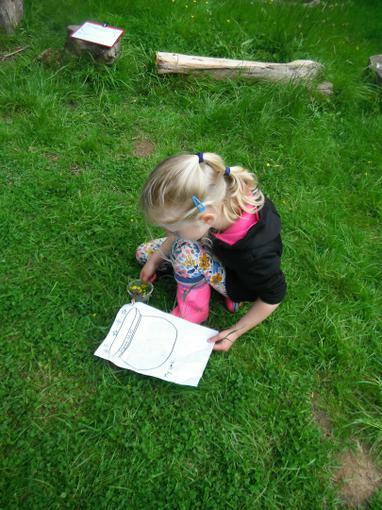 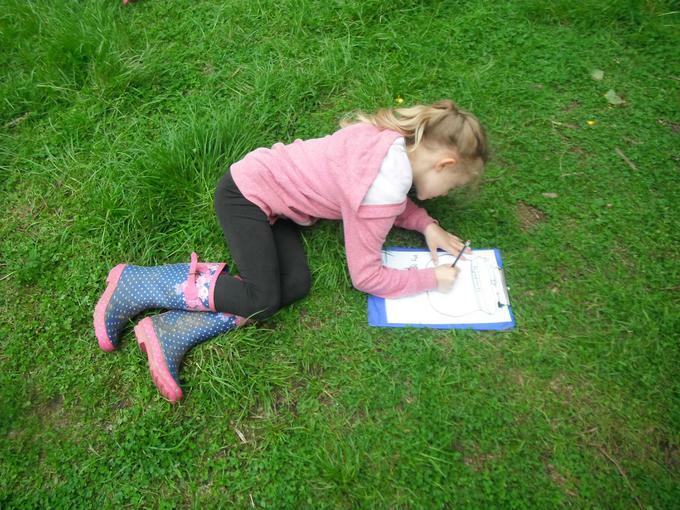 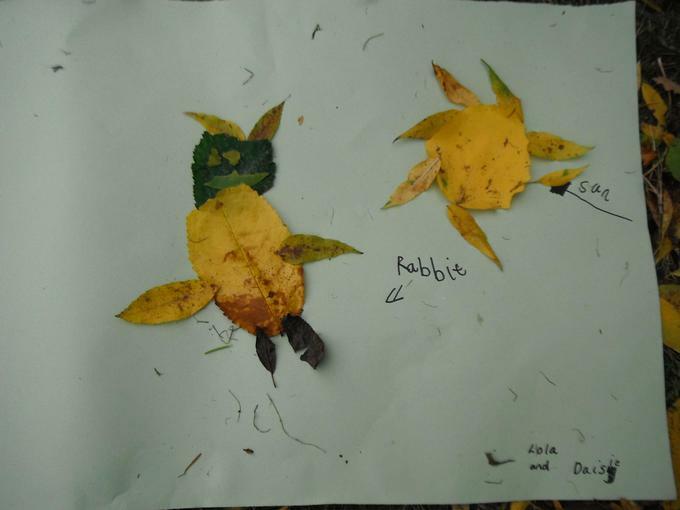 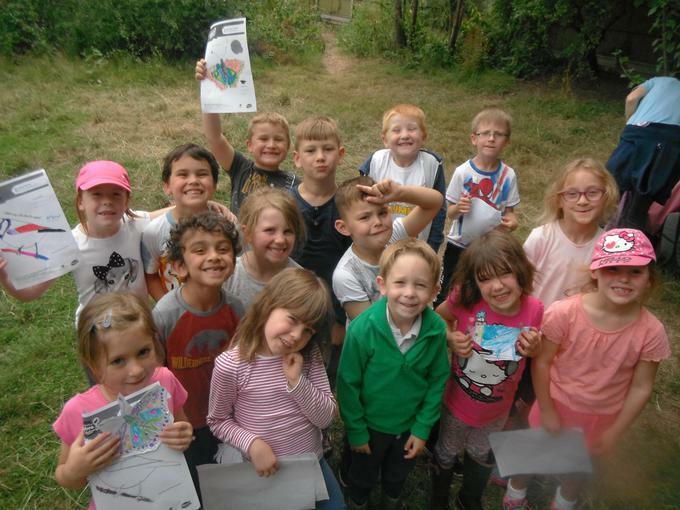 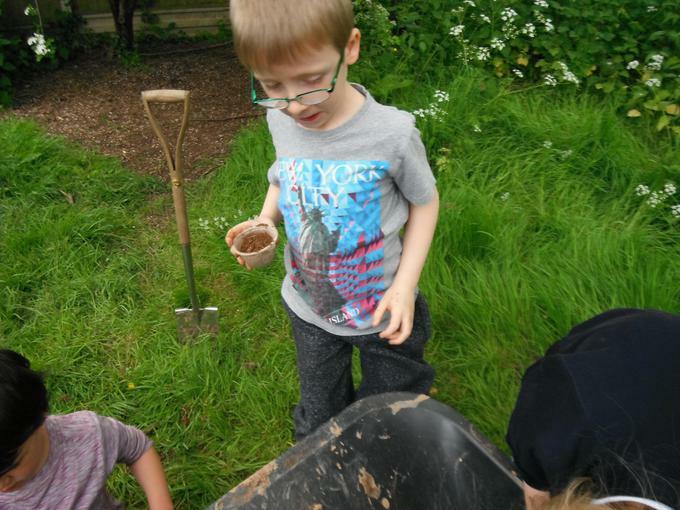 We thought about all the things we had learnt and remembered some of the fun things we have done. 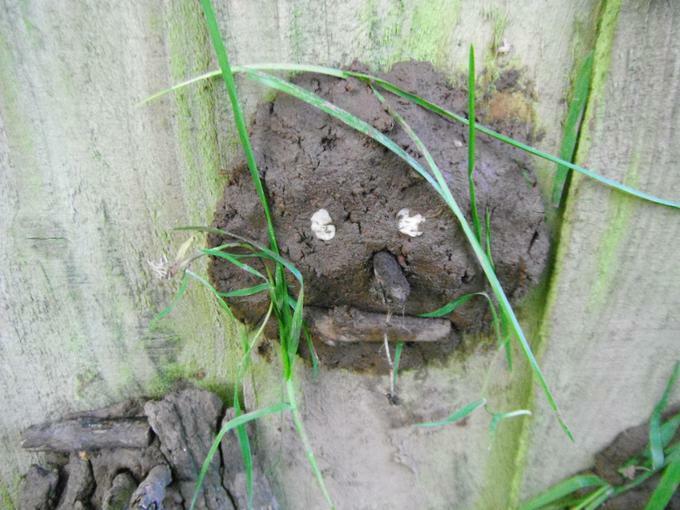 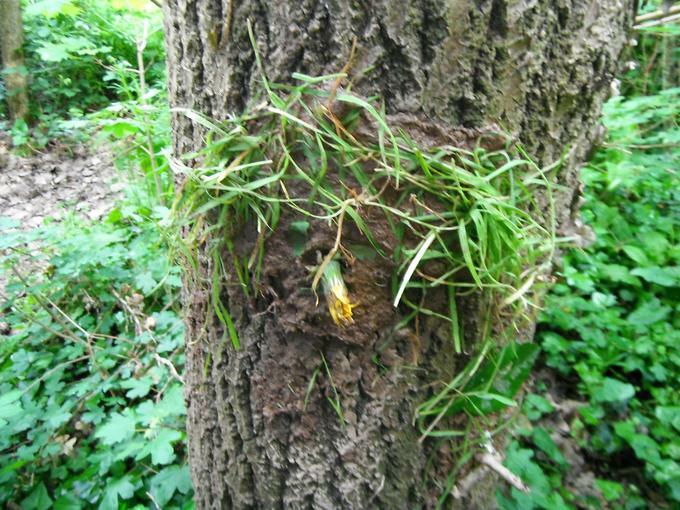 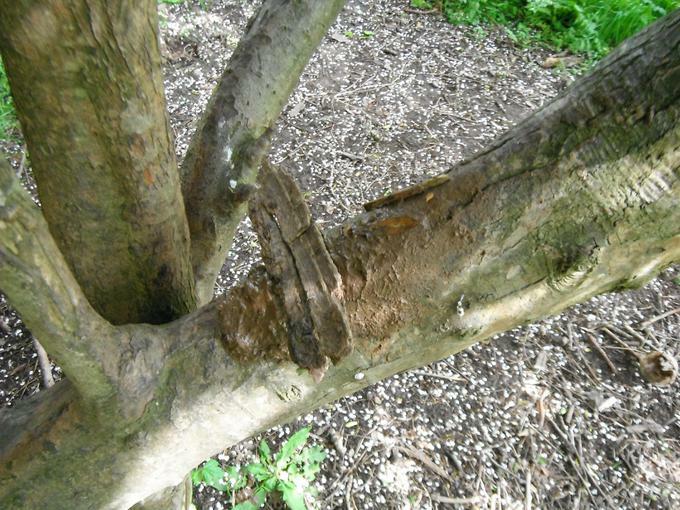 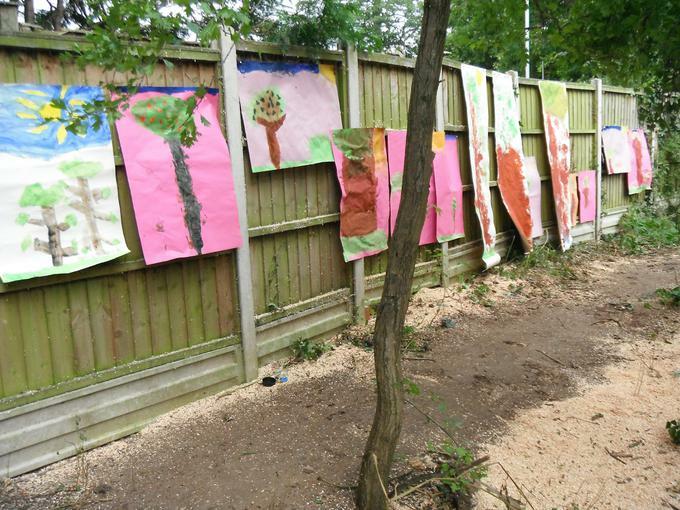 Last week a tree had to be cut down from the Nuffield hospital site, and it felt a bit bare. 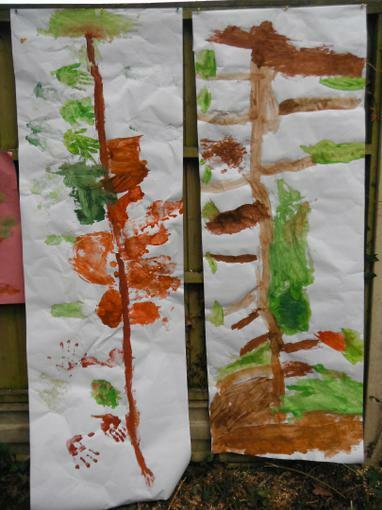 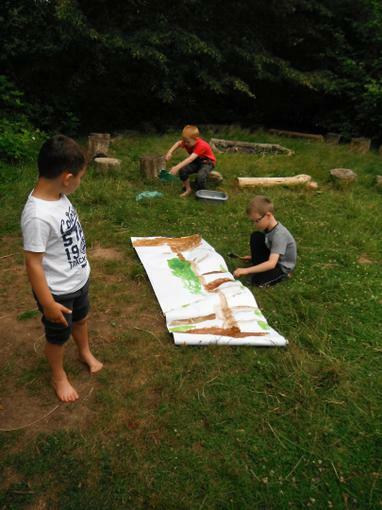 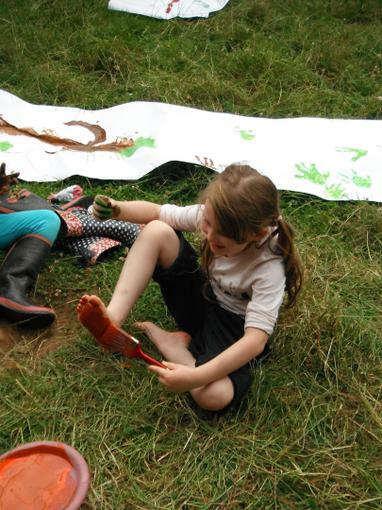 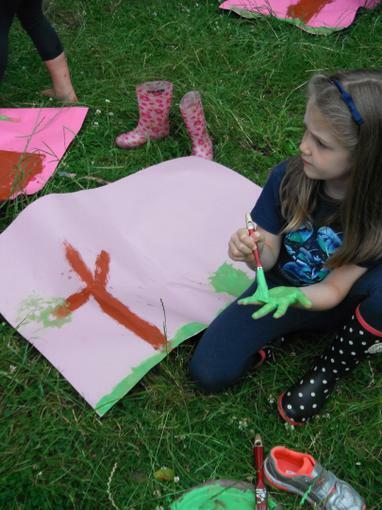 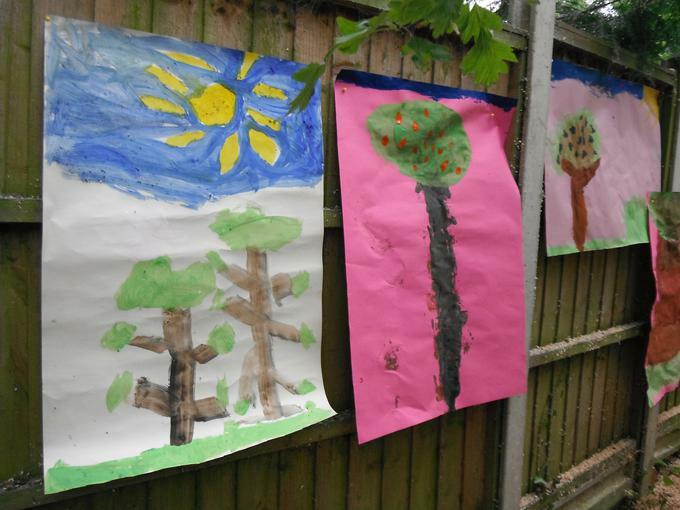 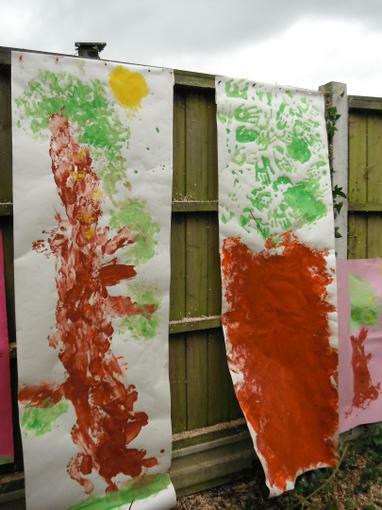 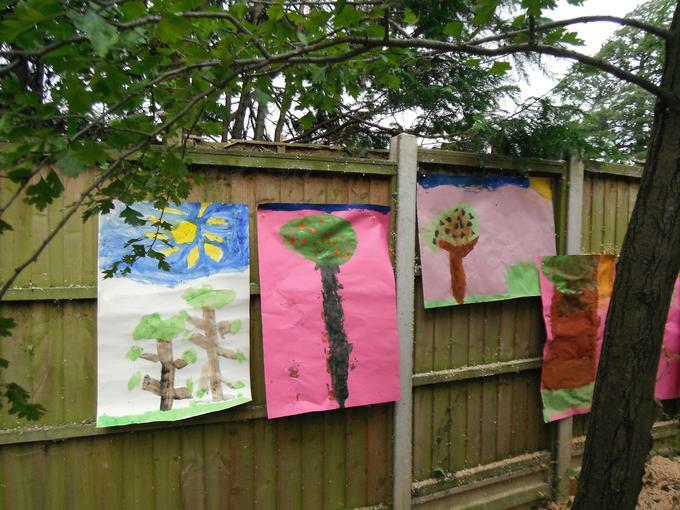 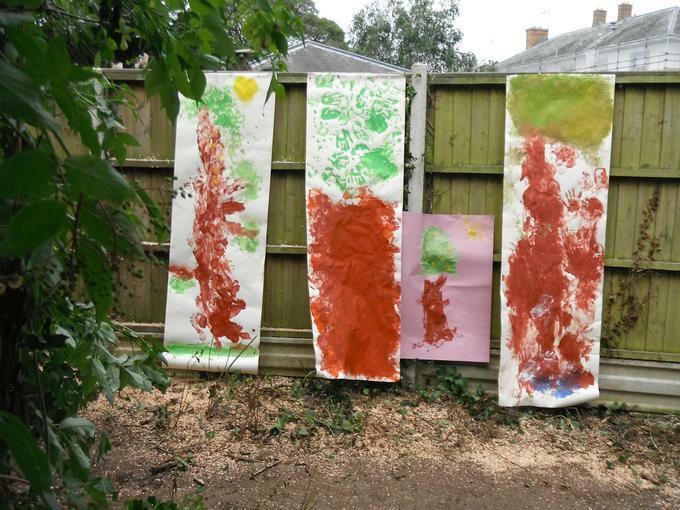 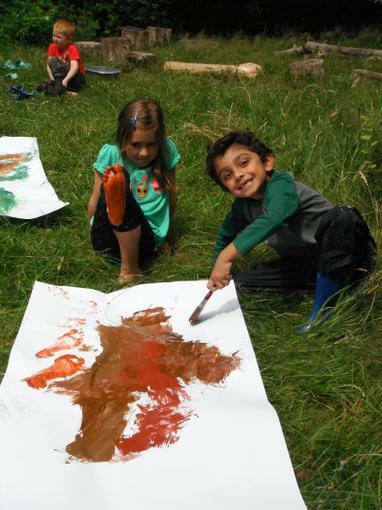 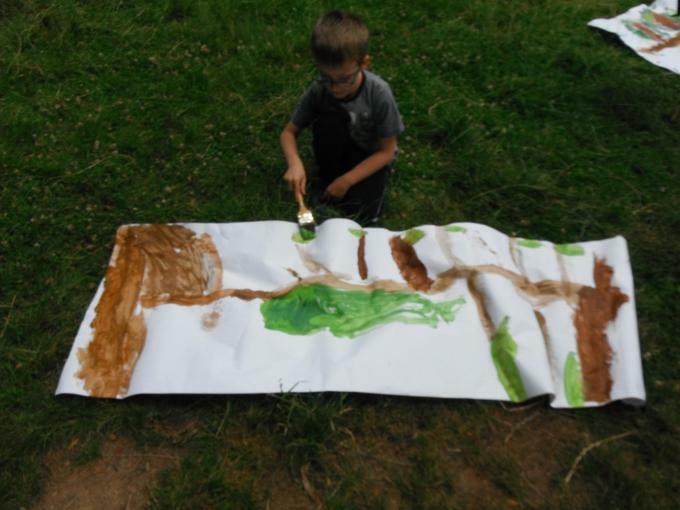 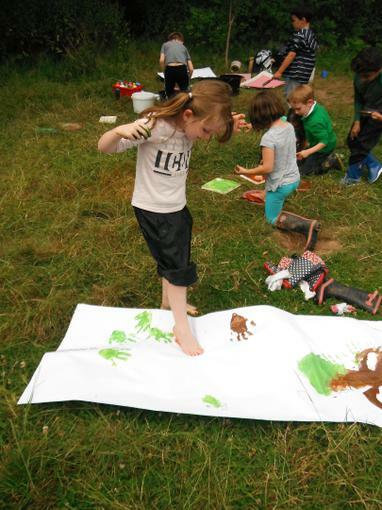 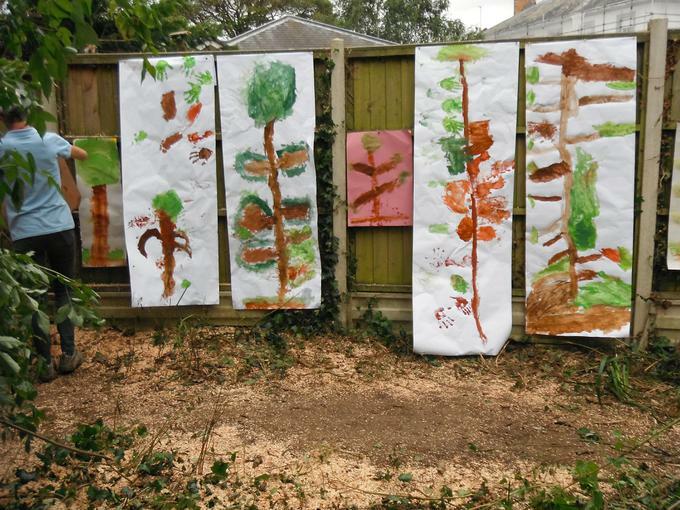 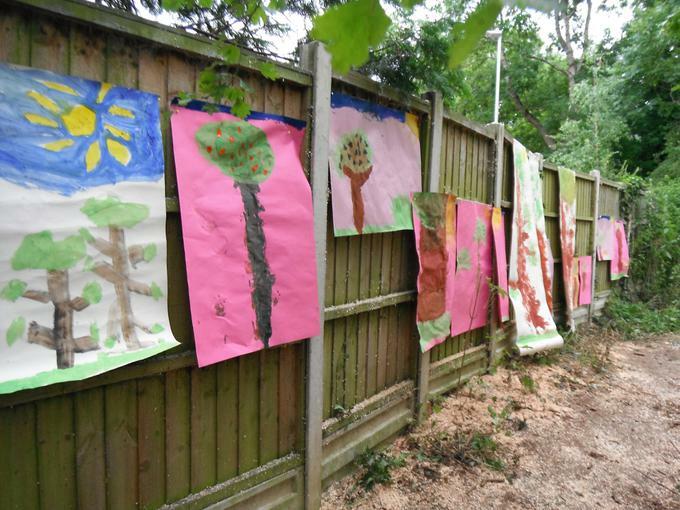 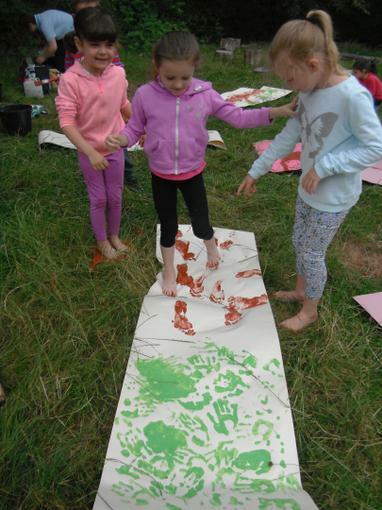 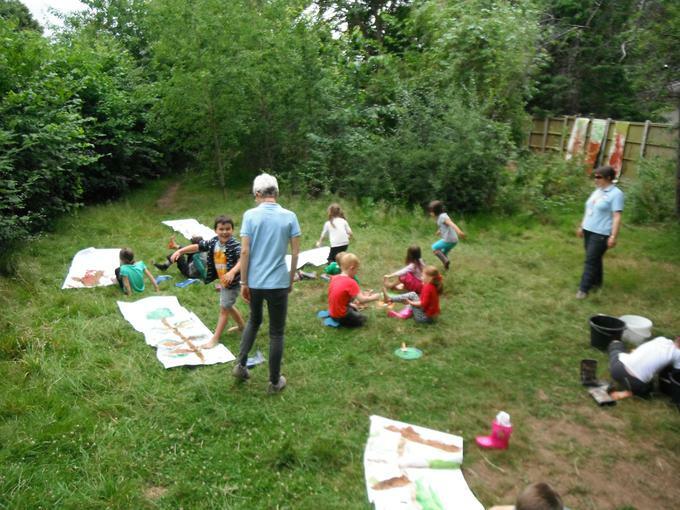 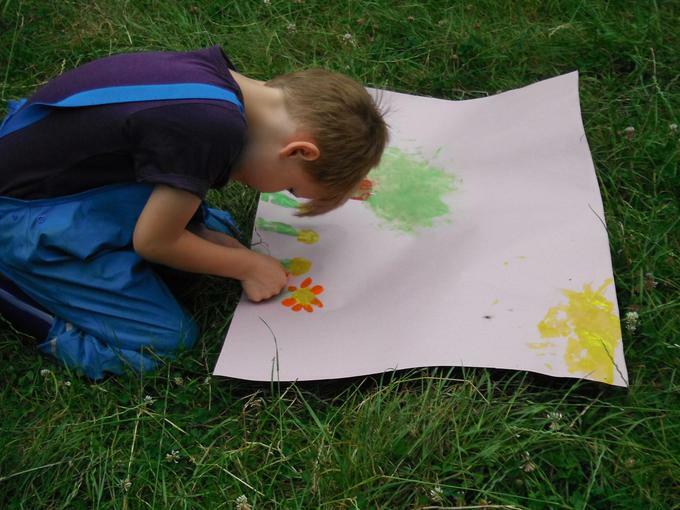 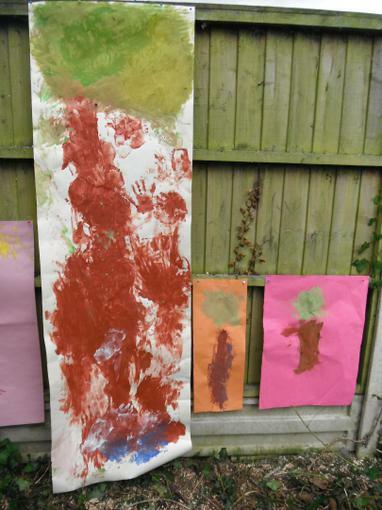 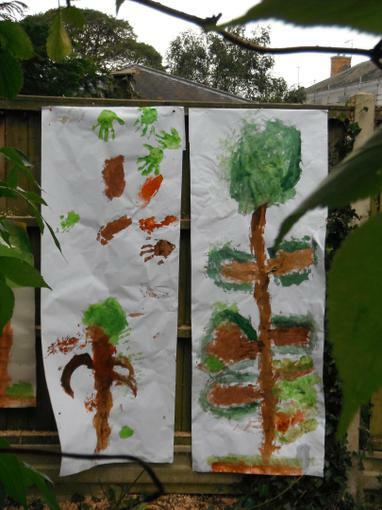 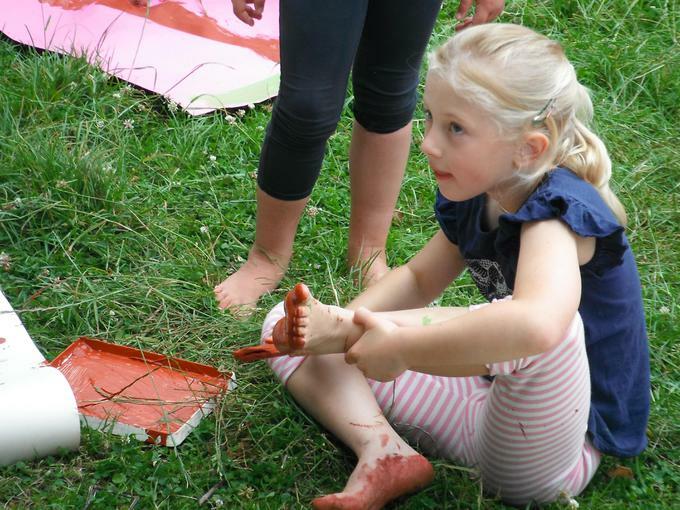 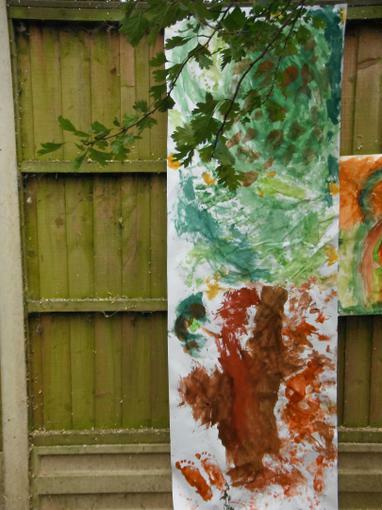 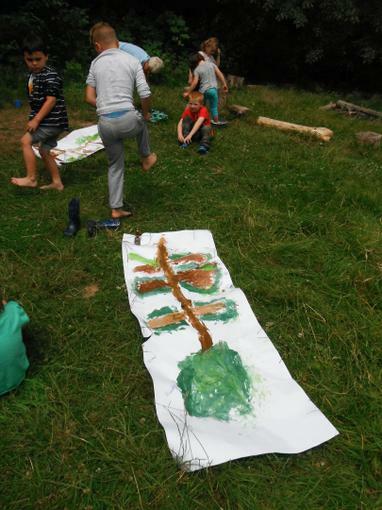 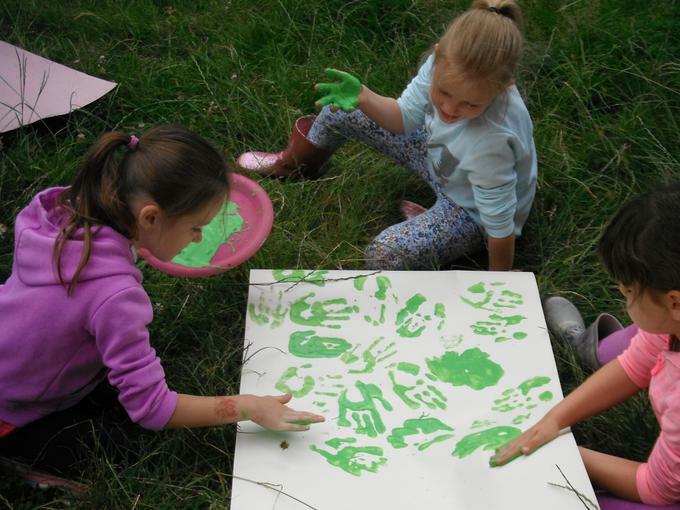 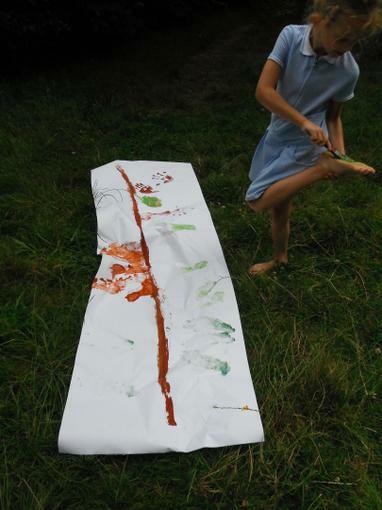 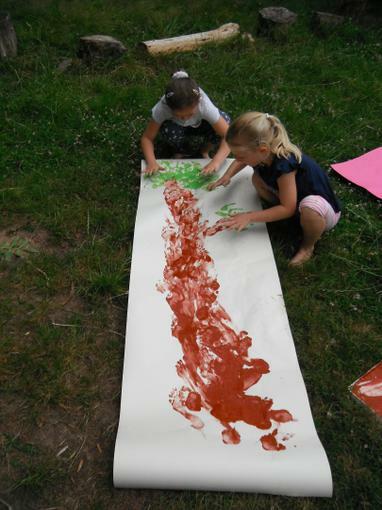 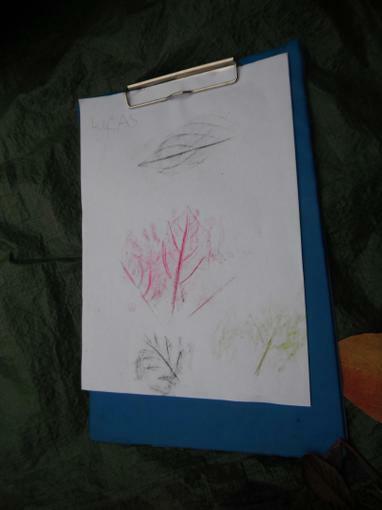 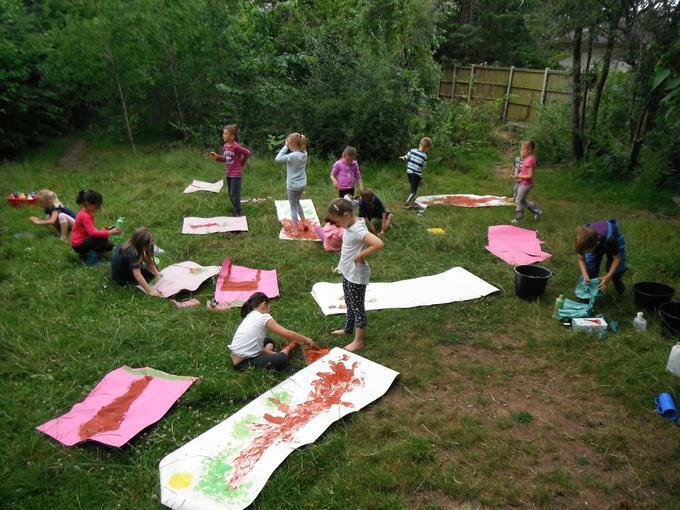 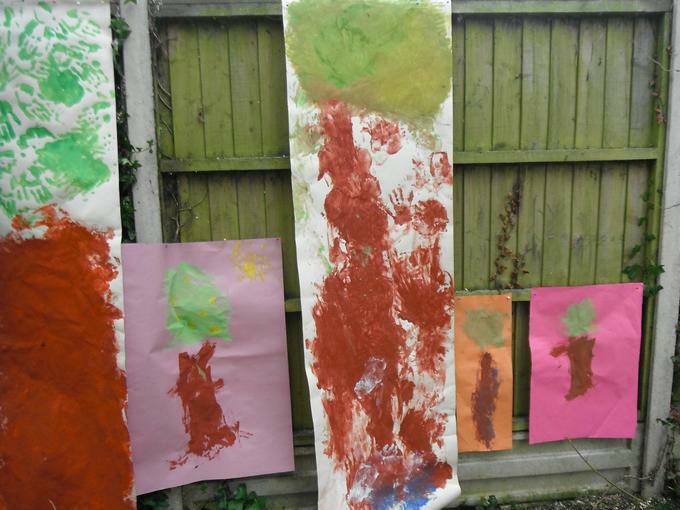 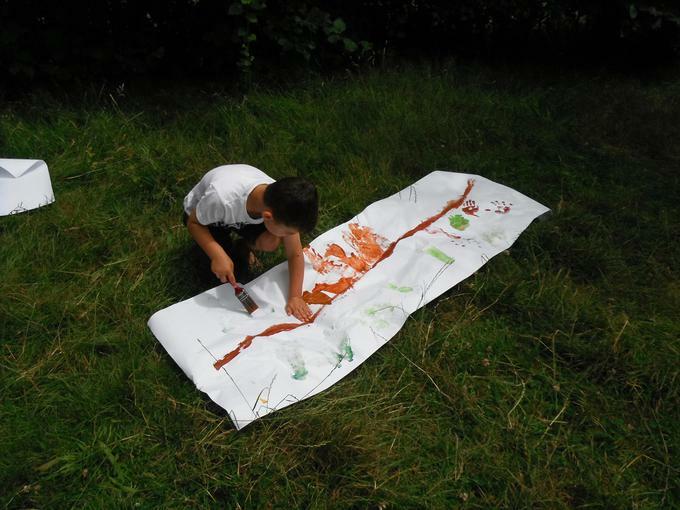 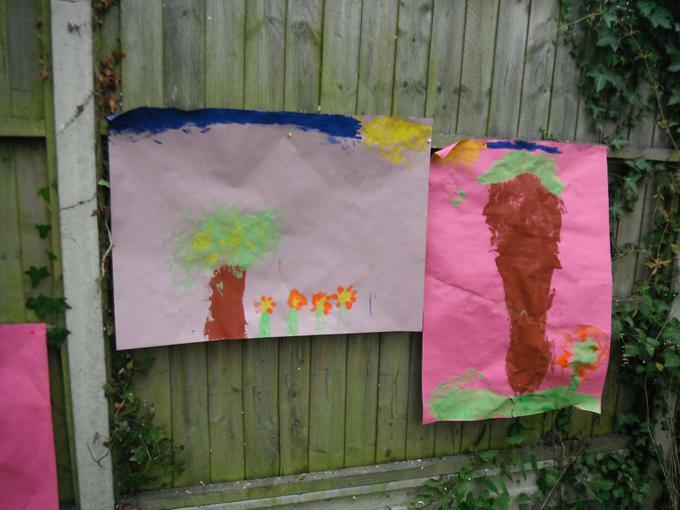 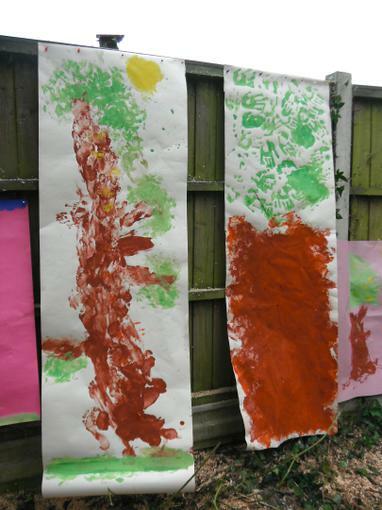 We decided to paint some new trees, and used our hands and feet as well as brushes! 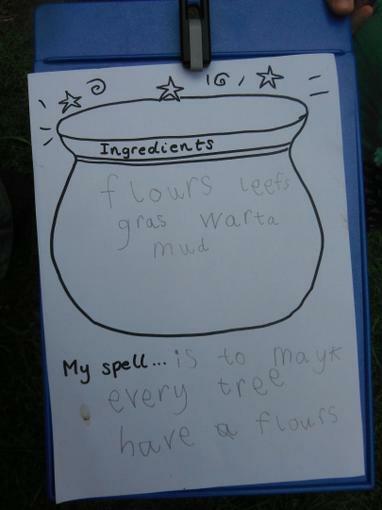 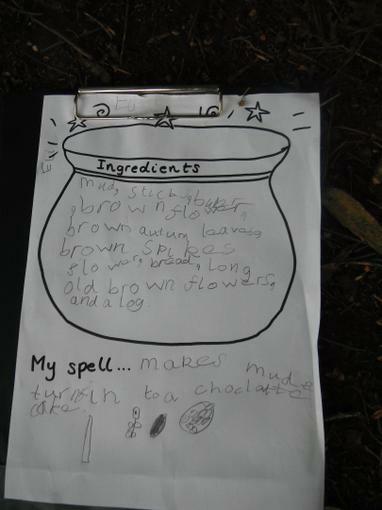 Magic wands, magic recipes and magic potions! 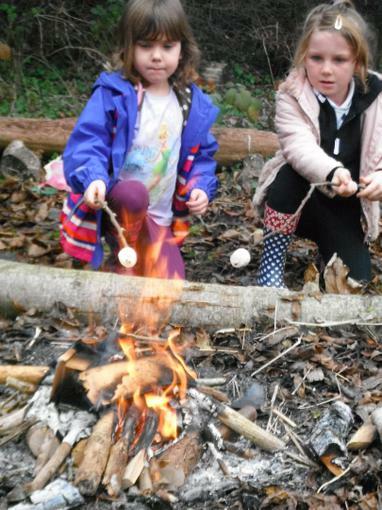 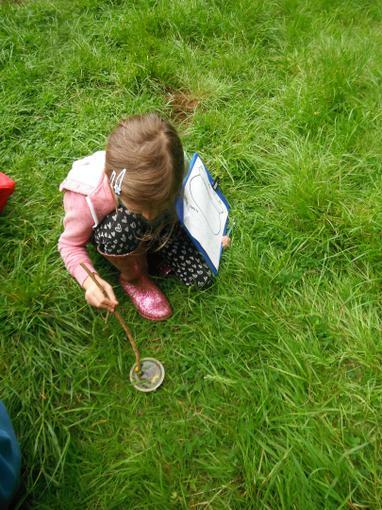 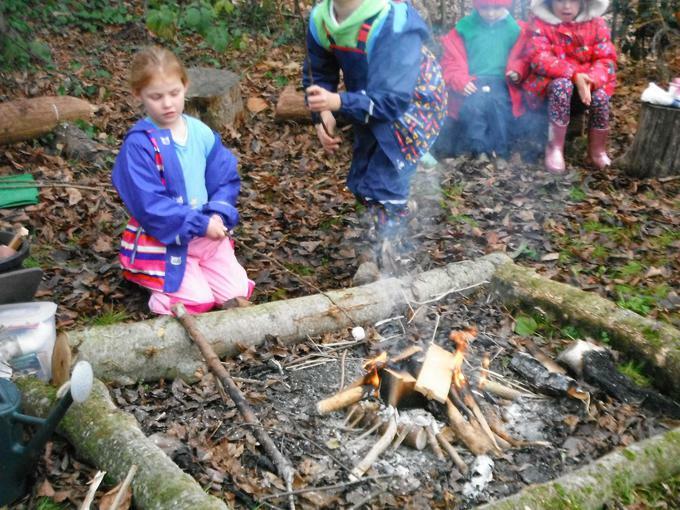 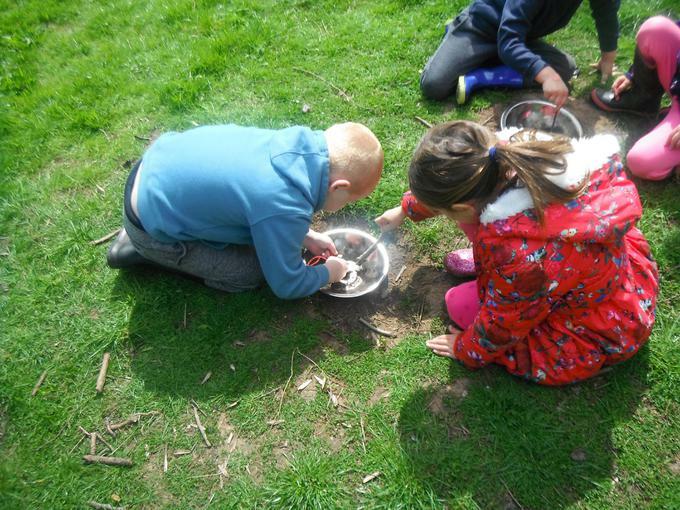 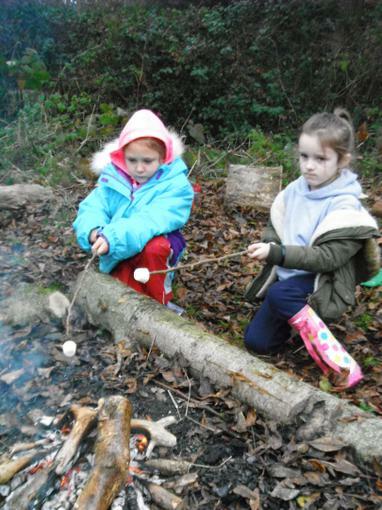 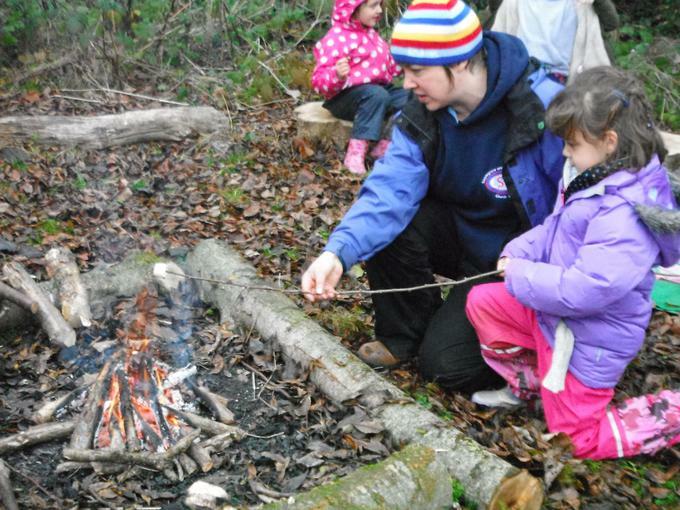 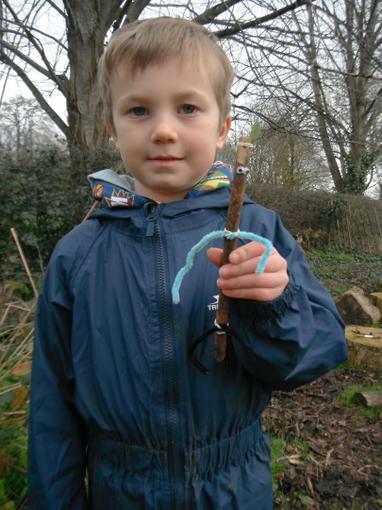 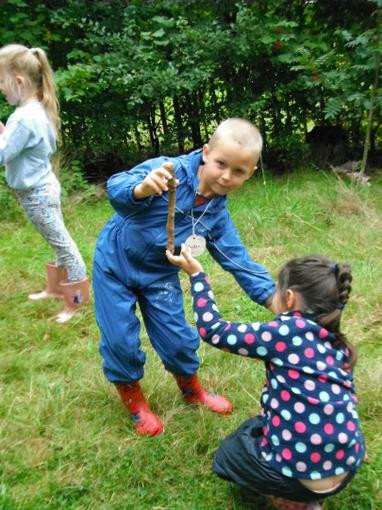 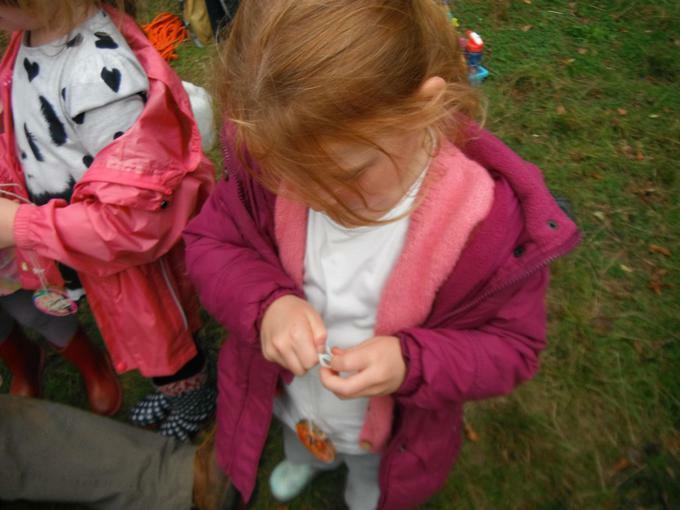 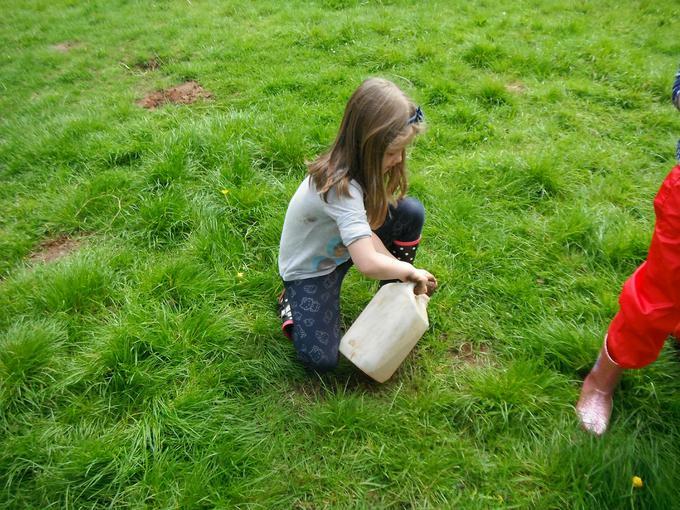 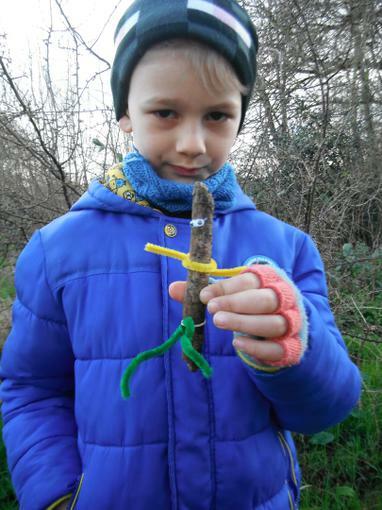 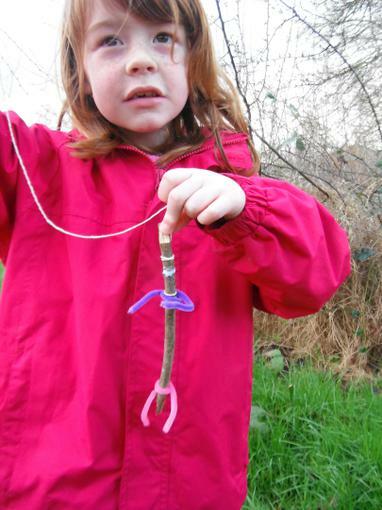 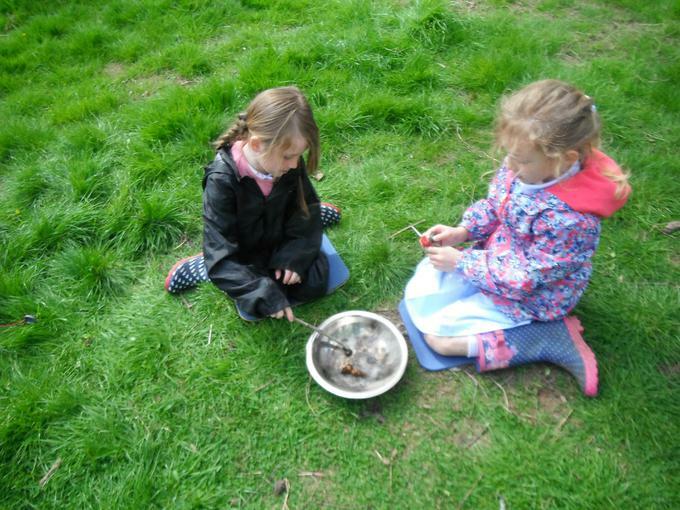 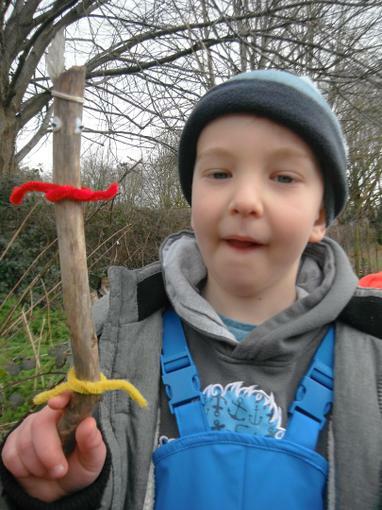 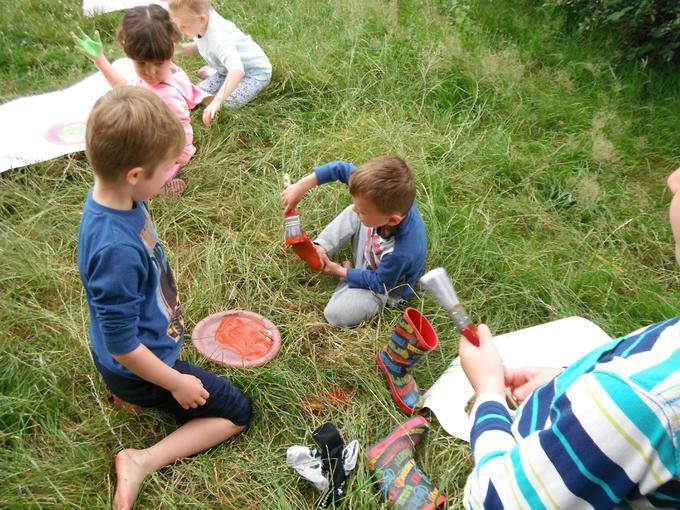 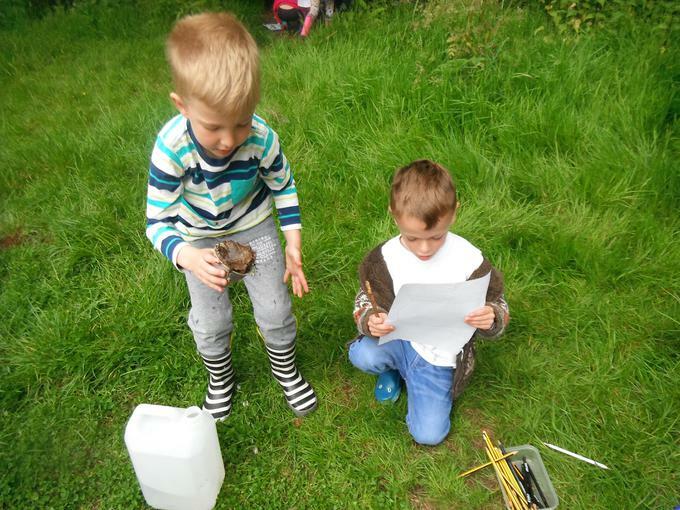 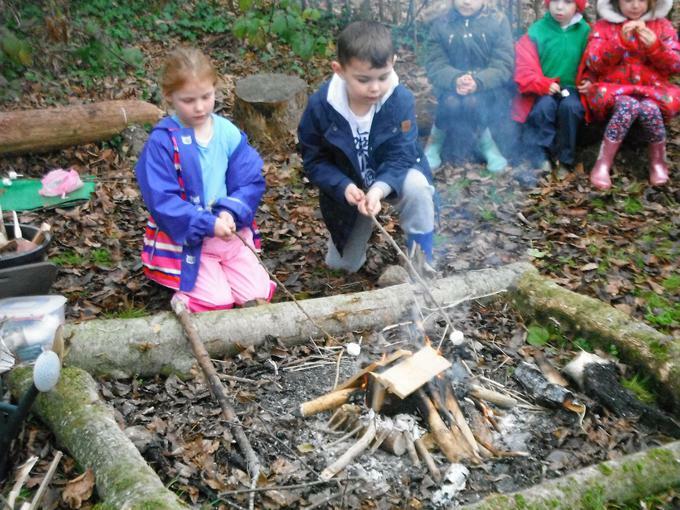 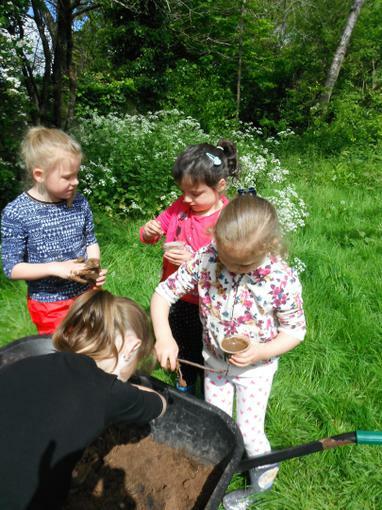 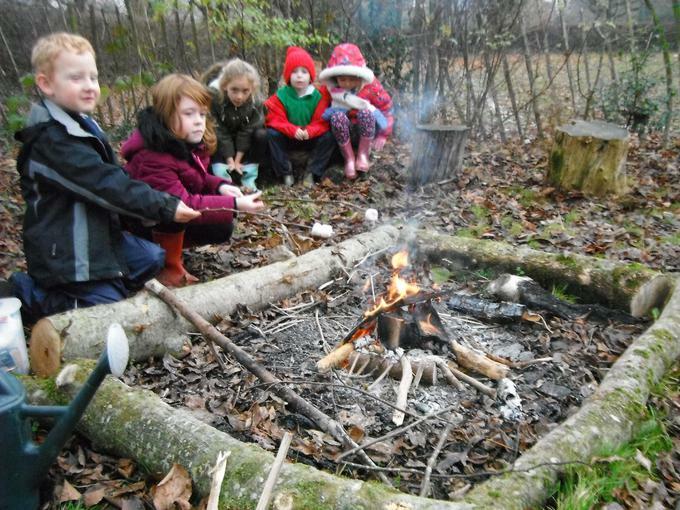 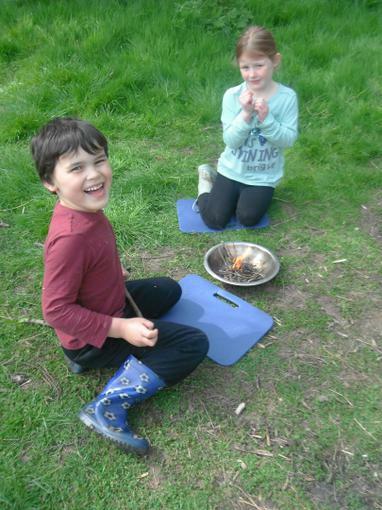 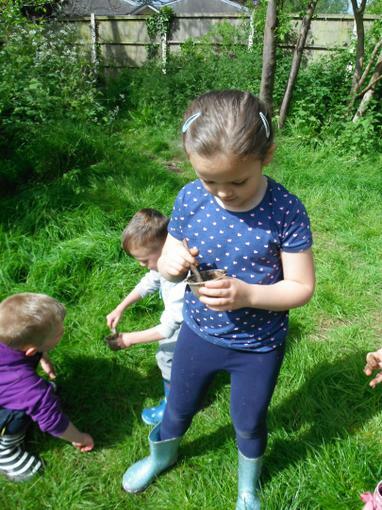 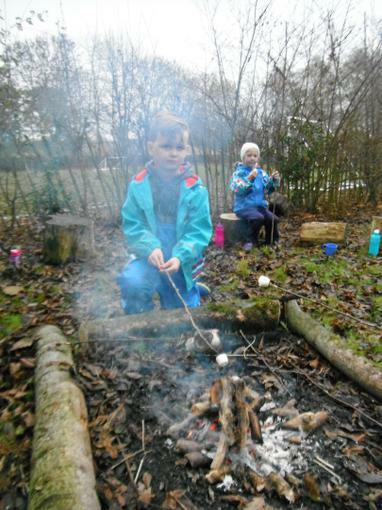 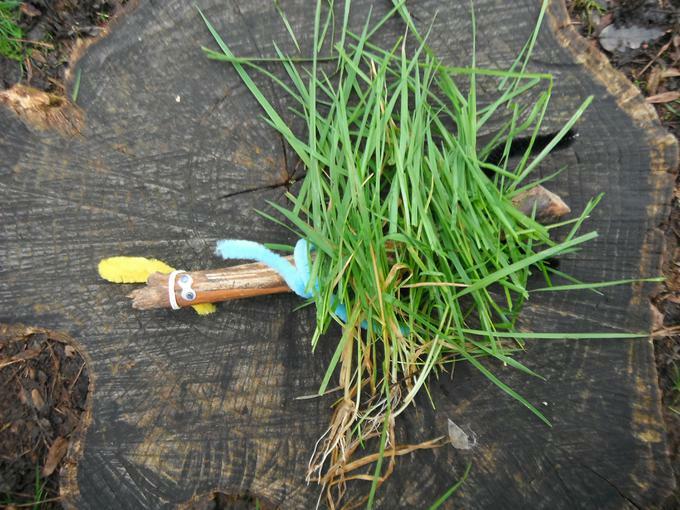 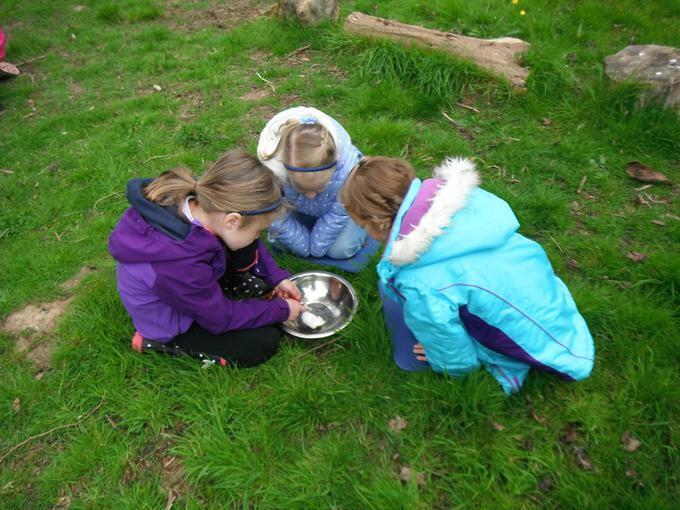 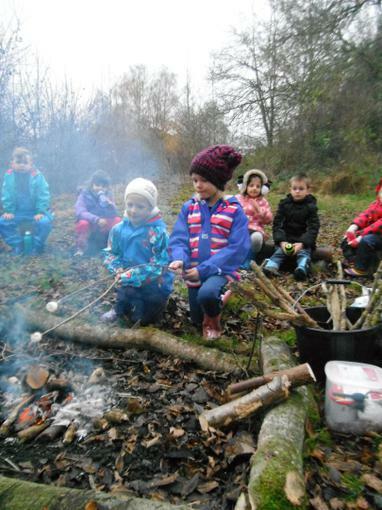 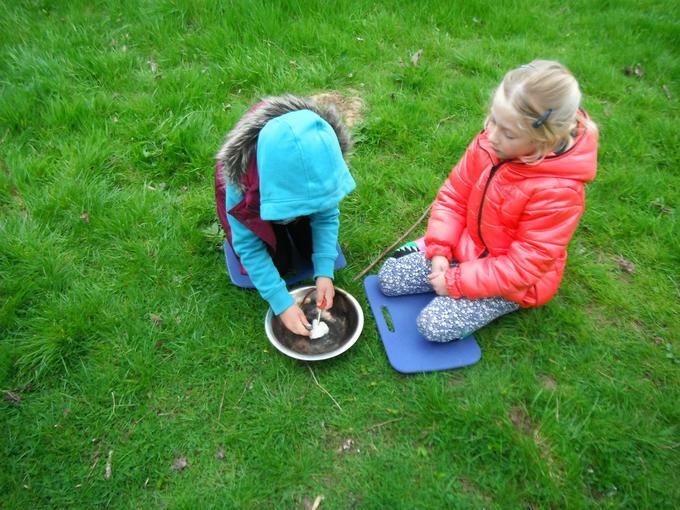 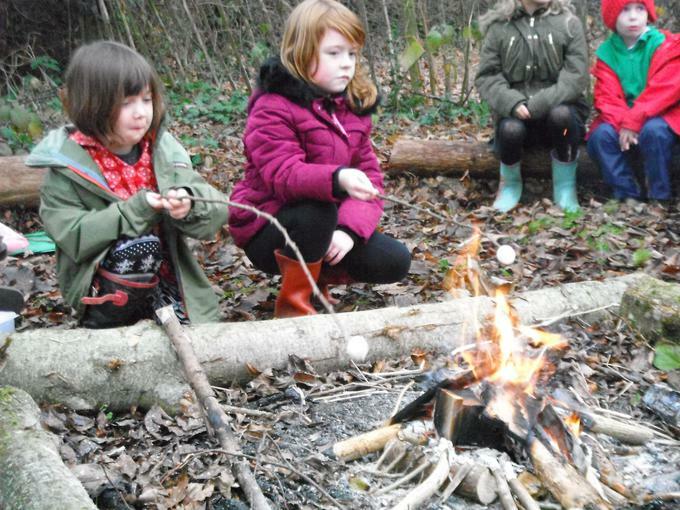 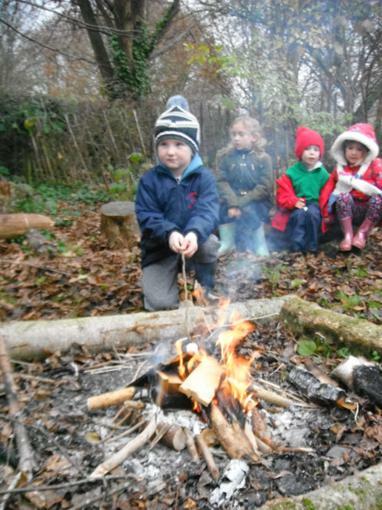 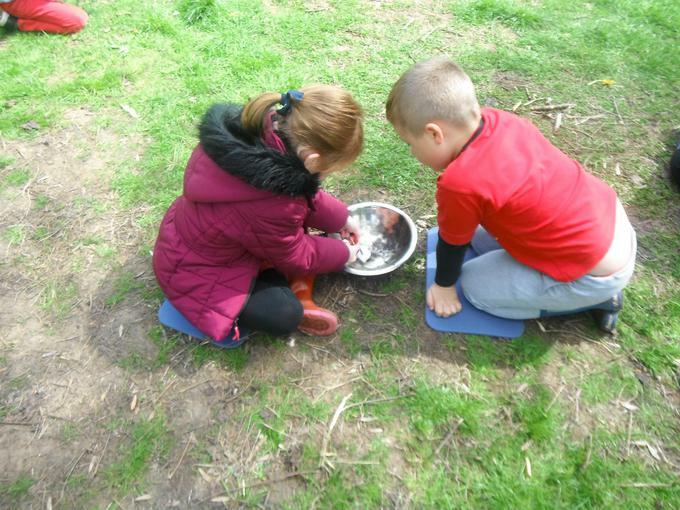 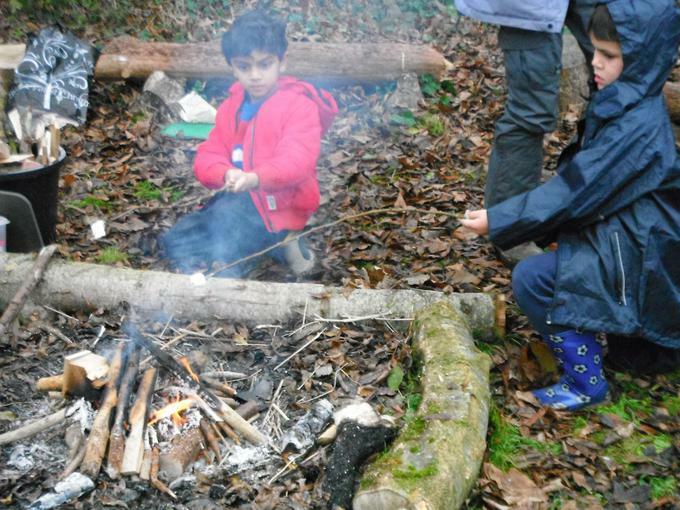 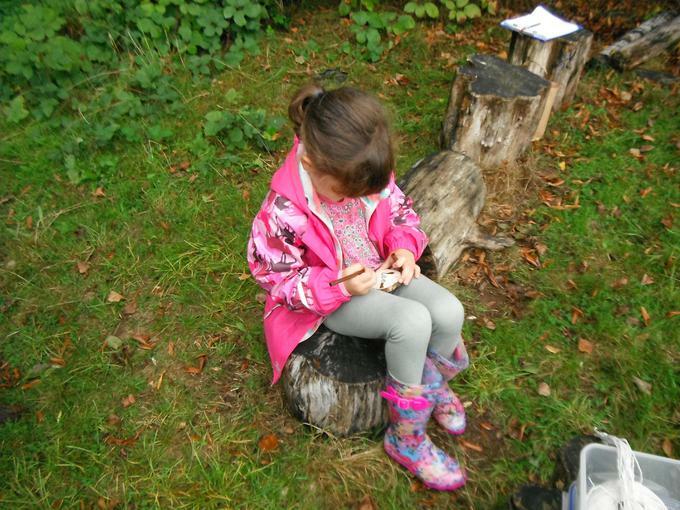 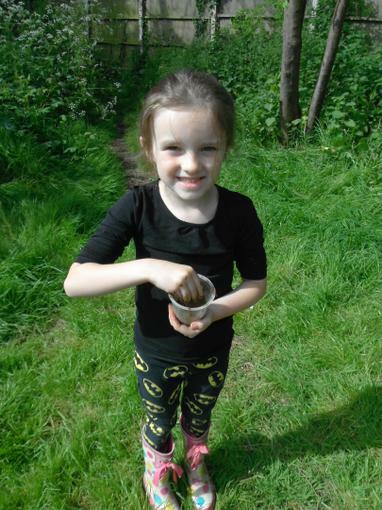 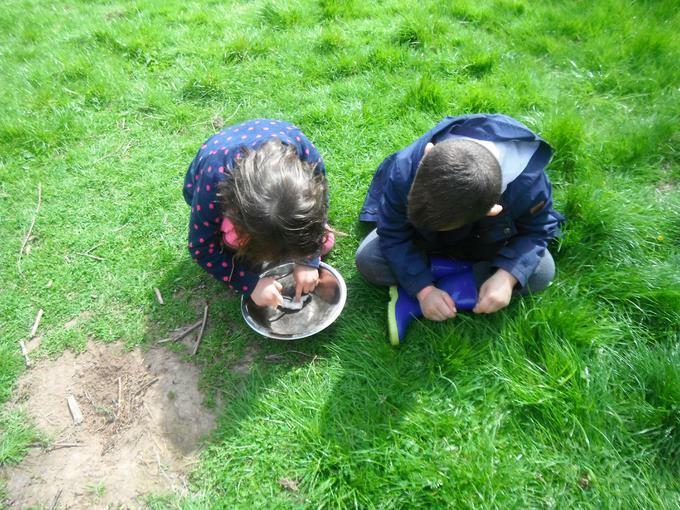 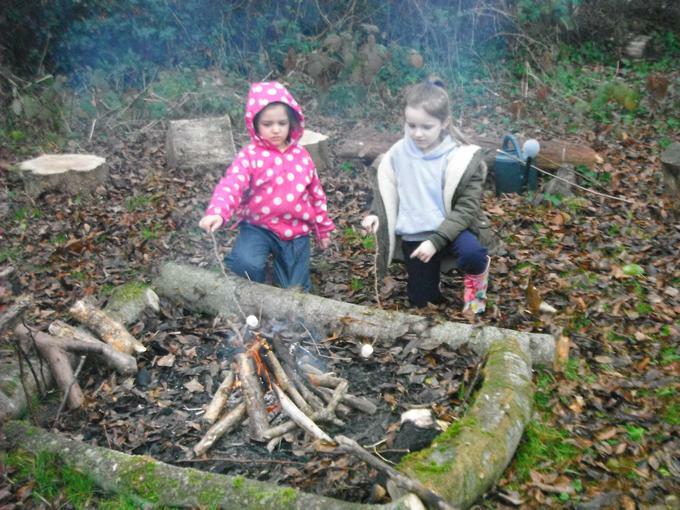 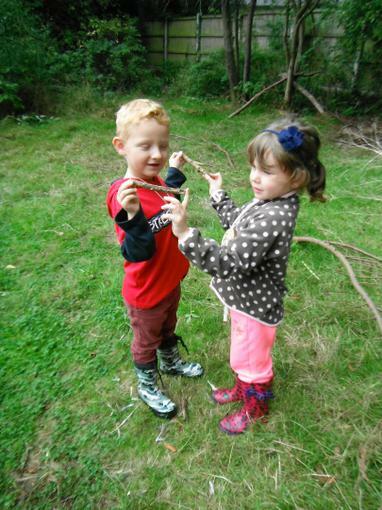 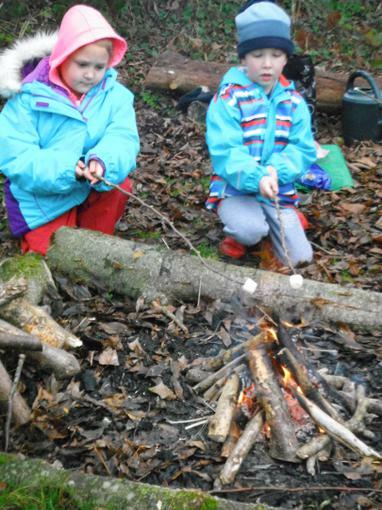 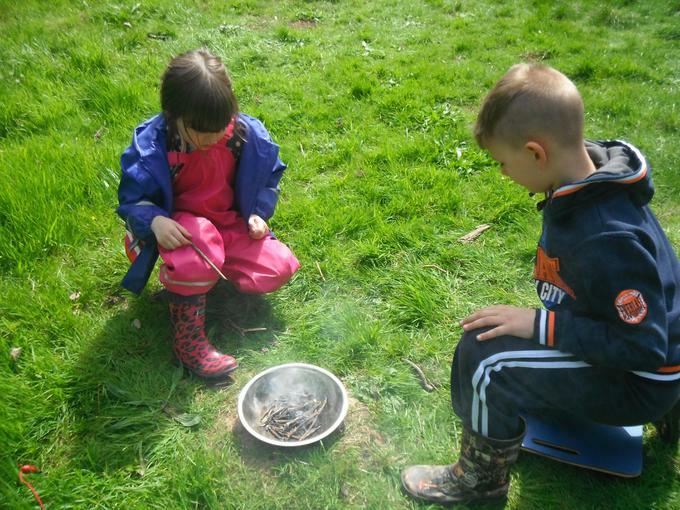 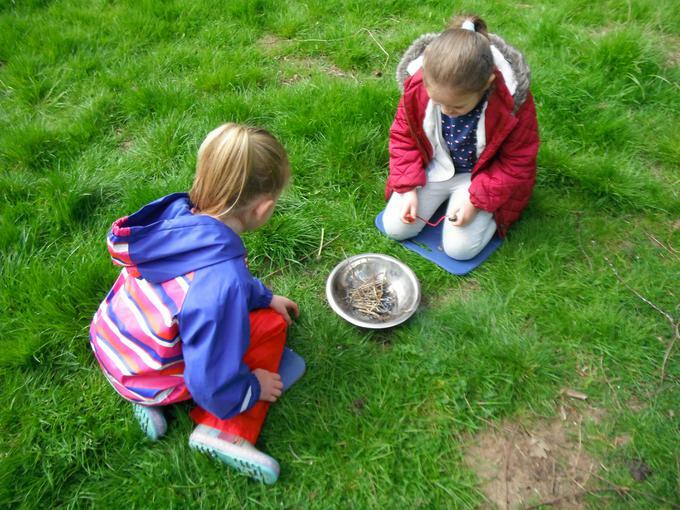 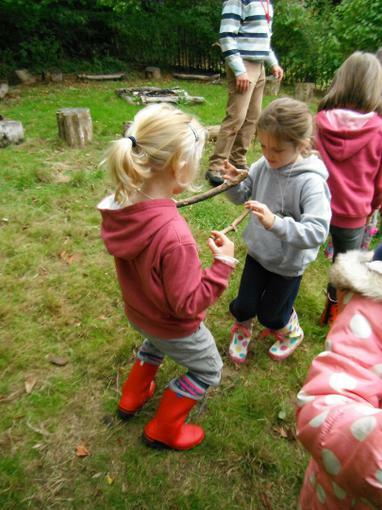 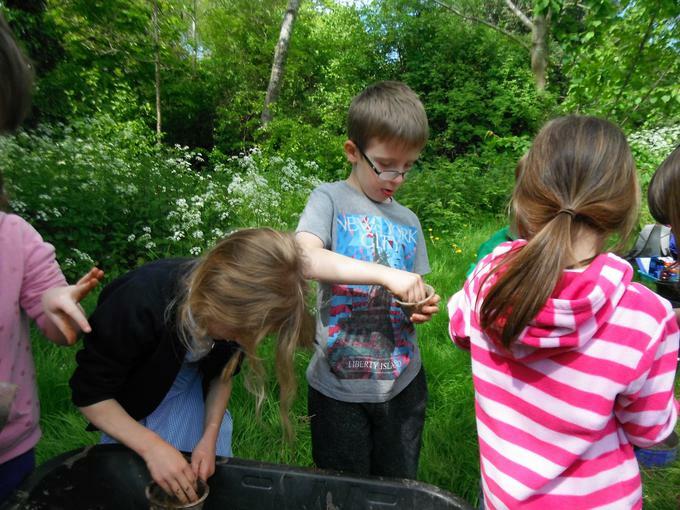 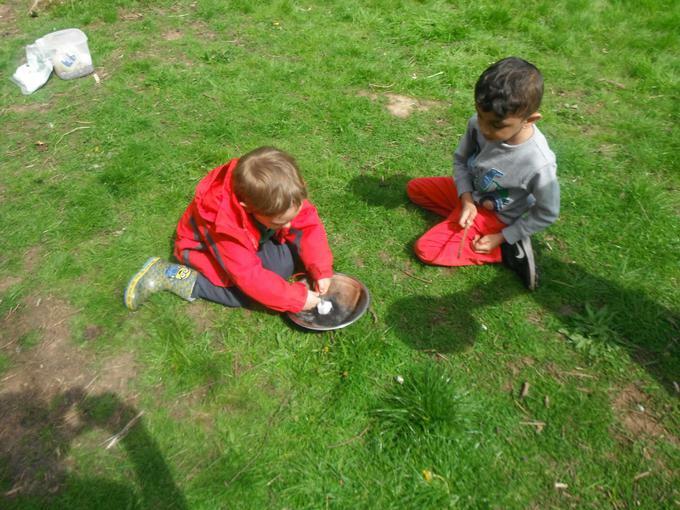 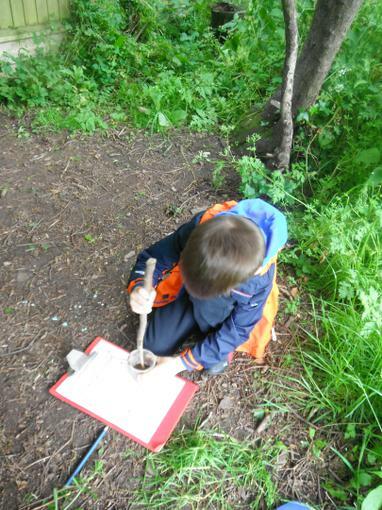 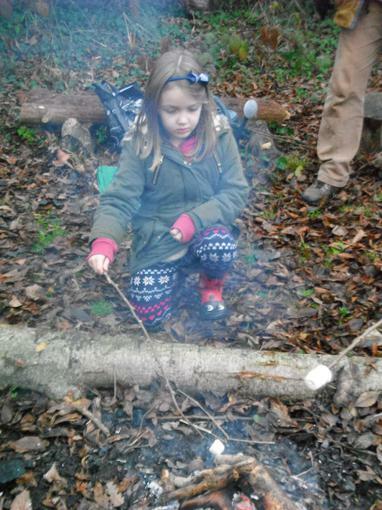 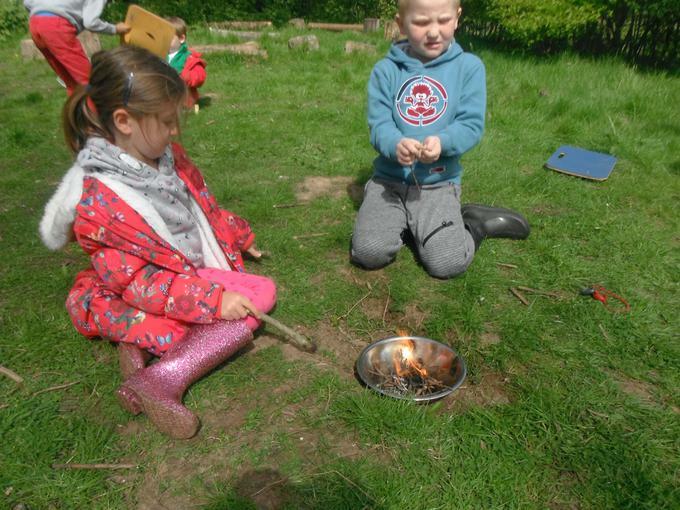 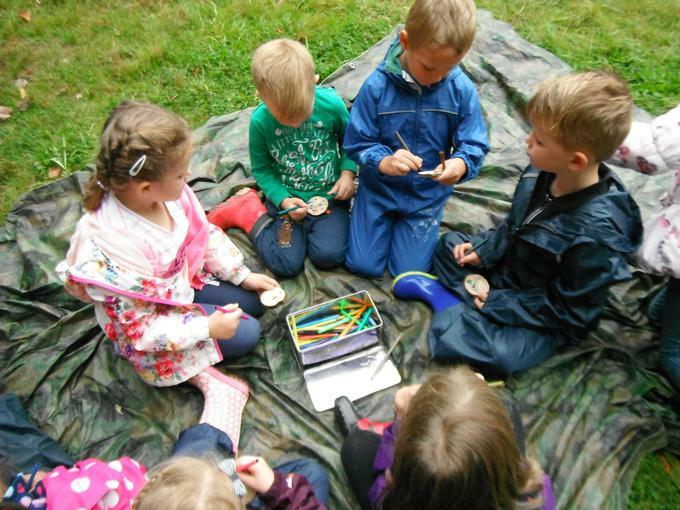 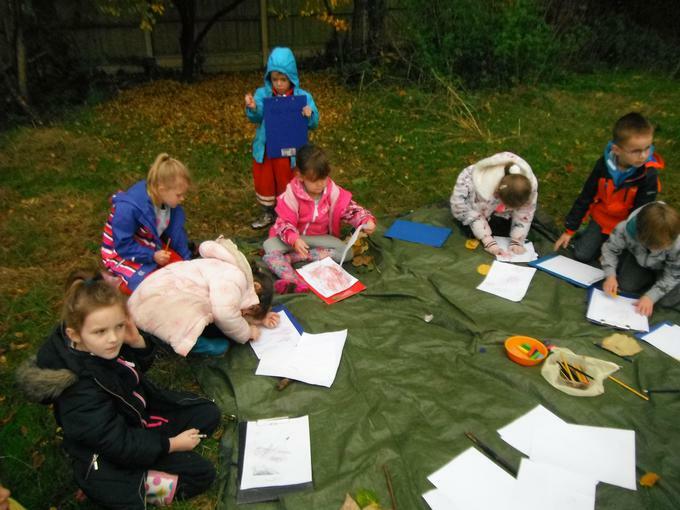 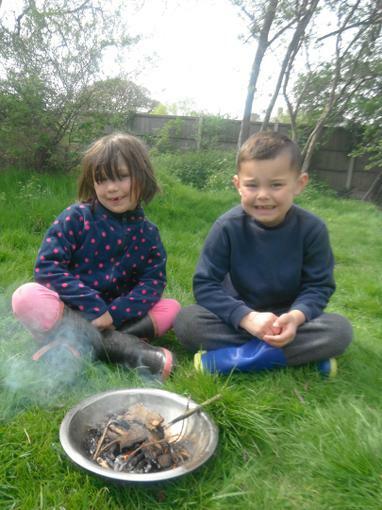 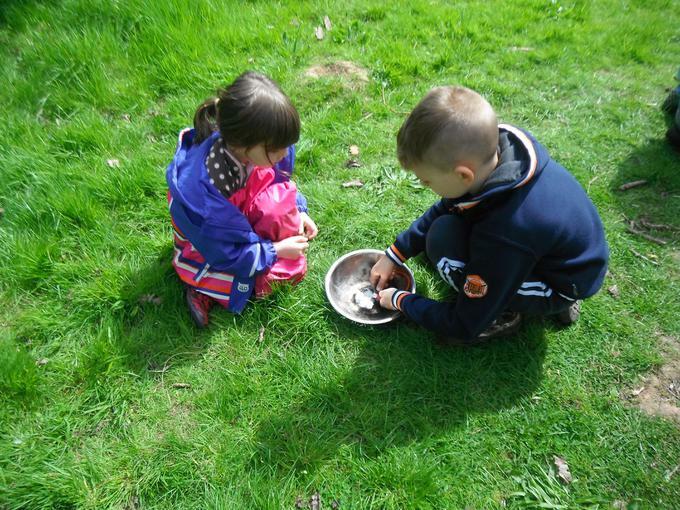 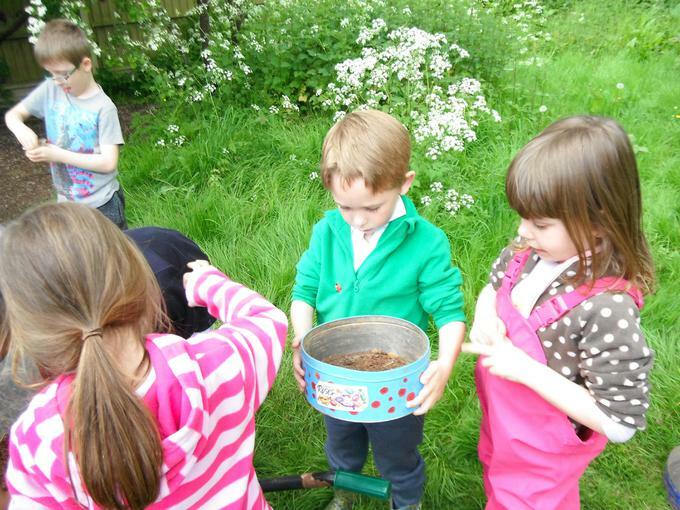 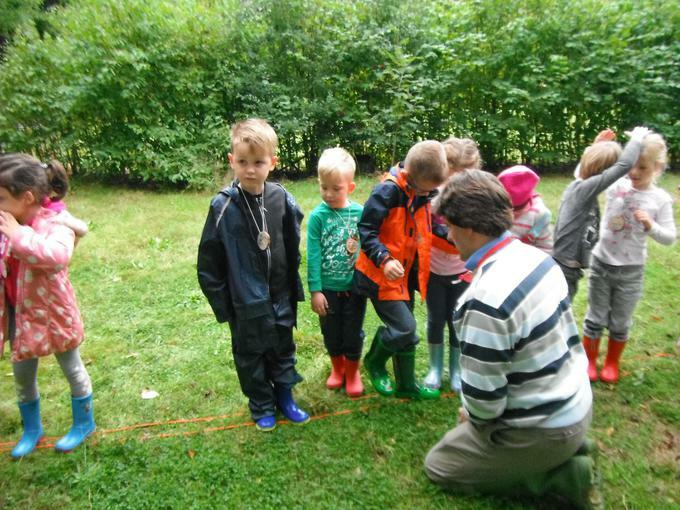 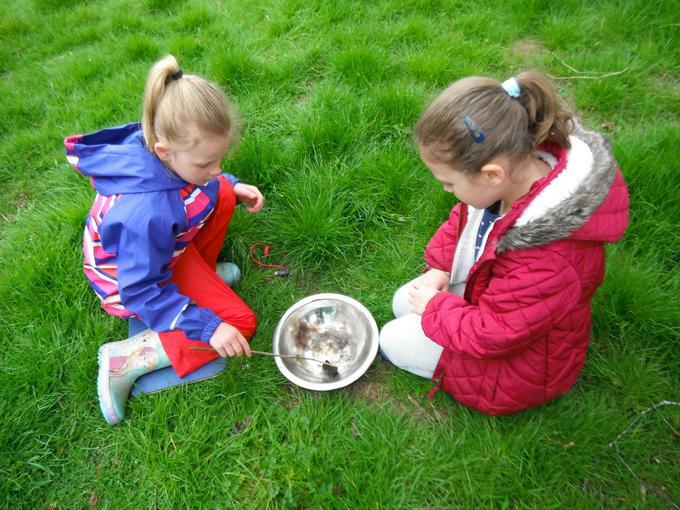 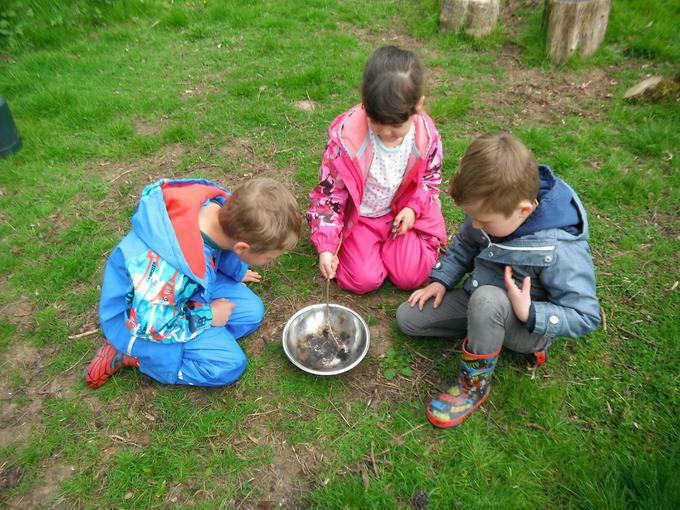 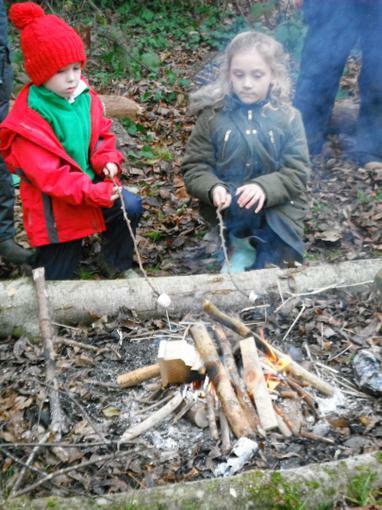 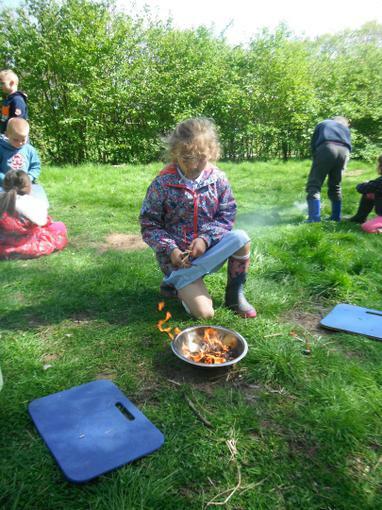 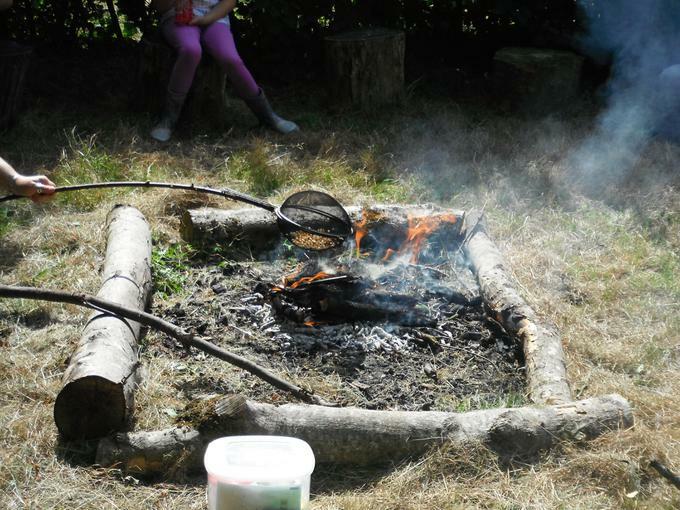 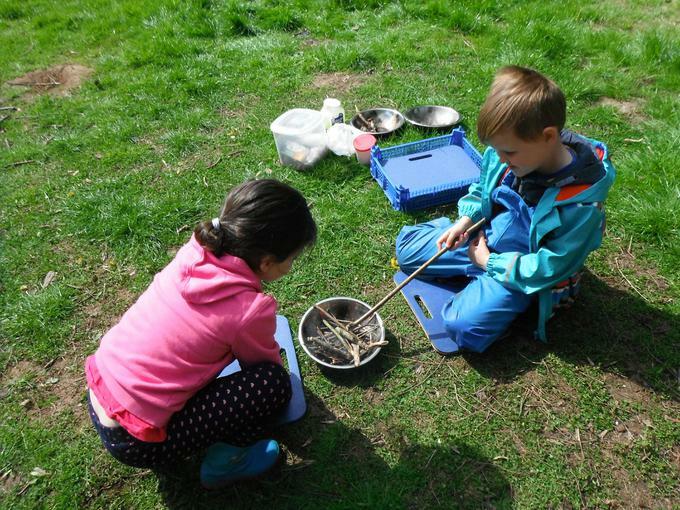 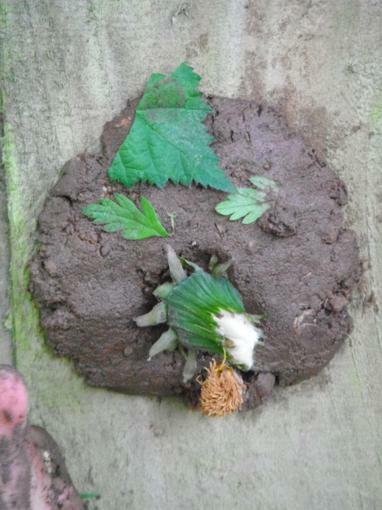 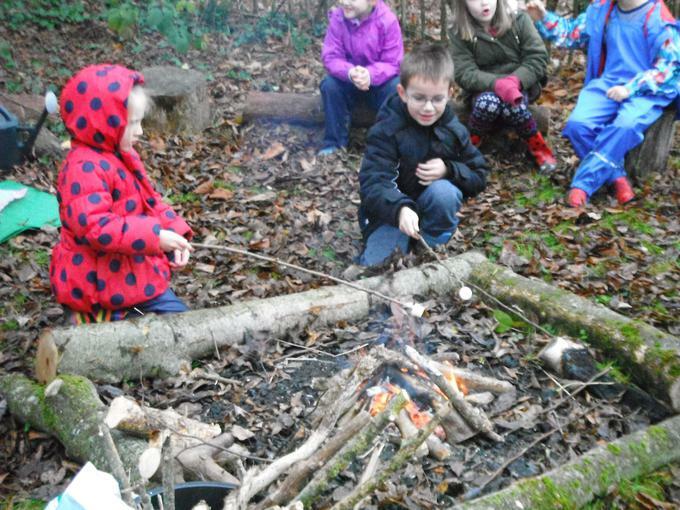 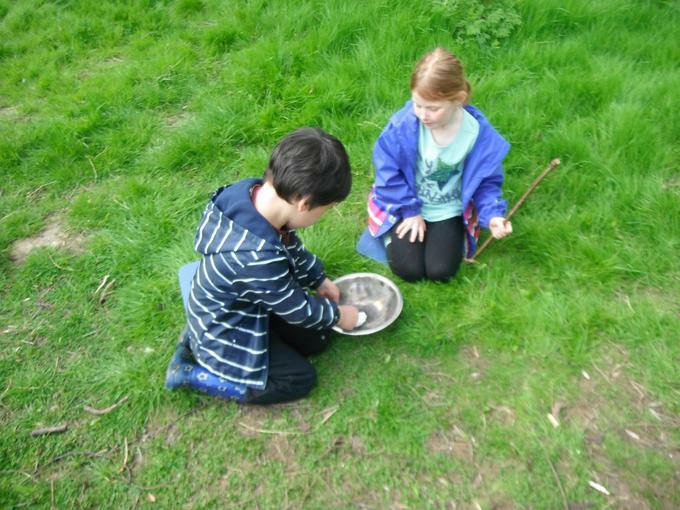 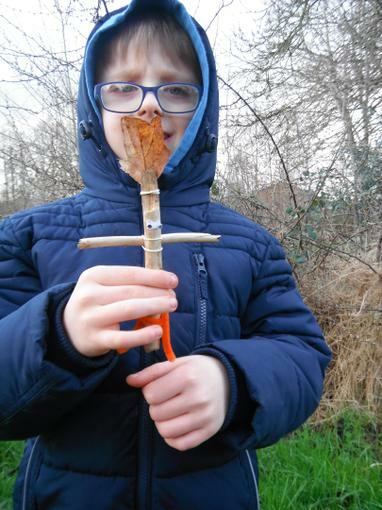 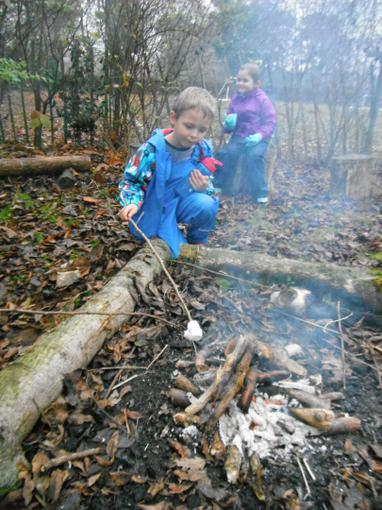 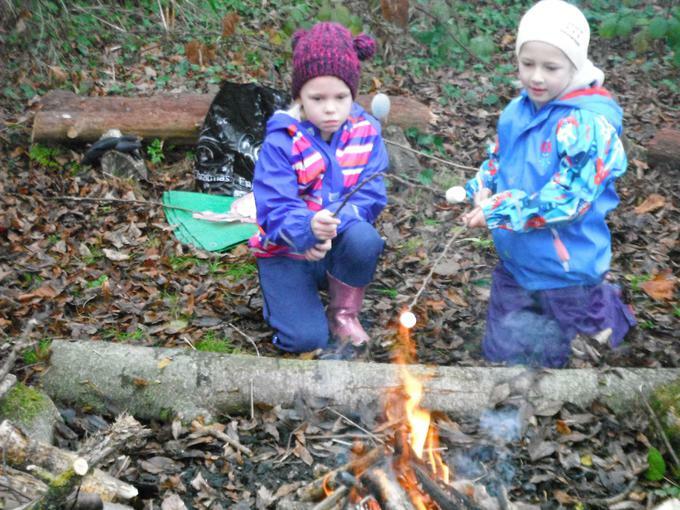 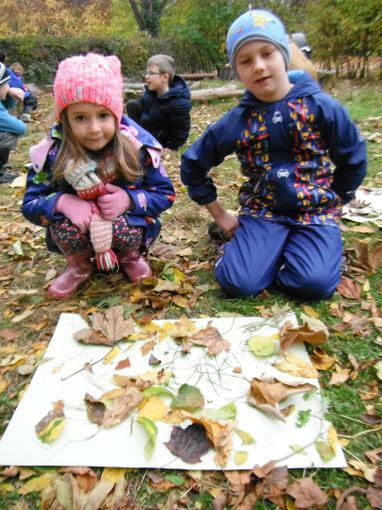 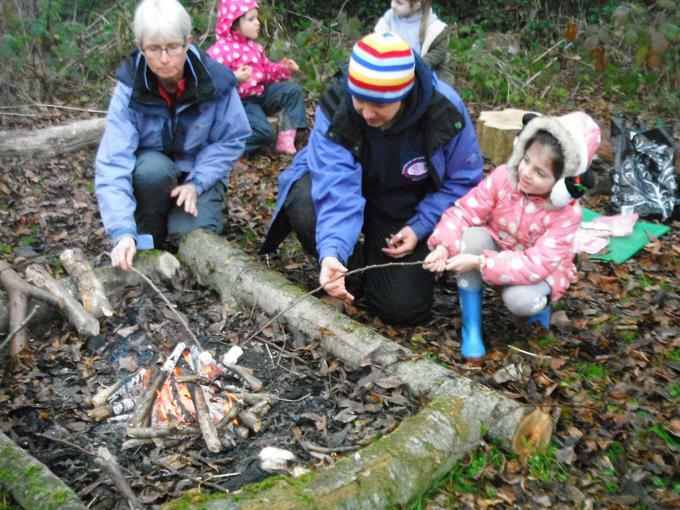 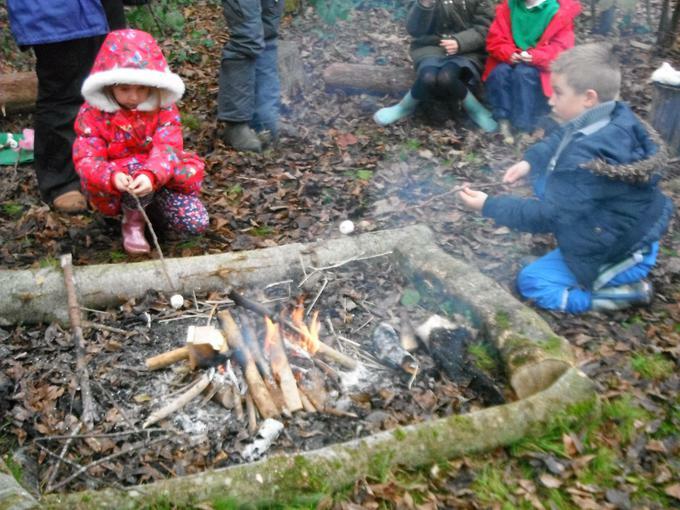 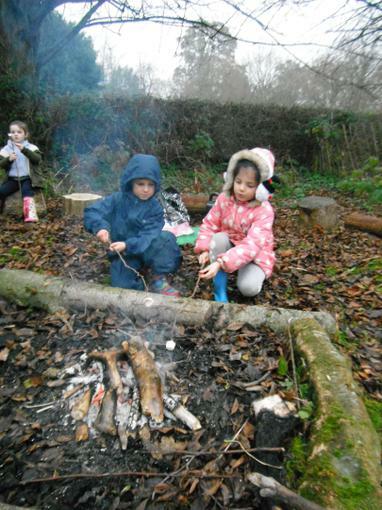 In small groups, the children used a fire steel to make a small fire. 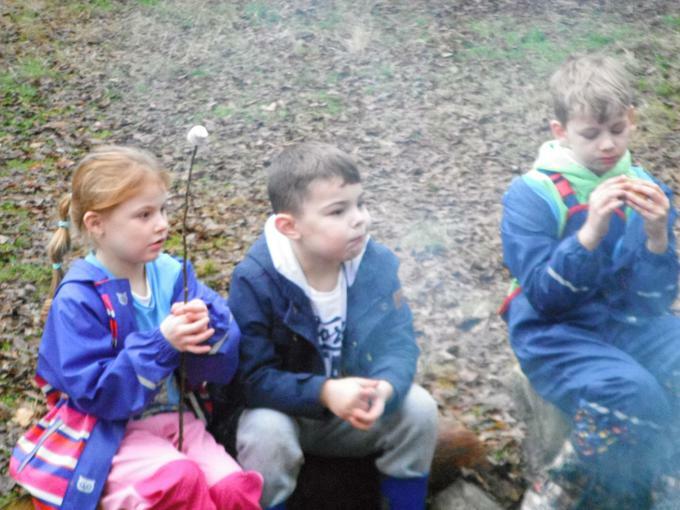 Initially setting fire to a piece of cotton wool. 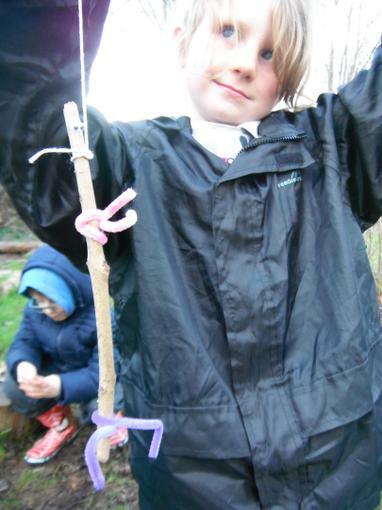 Next they added Vaseline to another piece of cotton wool, which allowed them to add small amounts of fuel. 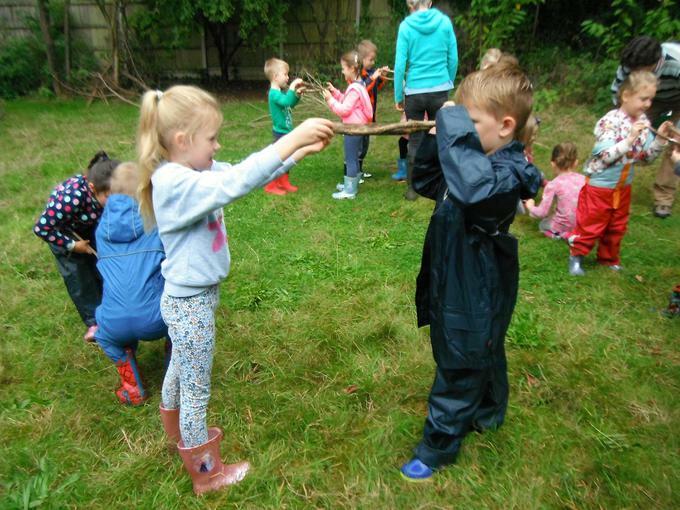 help each other and celebrate success. 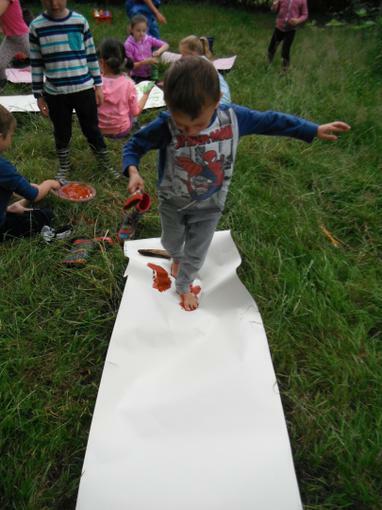 And it was great fun too! 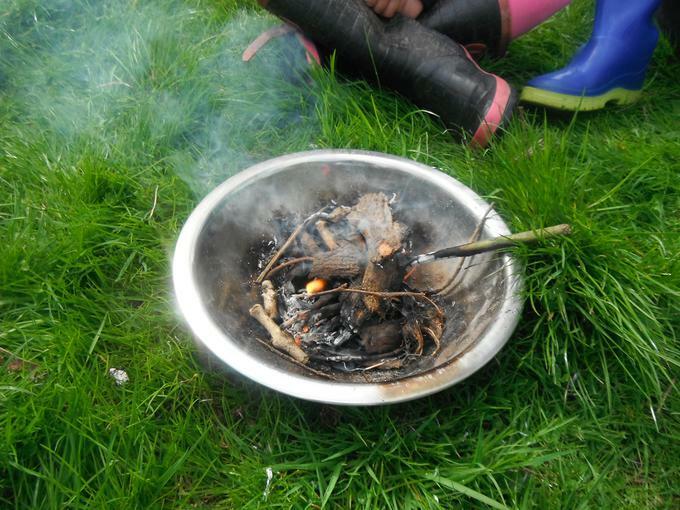 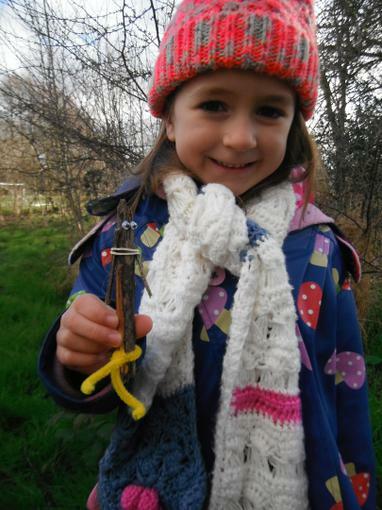 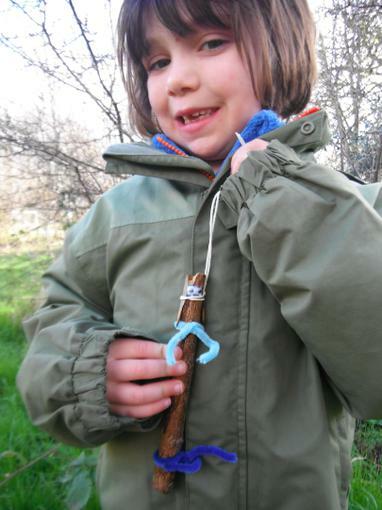 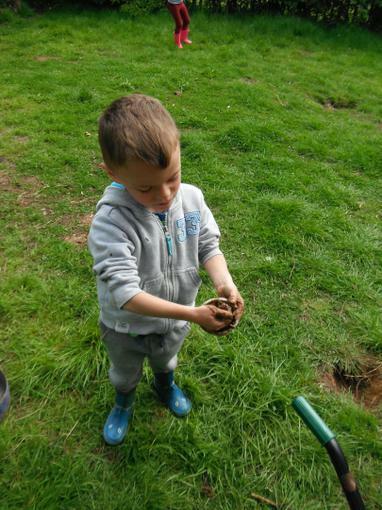 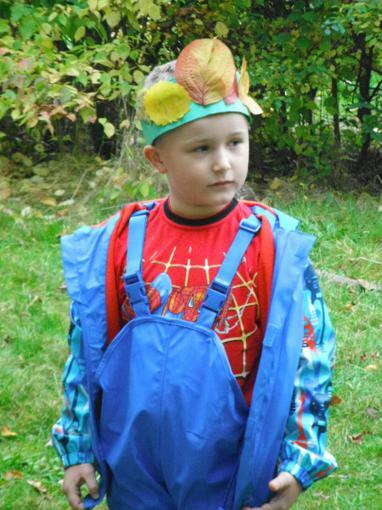 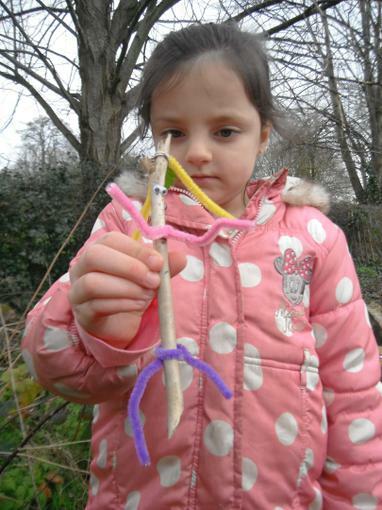 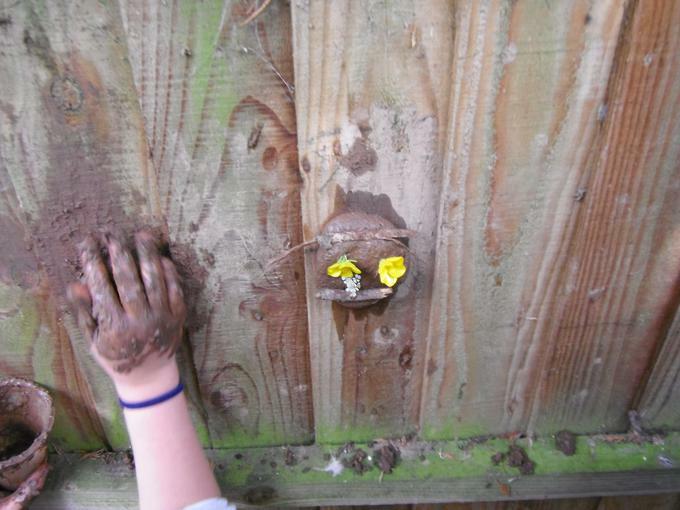 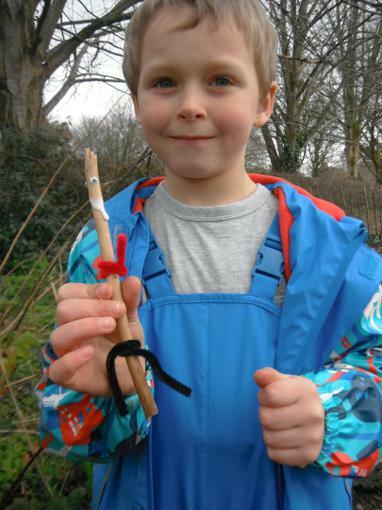 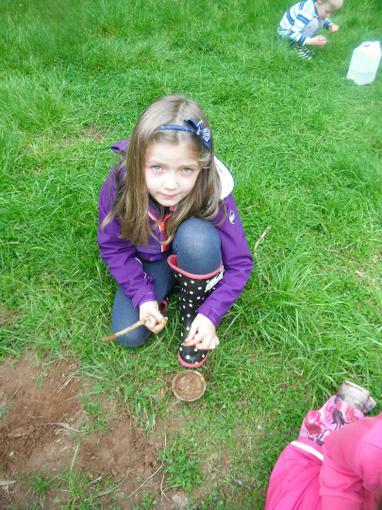 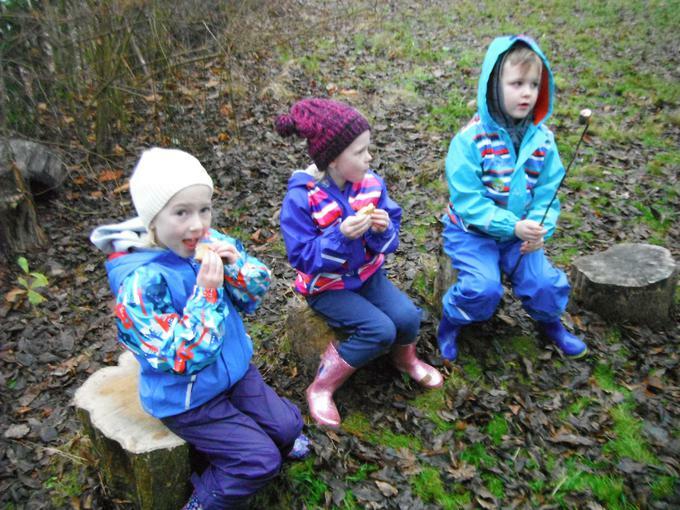 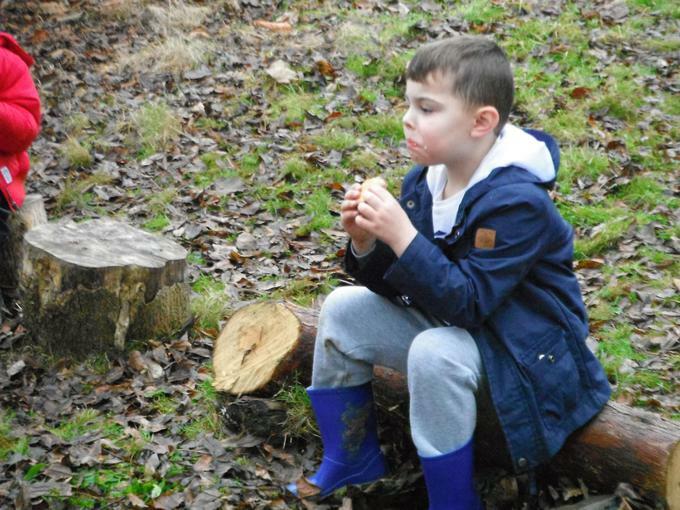 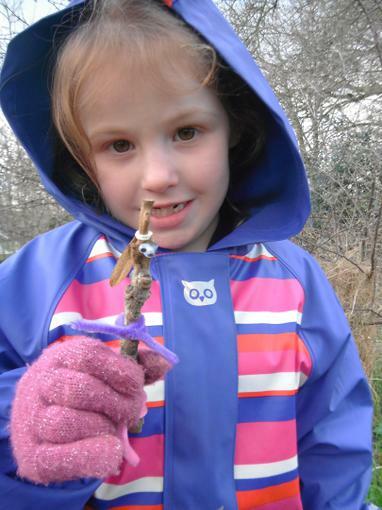 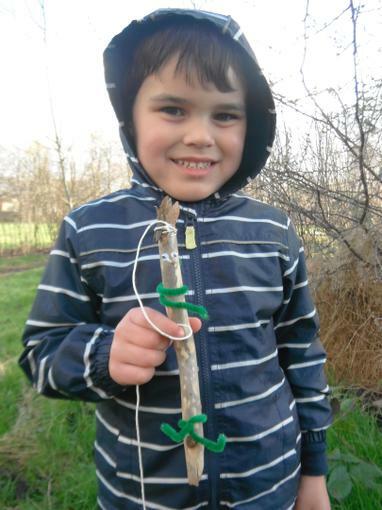 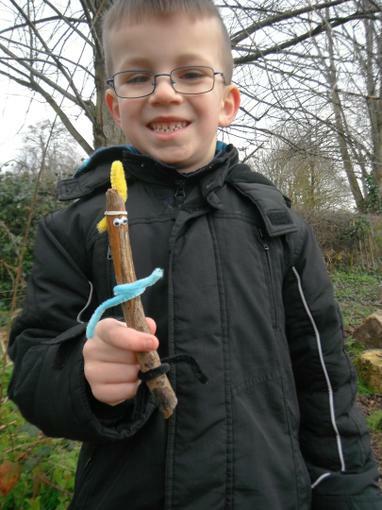 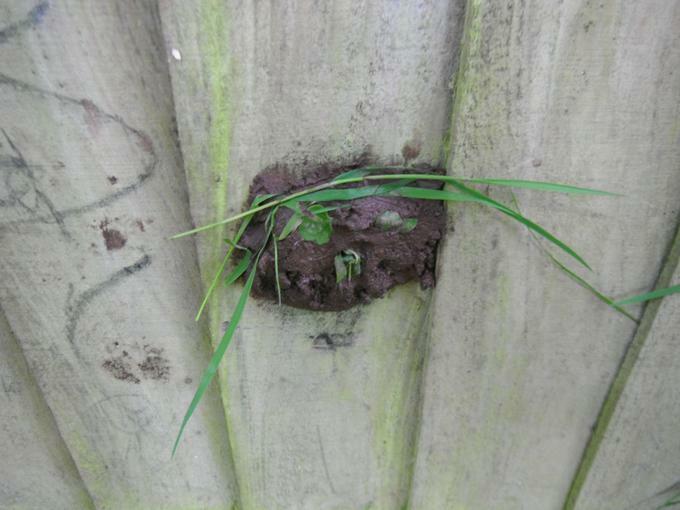 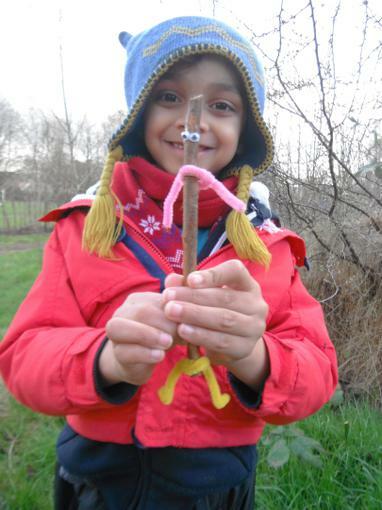 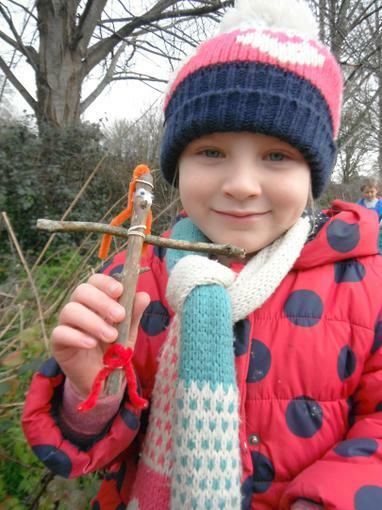 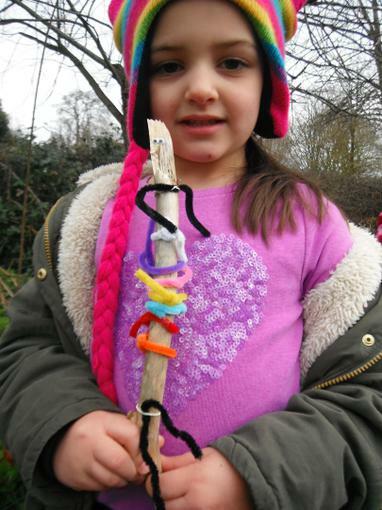 give children an understanding of the safety measures needed around matches, candles and fire. 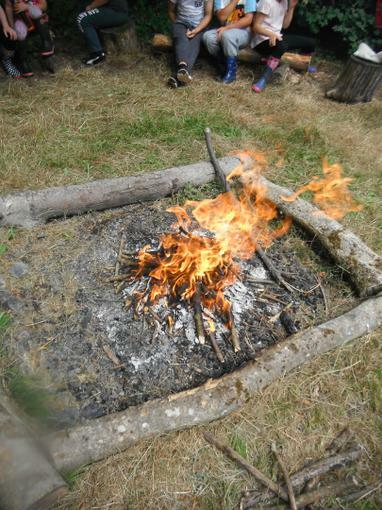 The activity is a precursor to using a fire steel. 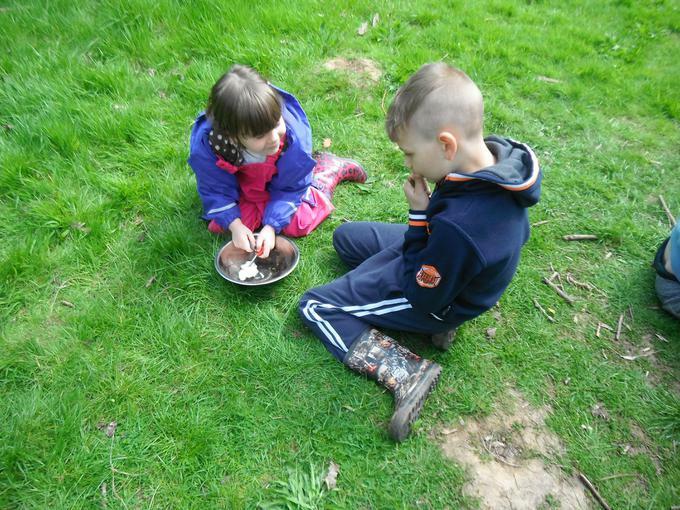 We toasted marshmallows to make s'mores - yummy! 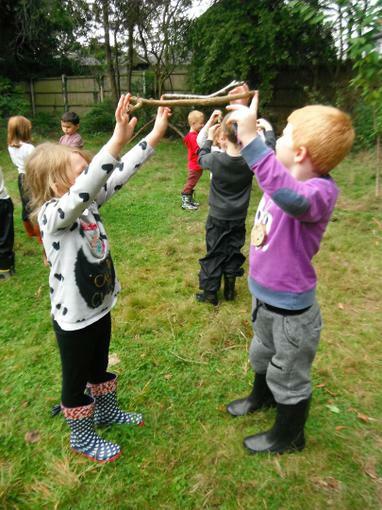 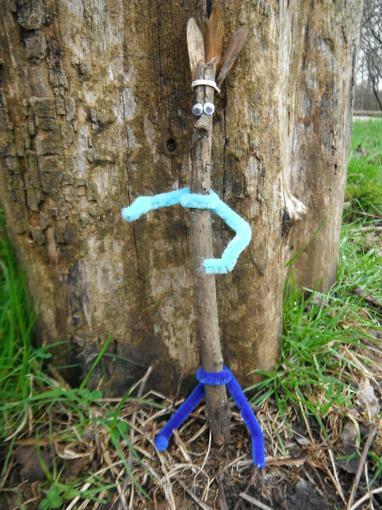 We played a game with sticks! 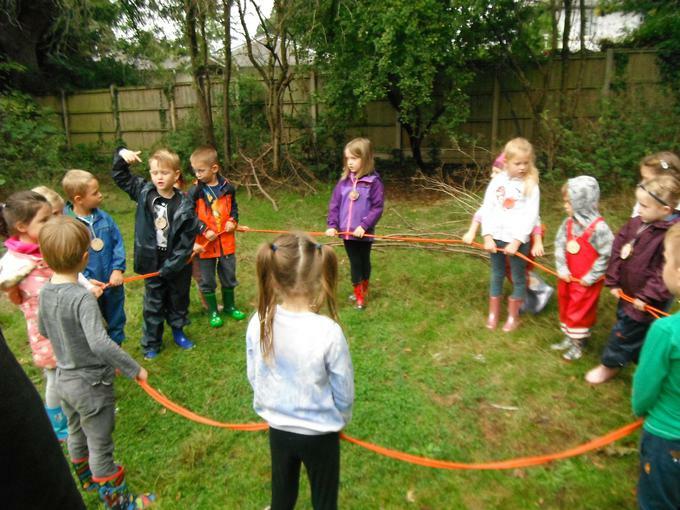 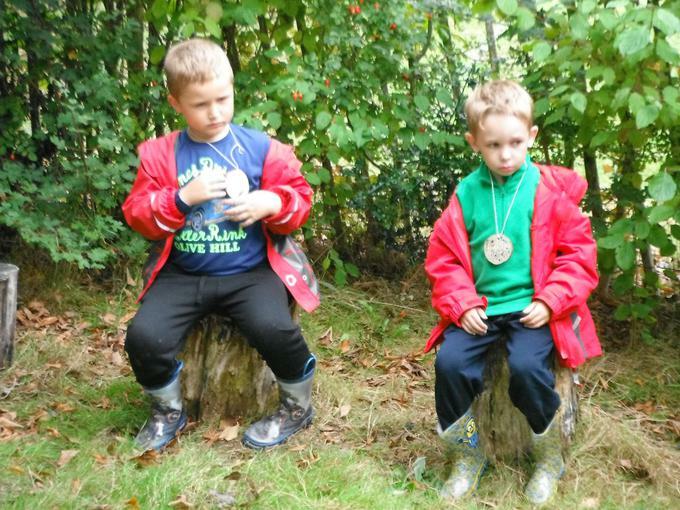 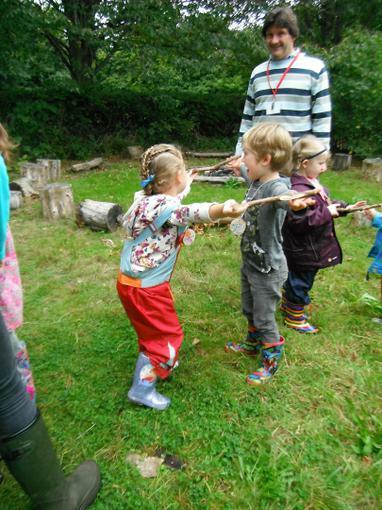 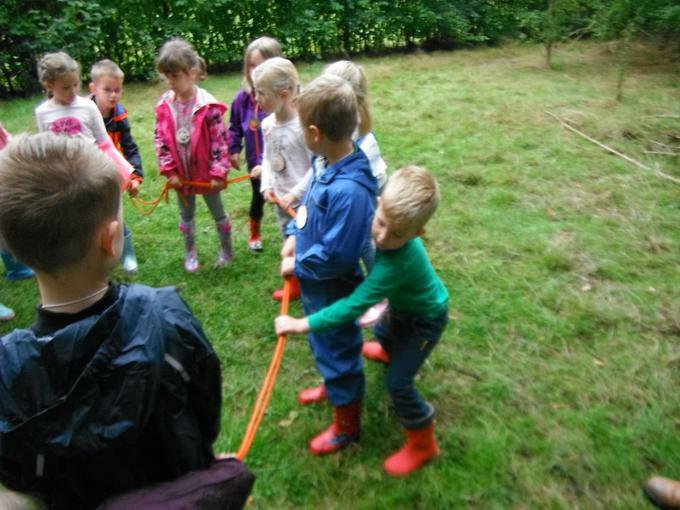 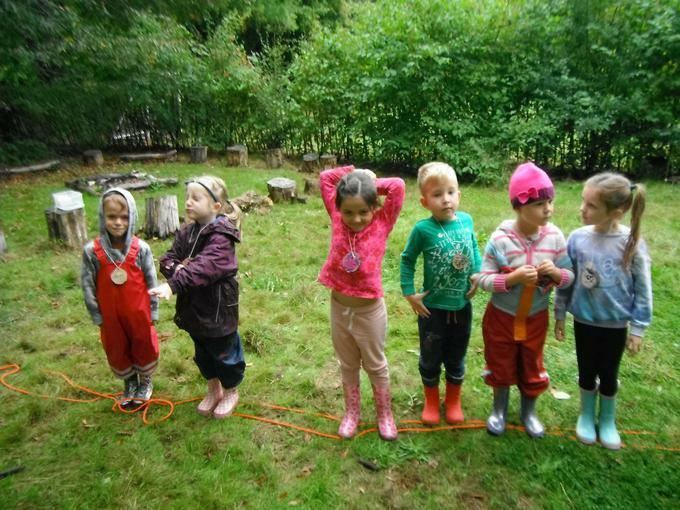 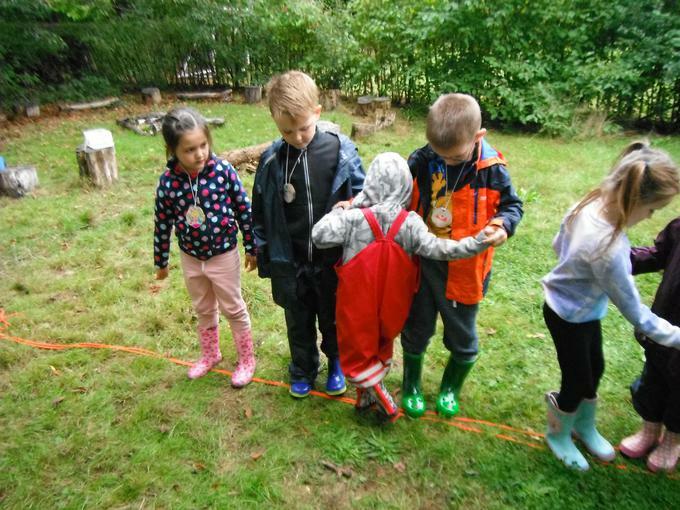 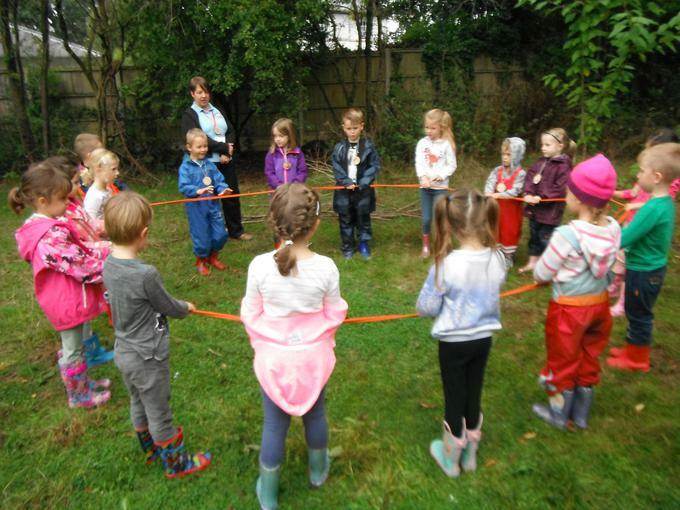 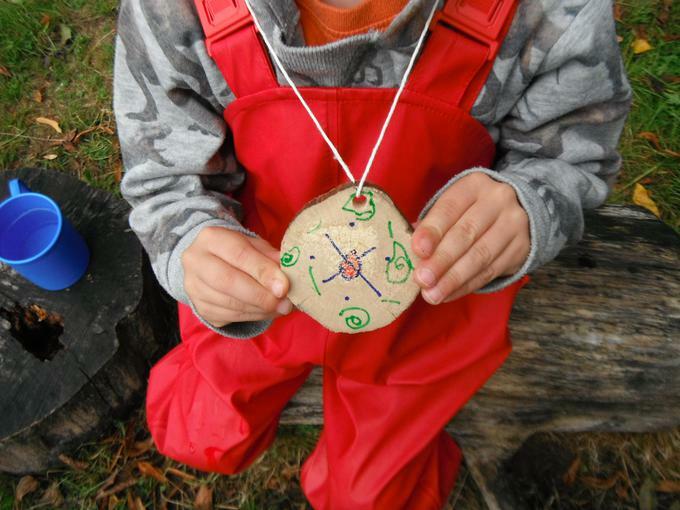 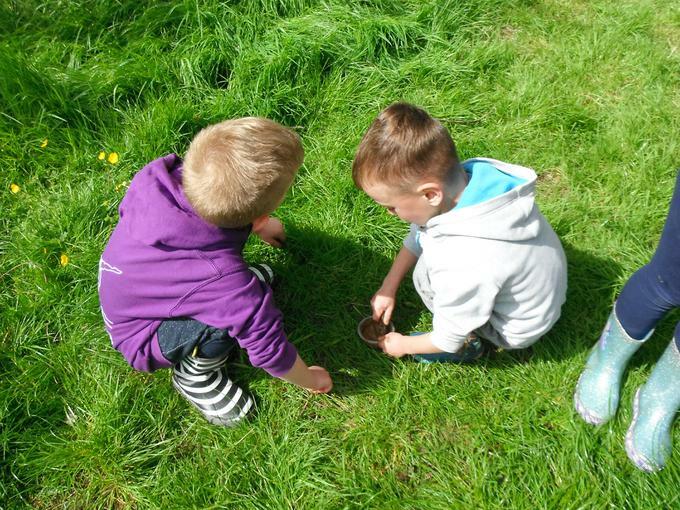 This game helps children learn about co-operation, communication and perseverance. 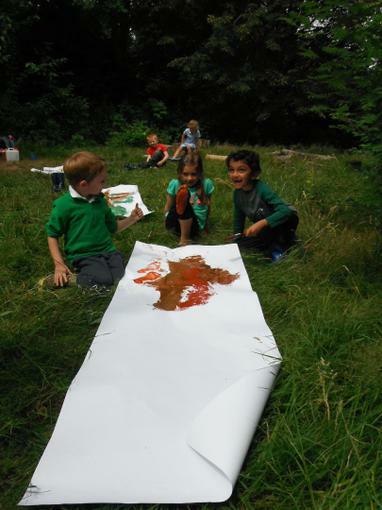 It's also good fun! 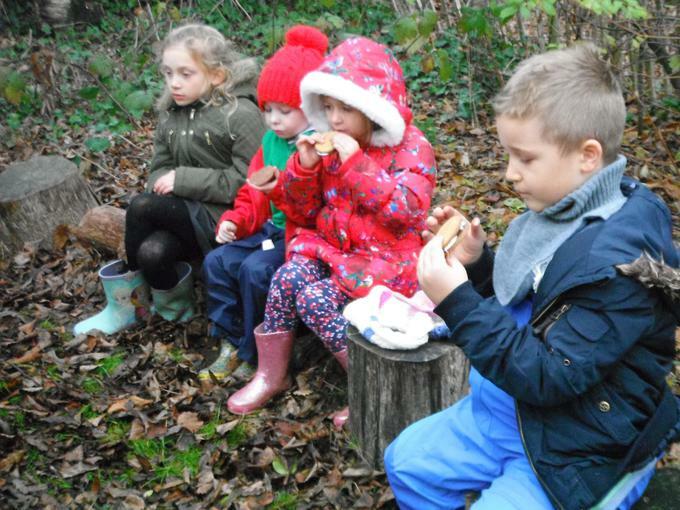 We made tree cookies - but you can't eat them!